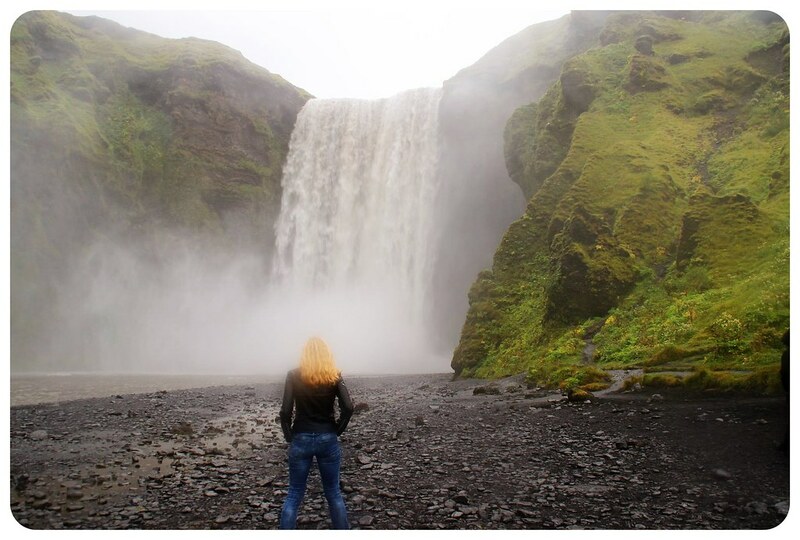 Visiting Iceland was a travel dream come true for me, and as soon as my friend and I had bought our plane tickets, we started looking into planning the logistics of the trip. Which places did we want to see? How would we get there? And where would we stay? It quickly became clear that the places we were most excited about were quite far from one another: The Golden Circle with its geysers and breathtaking waterfalls, the extraordinary Jökulsárlón Glacier Lagoon in the south, the fjords on the east coast, the lava fields in the north, and Snæfellsnes peninsula with its active volcano in the west of the country. Once we started researching the practicalities, we quickly came to realize that the best way to see Iceland would be by car. 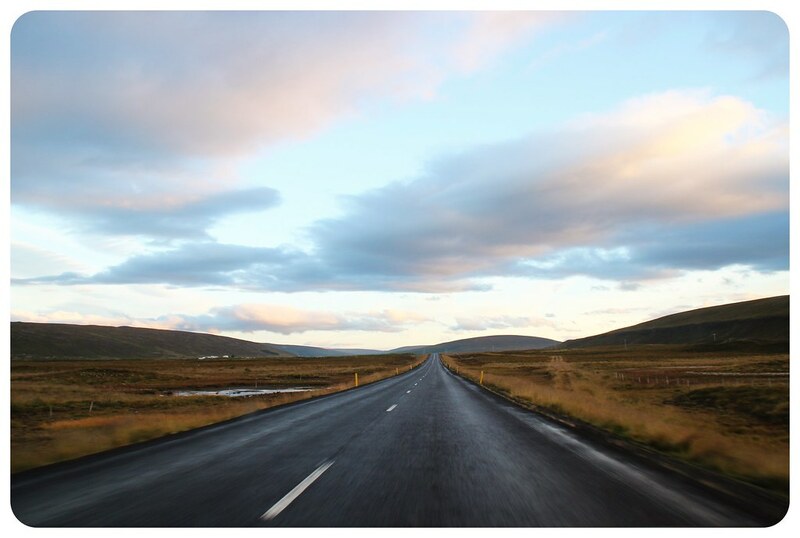 The Ring Road is a 828 mile (1332 km) long road that encircles the entire island, and driving it is the most convenient way to see as much of Iceland as possible. 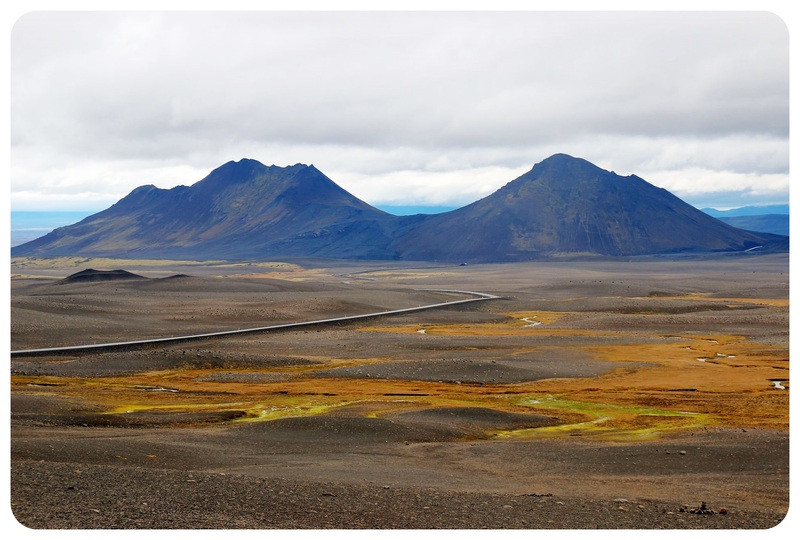 Not only does the Ring Road go around the entire country, but it also lets you see all of the things that you’d want to see on a trip to Iceland: geysers, glaciers, volcanoes, fjords, waterfalls, lava fields, Icelandic horses, hot springs, and of course, the dramatic landscapes Iceland is famous for. 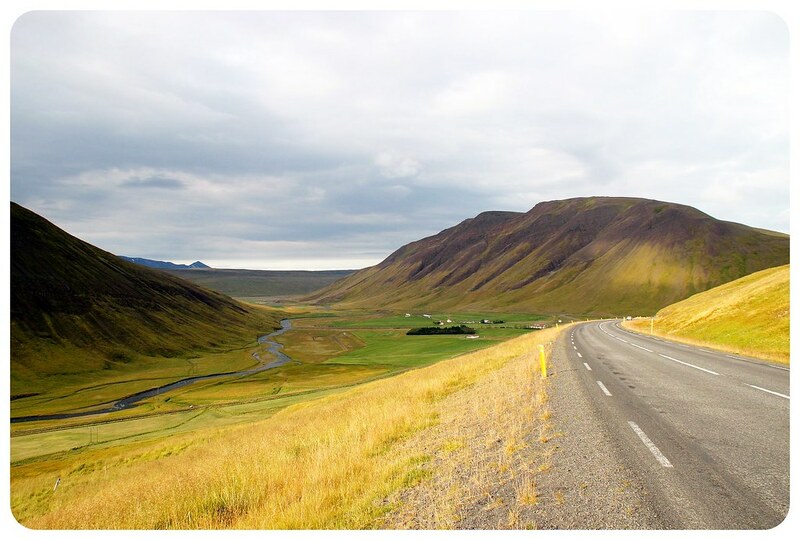 You can drive the entire circle of the Ring Road in seven days, but ideally you should allow yourself ten days to be able to include detours to the Golden Circle (a 190 miles/300 km route off of the Ring Road that is famous for its massive waterfalls, geyser fields and Kerið volcanic crater) and Snæfellsnes peninsula in Western Iceland. 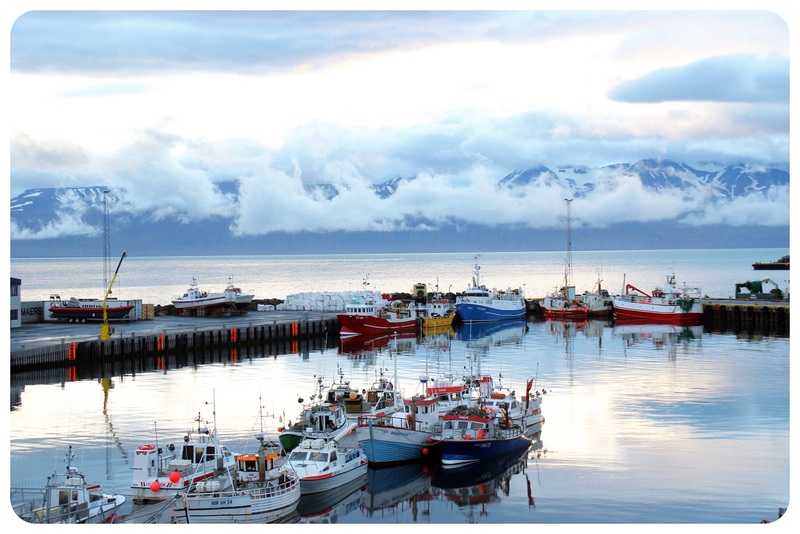 We ran out of time for the latter because we only had eight days, and we also didn’t have time for a glacier hike or for a whale watching boat trip which I would’ve liked to do in Husavik, the main whale watching spot. “It’s not about the destination. It’s about the journey to get there.” There couldn’t be a more fitting quote for Iceland, where it is impossible to get bored on a road trip. The scenery is utterly fascinating, not matter where you are, and it changes so frequently that it often feels like you’re on a different island altogether. We were so grateful that having the car allowed us to stop wherever we wanted – and we must have pulled over at least half a dozen times every single day, just to snap some pictures. This freedom alone was worth every single penny we spent on the car rental. In addition, it also enabled us to change our route on a whim whenever we felt like it. While we had a rough route mapped out, we ended up adding a few additional places to our journey, something we were only able to do because we had the car. Car rentals in Iceland are very reasonable, by the way – at EasyTerra Car Rental, a small car starts at €30 per day, and a medium-size car around €40 per day, including excess cover and unlimited mileage. The most important reason why we opted to rent a car was that it turned out traveling around Iceland without a car is quite difficult. Yes, there is public transportation, but the buses that connect the towns around the island don’t run very often, so you always have to plan around the bus schedule, and sometimes there are only two buses a day. If you only have one week to explore Iceland, you don’t want to waste your time waiting for the bus. Another option would have been to join an organized tour, but that would have taken away from the flexibility of stopping wherever we wanted to, as mentioned in #2. I wouldn’t have wanted to miss out on the chance to stop whenever we felt like it, including scenic lunches and an impromptu beach stop in search of puffins (which sadly, we didn’t see). An organized tour is great because you don’t have to plan anything and you know everything is taken care of, but it doesn’t give you the chance for these spontaneous stops. 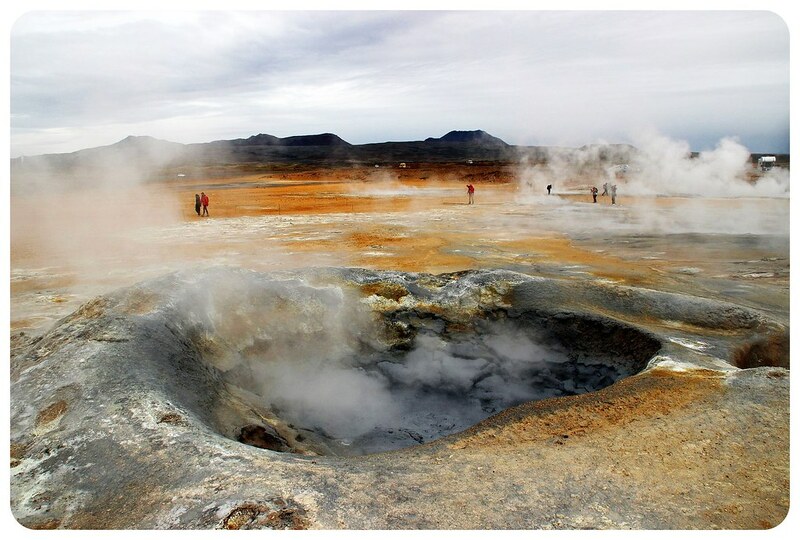 Even when we drove the Golden Circle, a route that most visitors do as an organized day trip from Reykjavik, we added a couple of extra stops, and not only that – we were also able to start at what is the last stop for the tour groups, which means we avoided big crowds completely. Write down all of the places you’d like to see while in Iceland and how much it will cost you to get to each one with an organized tour. You’ll quickly realize that the cost of a rental car is actually not more expensive than a tour. Driving in Iceland is easy in the summer months, but it can be challenging in the winter months. The roads only have two lanes (one in each direction) but the traffic is not bad – especially if you go during shoulder season. 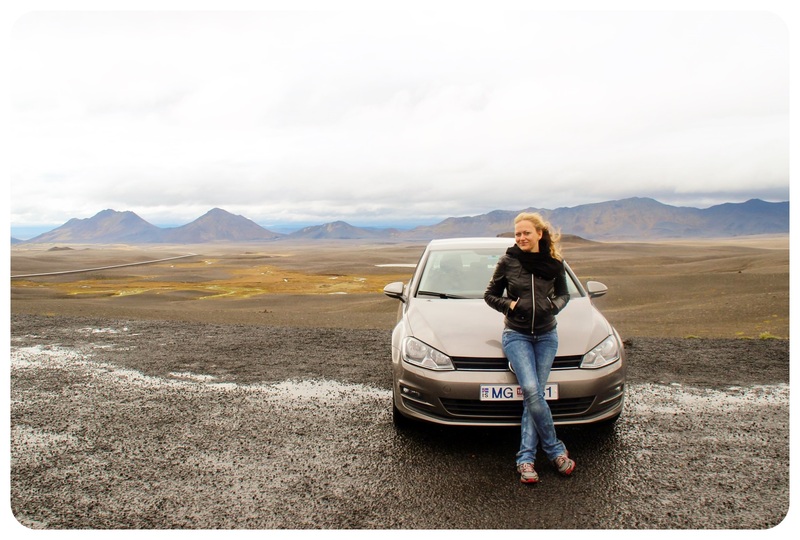 I shared my tips for driving in Iceland in this article, including thoughts on 4WD vs. a regular car, the best app to use, GPS and maps, and other things you should know. 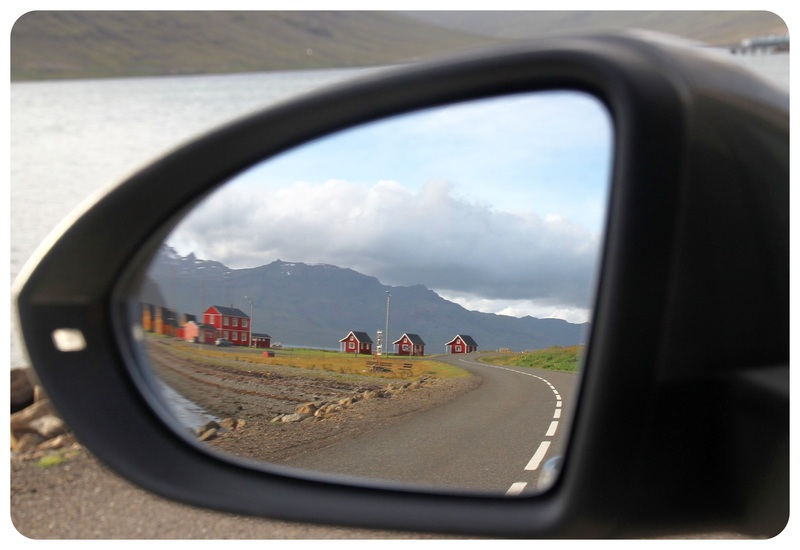 There are plenty of car rental companies in Iceland, for example EasyTerra, but make sure to book your rental car in advance, because during high season, car rental companies have run out of cars in recent years, and you don’t want to be left stranded without a vehicle. Steaming geysers, thunderous waterfalls, breathtaking canyons and vast lava fields – I saw more stunningly beautiful places in my week in Iceland than in any other country in such a short time. But my favorite place? None of those. 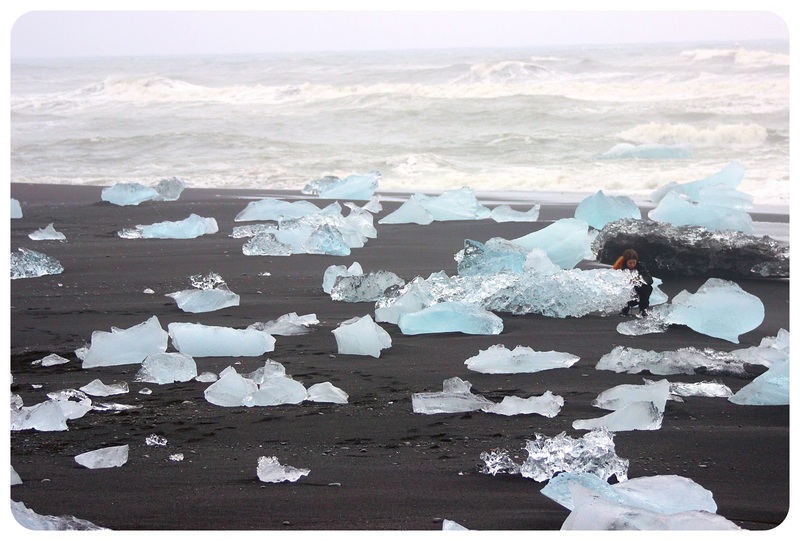 My favorite destination was the place that puts the ‘ice’ in Iceland: Jökulsárlón, Iceland’s most famous glacier lagoon, and even more so Diamond Beach, just across the street from the glacier. When I parked our car in the little car park right on the black sand beach, I understood immediately why it was called Diamond Beach. 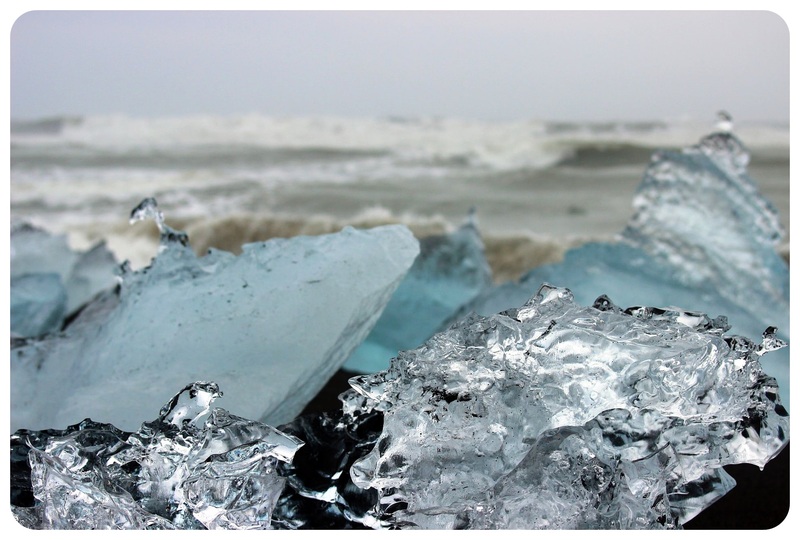 Like bright diamonds in different shapes and sizes, dozens of chunks of ice litter the beach, giant waves crashing against them, moving the smaller ones around, forcefully repelled by the bigger ones. 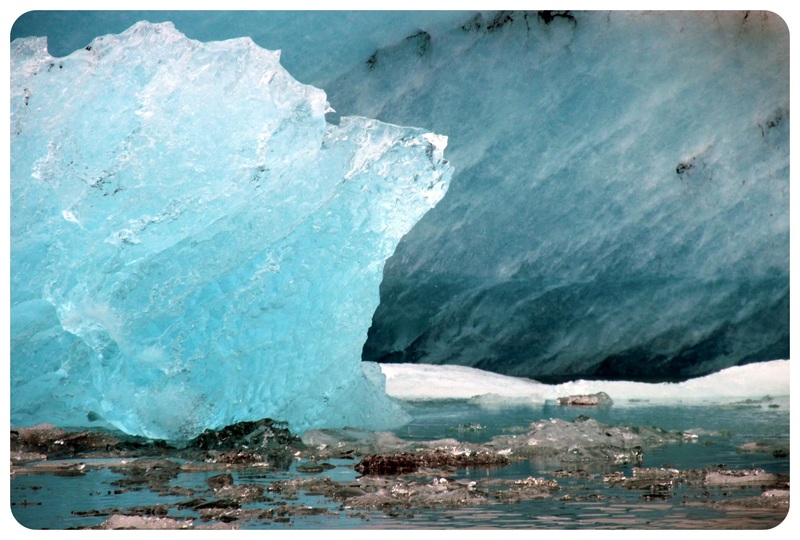 Walking towards the water, I started seeing more icebergs floating around in the ocean, being tossed around by the waves as if they were merely paper boats and not bulky chunks of ice. It was a spectacular sight, and I don’t think there’s anything like Diamond Beach anywhere else in the world (correct me if I’m wrong!). 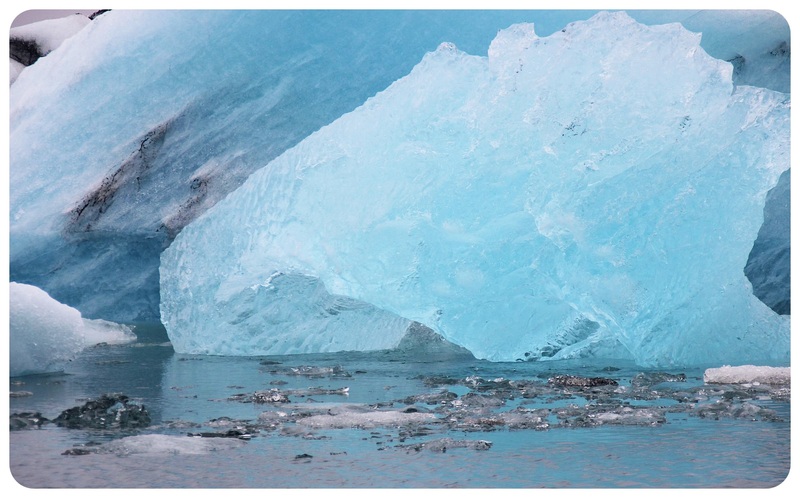 The icebergs in the water are chunks of ice that have broken off the glacier and then slowly floated down towards the ocean, through the lagoon and the short river that connects the glacier lagoon with the open sea. 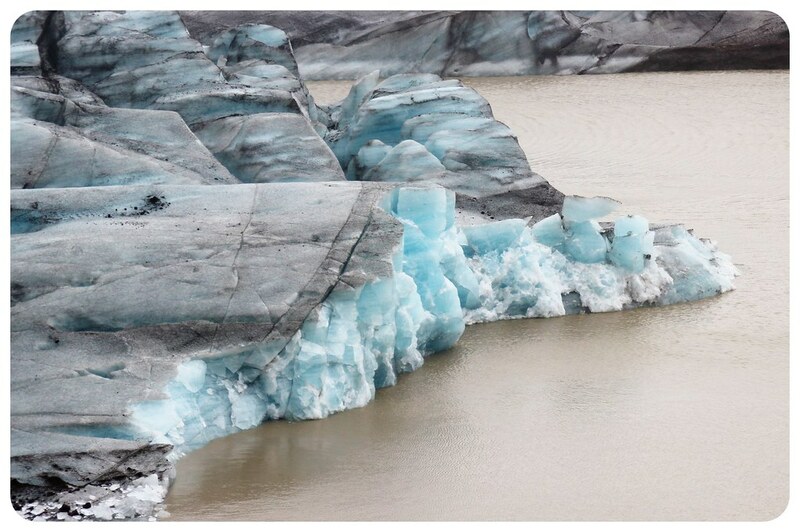 The lagoon was formed by the receding Breiðamerkurjökull glacier, of which massive chunks of ice break off regularly. There are dozens of them floating in the lagoon before they slowly glide out into the ocean. 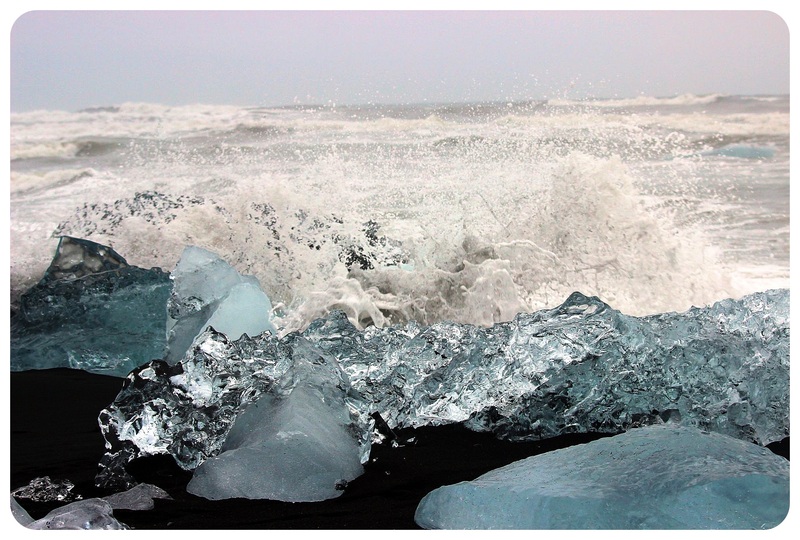 Even though the sea is cold, the water here is warmer than in the icy lagoon, so the ice chunks are thrown around and smoothed by the waves, and eventually they are thrown back at the beach. 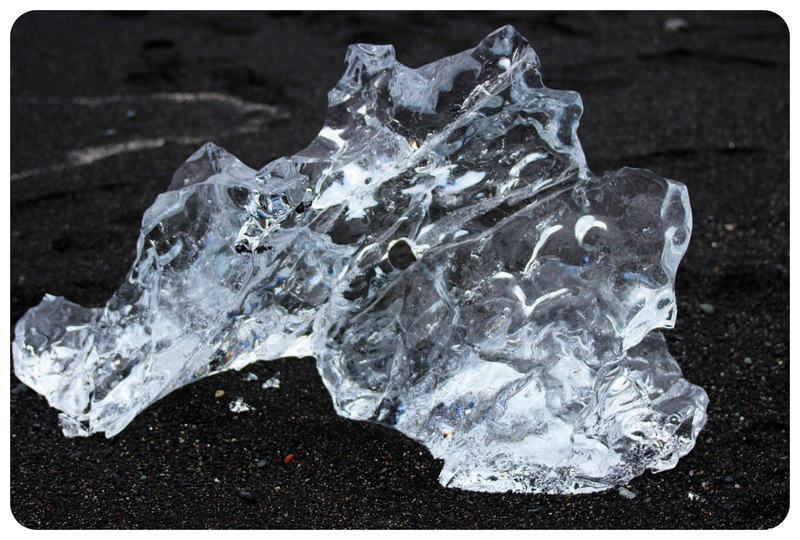 You can’t help but wonder how old the ice is that has been washed ashore – these pieces had been part of the glacier for centuries! There aren’t two days when this beach looks the same. 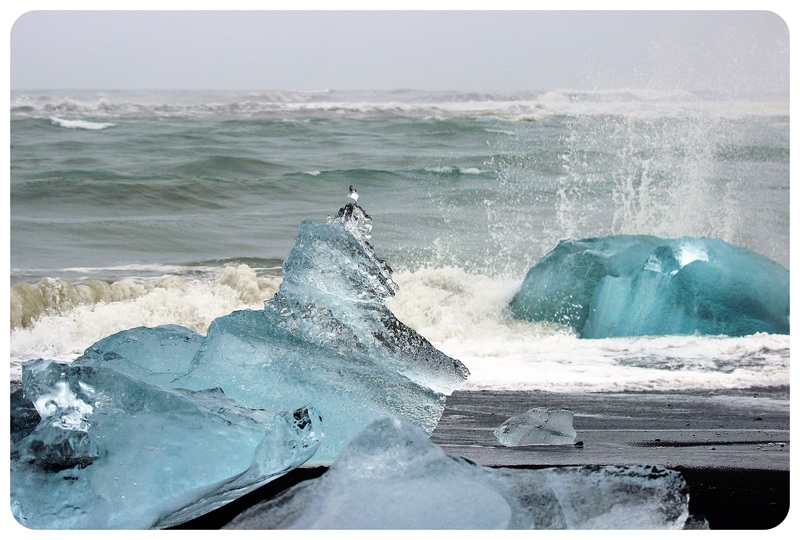 Every day, new chunks of ice arrive and others melt, and all of them are changing their shapes all the time during the melting process and the constant washing of the waves. 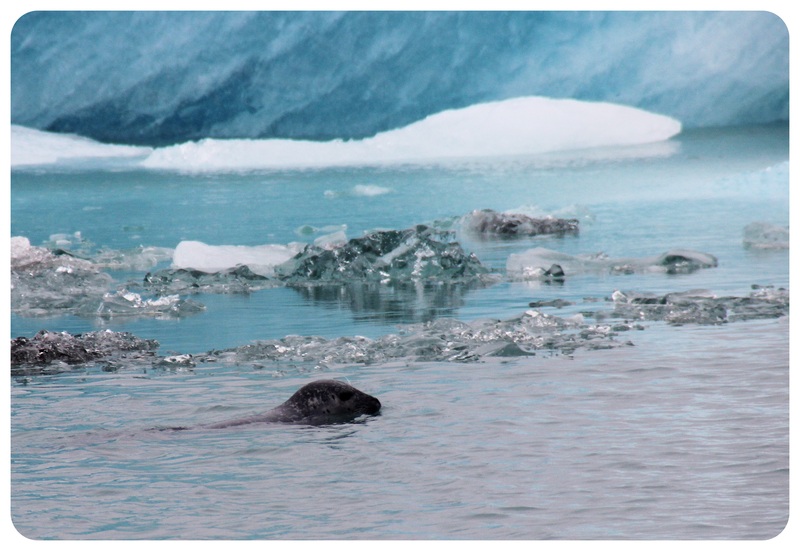 Back in the lagoon, in between the ice chunks, you can spot seals that make their way into the lagoon from the ocean, curiously inspecting the massive blocks of blue tinted ice. 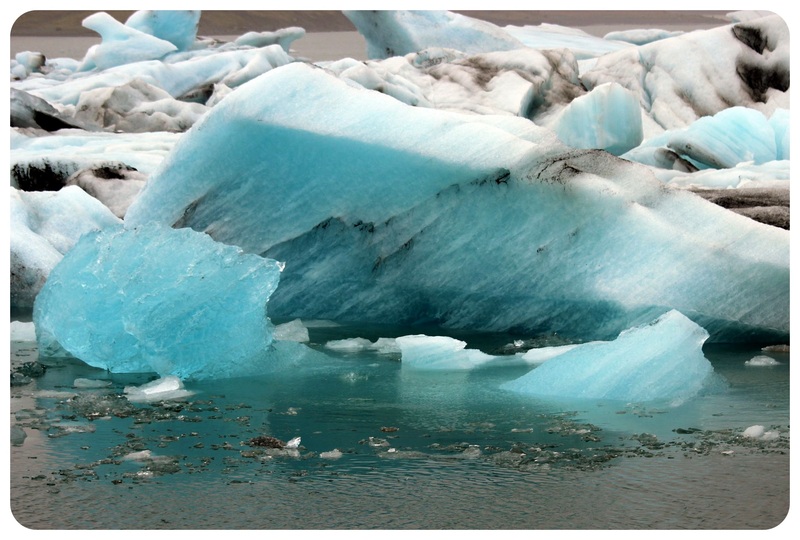 The light blue color of the ice was one of the most fascinating things about Jökulsárlón – the only other place I’ve seen ice like this was at Puerto Moreno Glacier in Argentina. 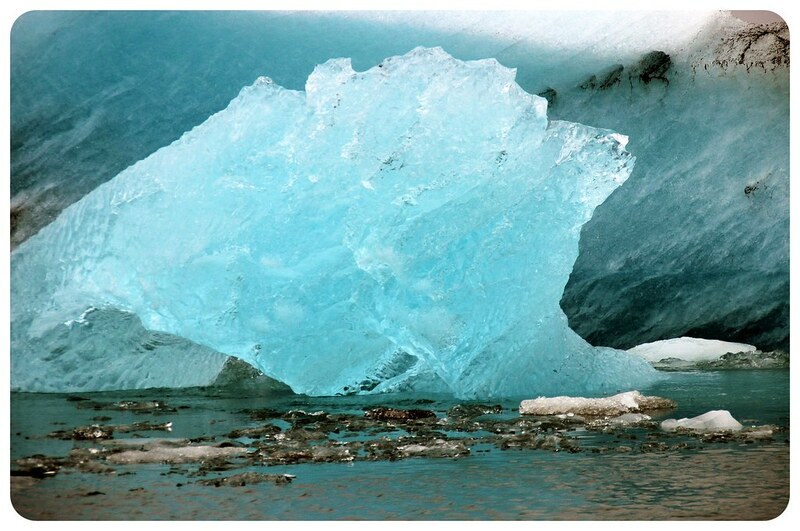 You often only see a tiny fraction of the entire iceberg – the bigger part is usually underwater. Some of them are as big as small houses! 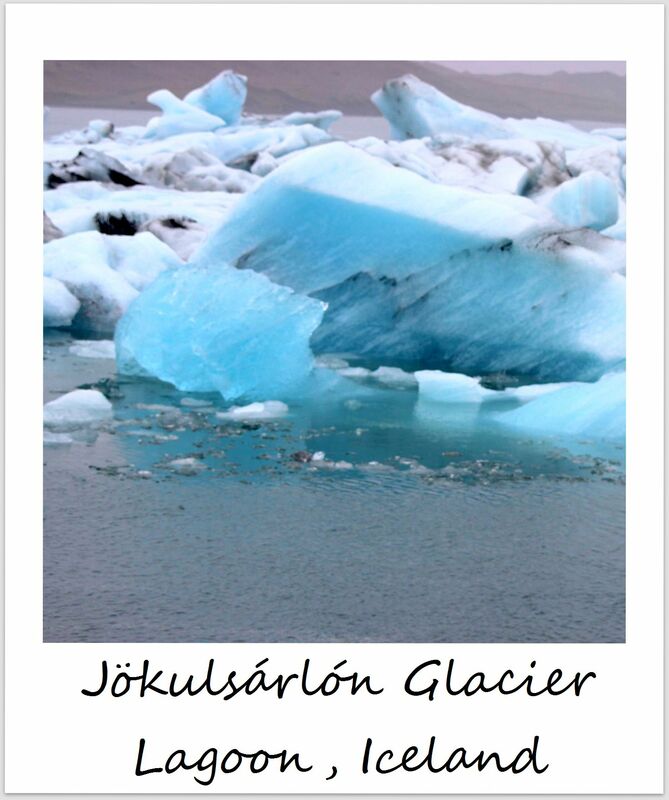 Jökulsárlón translates to ‘glacial river lagoon’ and only appeared in 1935, due to the melting of Breiðamerkurjökull glacier. 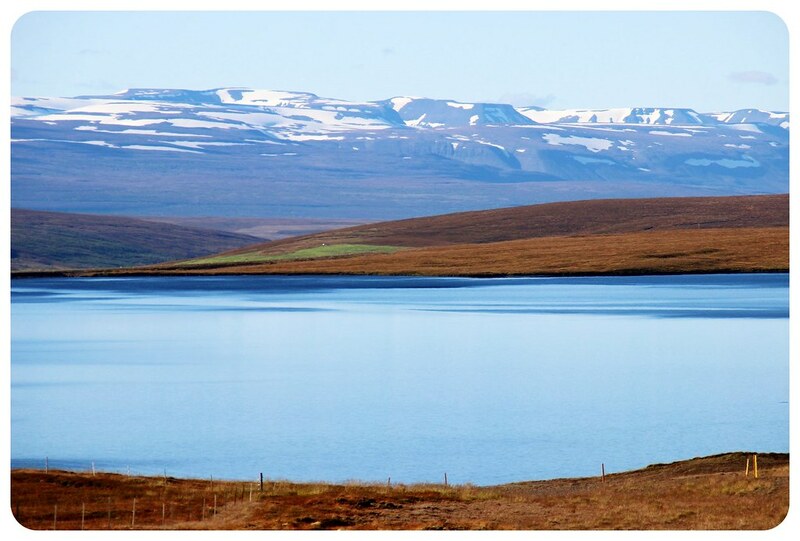 Over the years, it has become Iceland’s deepest lake, currently 814 feet (248 meters) deep. 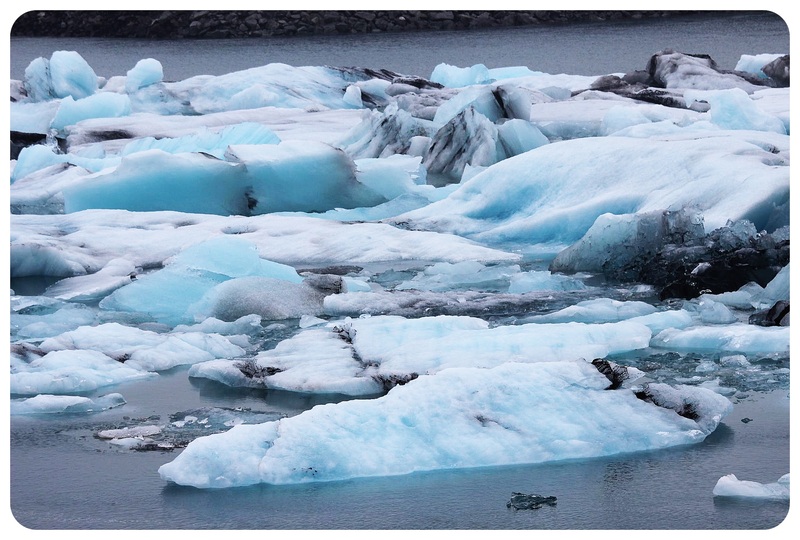 The lagoon has grown fourfold since the 1970s, to give you an idea of the current rate at which Iceland’s glaciers are melting. Jökulsárlón and the Diamond Beach are the one place in Iceland that I really want to return to – with more time to photograph this spectacle, ideally during the winter months, when the sun rises late and sets early. Because apparently, seeing this place during sunrise (the sun rises over the ocean) is even more magical. 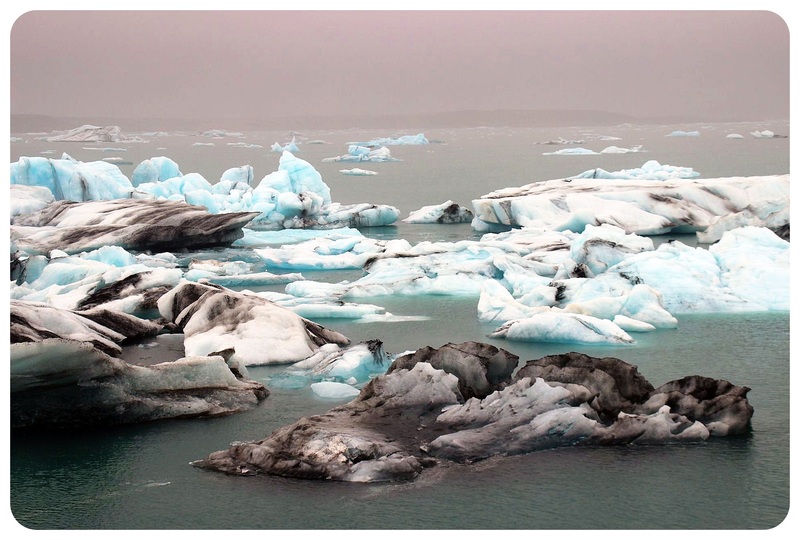 How to get to Jökulsárlón from Reykjavik: There are organized tours from Reykjavik to Jökulsárlón, but renting a car would be preferable, especially if you want to take your time to take photos. The drive from Reykjavik takes just under five hours (231 miles/372km), and from Vik, just over two hours (119 miles/192km). 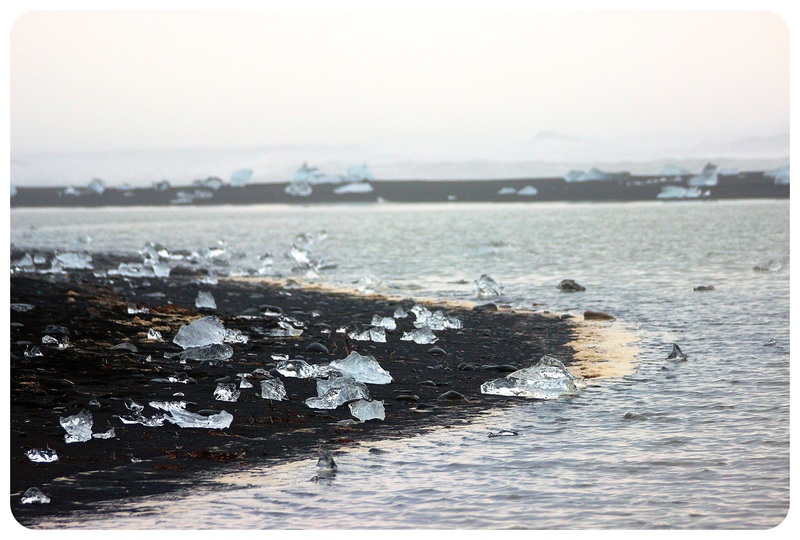 If you’re driving Icleand’s Ring Road (Highway 1), you’ll pass Jökulsárlón anyway – the lagoon and the beach are literally a stone’s throw from the road. If you’re driving all the way from Reykjavik, plan some extra time for the drive because you’ll want to stop several times along the way to photograph waterfalls, black sand beaches and the breathtaking Icelandic scenery – trust me. It’s a lot of time in the car for a day trip, but it can be done, if you are pressed for time. Take into consideration though that in the winter time daylight is limited to six hours, so you’d be driving in the dark for most of the time, and roads can be icy. 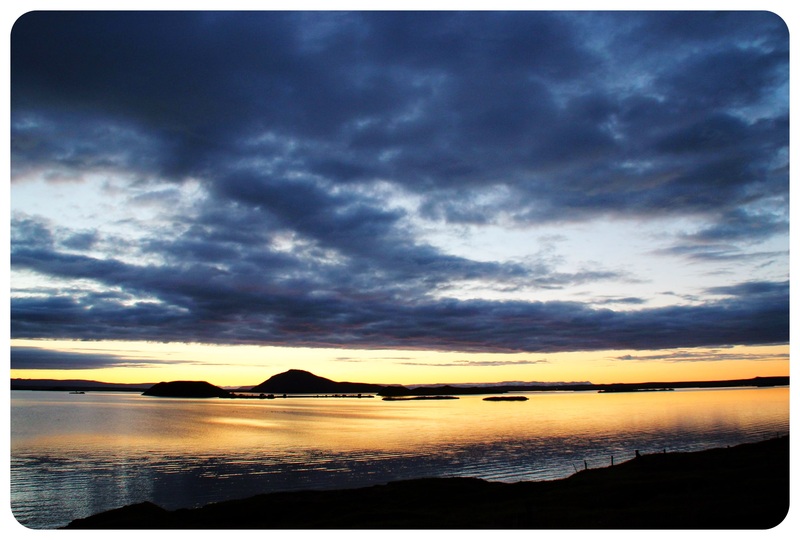 In the summer months you’ll be driving back to Reykjavik in daylight even if its 9 or 10pm! Also remember that in Iceland the weather is extremely unpredictable and can change rather quickly. 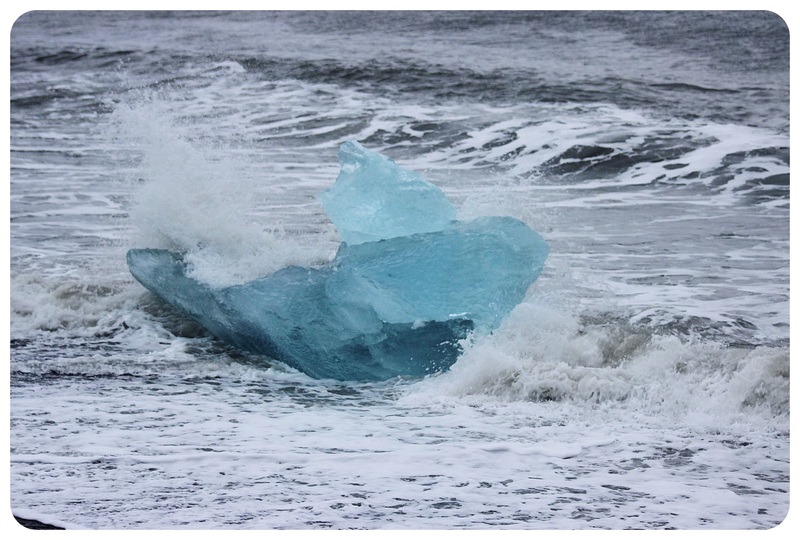 Other things to consider: Be careful when you photograph the icebergs right by the water – the waves can be quite high and unexpected, and several people got their cameras wet (I almost lost my phone when a wave caught me unexpectedly, and both of us got wet feet!) During the summer months, you can take a boat ride across the lagoon. That’s something I’d definitely want to do when I return to Iceland. There are two kinds of boat rides – an amphibian boat (35-40 mins, ISK5,000/US$40), and a zodiac boat (45 mins, ISK8,500/US$69), that goes almost all the way to the glacier. There is a small café in the car park of the glacier lagoon – after a couple of hours of photographing or simply marvelling at the lagoon and the ice bergs on the beach, it’s nice to be able to warm up with a cup of coffee or a hot chocolate. 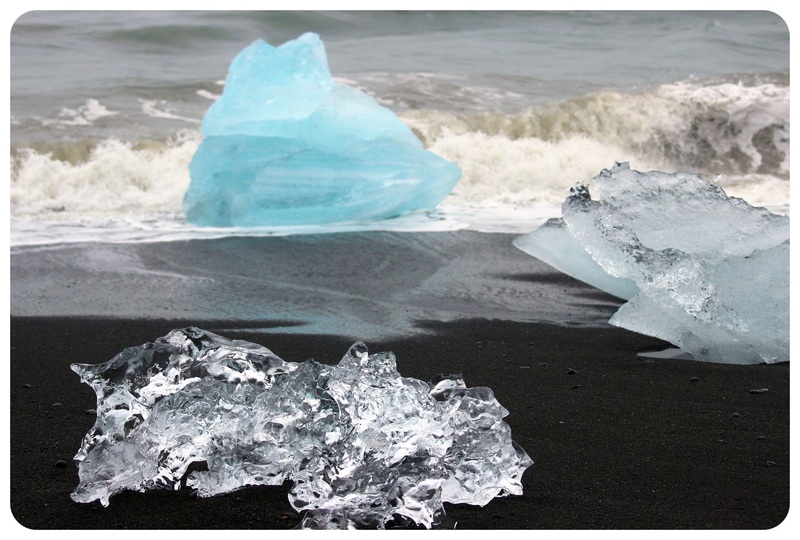 Allow about two hours to visit both Jökulsárlón and Diamond Beach. If you’re a photographer, you’ll probably want to plan even longer than that. Make sure to dress accordingly, there’s an arctic breeze here, especially on the beach, that’s quite chilly. This would be an example for what NOT appropriately (i.e. warm) dressed looks like! All images were taken on the Highlights Of Iceland self-driving tour by Icelandic Farm Holidays. 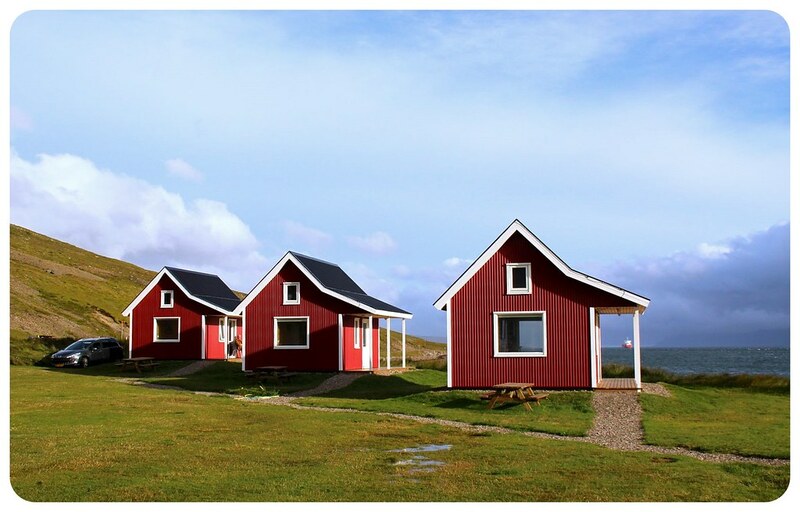 Icelandic Farm Holidays provides you with a rental car and an itinerary for every day, but you can decide individually how much time to spend in each suggested stop, or add additional ones. 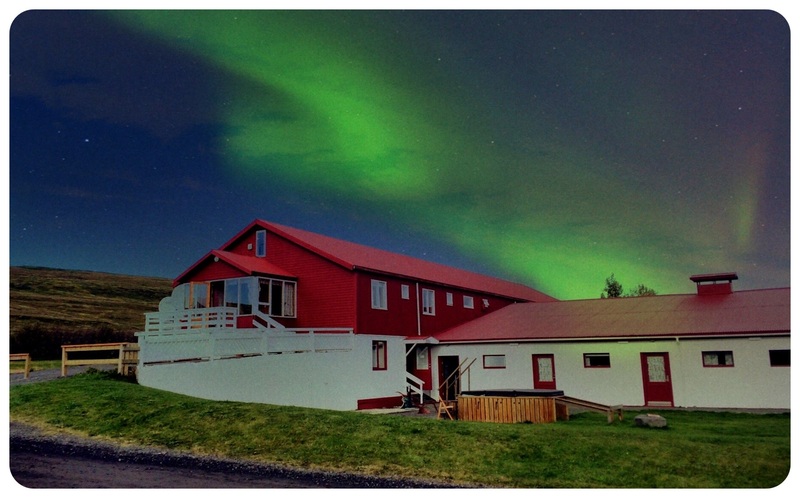 Accommodation is provided in a mix of Icelandic farm houses, B&Bs and hotels. After driving the Golden Circle with its geysers and stunning waterfalls, traversing southern Iceland with its glaciers and black sand beaches, and marveling at the Eastern fjords, I wasn’t sure if the north of Iceland could top what we’d seen so far. But of course it could – this was Iceland after all, where you have scenic vistas everywhere you look. Ultimately, the north was the part of the country that had the highest density of awe-inspiring sights, and I am glad that our self-driving Iceland itinerary included a detour off the Ring Road which brought us to the Myvatn Peninsula. Most of the places that I consider highlights of northern Iceland are located on this little peninsula – like the grand Godafoss waterfall, the furiously fuming geothermal fields of Hverir or the rock formations of Dimmuborgir. Because there are so many things to see in this area and because we also wanted to enjoy some hot springs (we opted for the Myvatn Nature Baths instead of the Blue Lagoon – I’ll be sharing why later on), we decided to spend an extra night in the Husavik area instead of moving on the very next day, like we’d done in all the other places we spent the night at. After driving through the vast barren landscape that is the Möðrudalur valley, a place that is completely uninhabited and that made us feel as if we were driving on another planet, we left the Ring Road and turned right onto Road 864, which would bring us to Dettifoss waterfall, Asbyrgi Canyon to the fishing village of Husavik, and finally circle back down towards the Ring Road, to the small village of Laugar where we’d spend the night. Upon leaving the Ring Road, we found ourselves on an unpaved road – the first time on our trip. 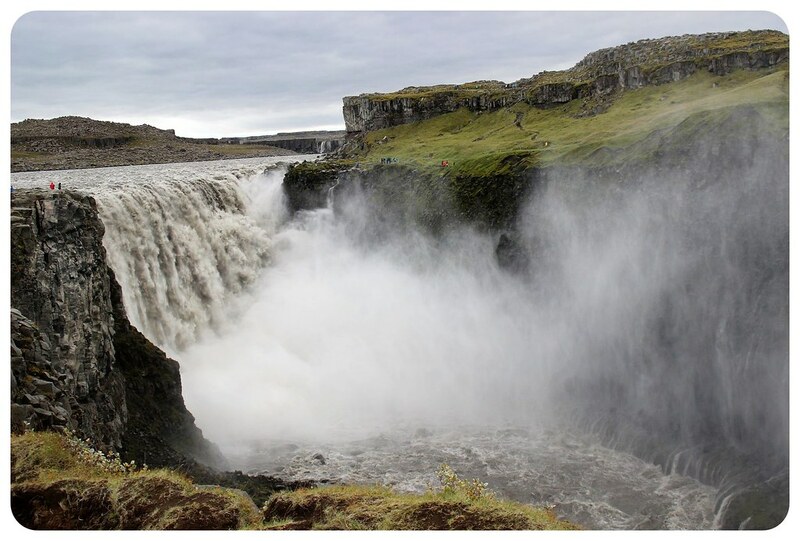 I was surprised that the road to an attraction as big as Dettifoss wasn’t paved, but our Volkswagen rental did a great job, and renting a bigger car was absolutely not necessary for our route. 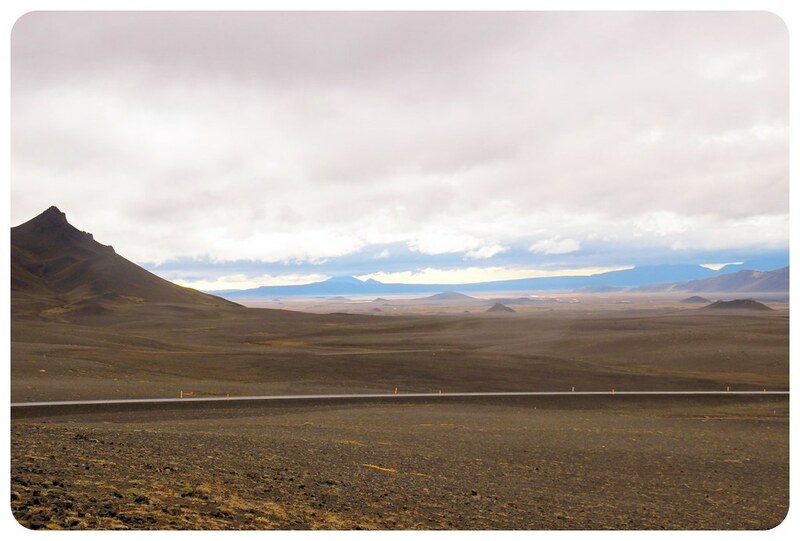 Driving through no man’s land for hours made me realize what a sparsely populated country Iceland is – and without cell phone reception and barely any cars passing us I was praying to the vehicle gods that I wouldn’t get a flat tire up here. Who knows how many hours we’d have to wait until another car would come to our rescue? And we were glad that we had carefully read the itinerary Icelandic Farm Holidays had provided us with, which breaks down day by day where you go and what you see, and that had warned us to fill up the tank because we wouldn’t pass a gas station for many, many miles – so we had made sure to fill up again at the gas station in Egilsstaðir, the last one before the desolate Möðrudalur Valley. The part of the drive along the unpaved road, after Möðrudalur Valley, was probably the least exciting of the entire trip, but that’s where my iPhone came in handy, which I had not only loaded with podcasts, but also with Aziz Ansari’s Modern Romance audiobook, and which kept us entertained during the many hours we spent in the car. 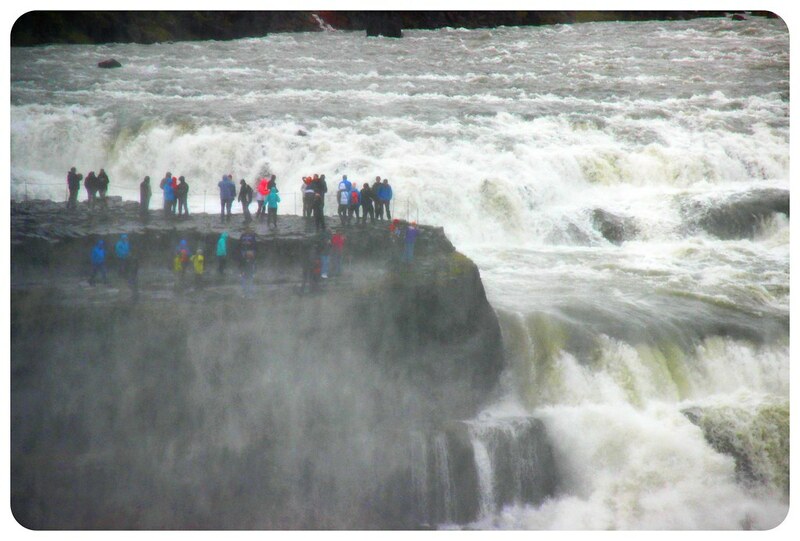 And finally there it was, the turn-off for Dettifoss, Europe’s most powerful waterfall. The enormous power of the waterfall was palpable as soon as we got closer. 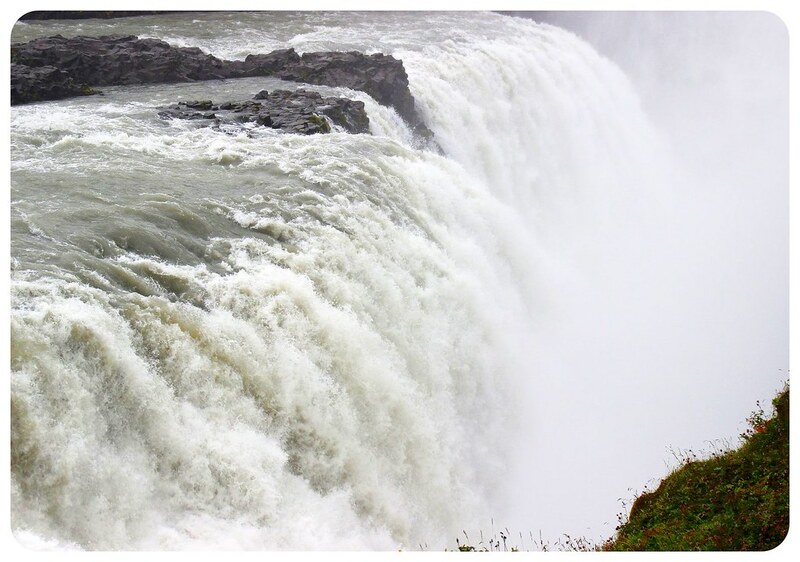 Every second, over 96,000 gallons (363,400 liters) of water plummet from the top of the falls to the bottom, onto the steep rocks that border the waterfall on both sides. Dettifoss, 148 feet (45 meters) high and 328 feet (100 meters) wide, wasn’t anything like the other waterfalls we’d seen in Iceland so far – until the very end, we never got tired of seeing waterfalls. I also loved the Jökulsa Canyon, through which the Jökulsá á Fjöllum river runs. 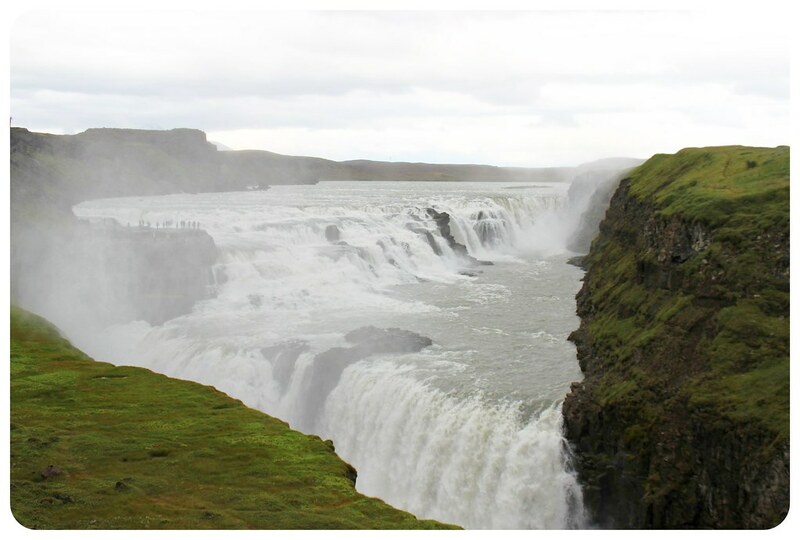 If we had more time, we could have gone for a walk along the steep cliffs of the canyon and enjoyed not only the views of Dettifoss, but also Selfoss, which is located just a few hundred meters upstream, and Hafragilsfoss, about two miles downstream from Dettifoss. To see all three waterfalls in one hike, plan on about three hours. The hiking paths along the gorge are clearly marked. 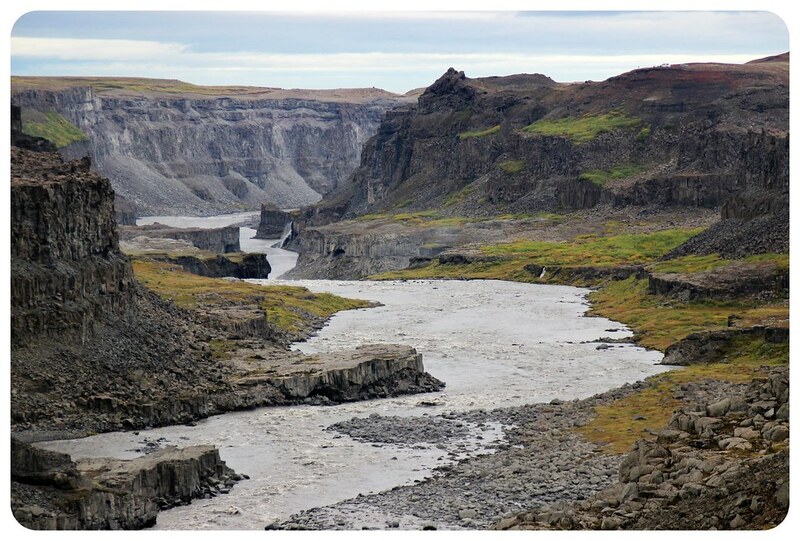 From here, it was onwards to Asbyrgi, a horseshoe shaped canyon, over 2 miles (3.5km) long, 0.6 miles (1 km) wide and 328 feet (100 meters) high. The canyon can be visited from above and from the bottom, and sadly we only made it to the bottom of the canyon, because it was getting too late and we still wanted to see the fishing village of Husavik before it got dark. 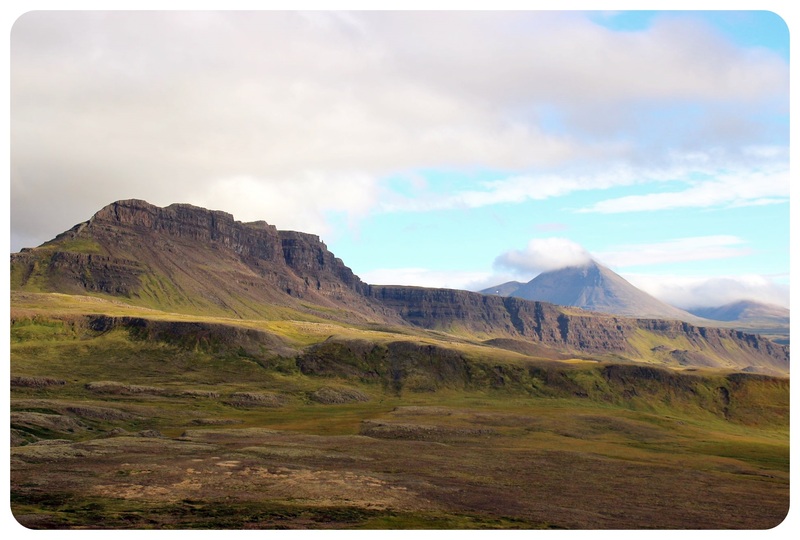 It would’ve been nice to have time to check out the hiking trails above the gorge, or you can even hike from Asbyrgi along Jökulsárgljúfur canyon all the way to Dettifoss, a two day hike that covers a total of around 22 miles (35 km). You can read more about that hike here. 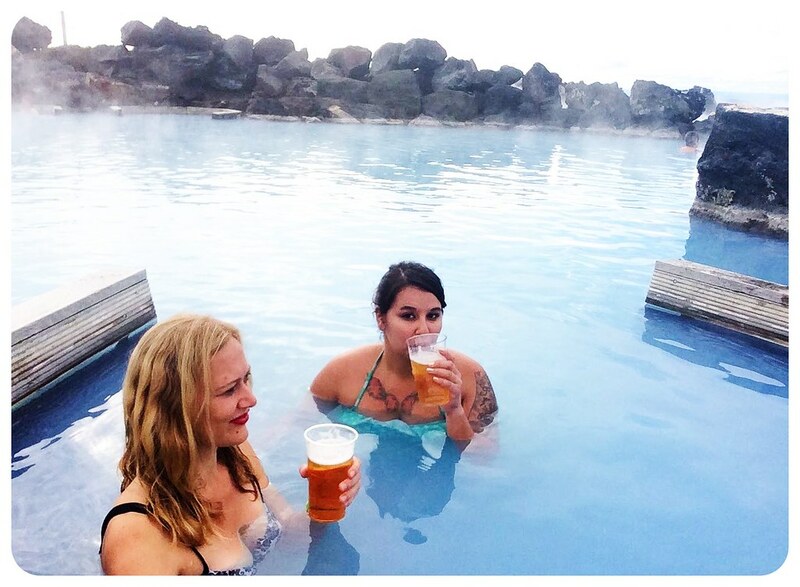 But if you only have a week to see Iceland, you have to sacrifice some things. Seeing the canyon from below was still impressive, and we enjoyed the weird quietness of the place when we did a short hike through the woods to the silent ponds Botnstjorn and Leirtjorn at the bottom of the steep cliffs. Another remarkable feature here was Eyjan, a colossal rock that rises up out of the ground across from the canyon. Only afterwards did I find out that it’s possible to climb Eyjan (follow the signs that say ‘Eyjan’ in the parking lot for the short hike there) for a panoramic view of Asbyrgi from the top of the rock. 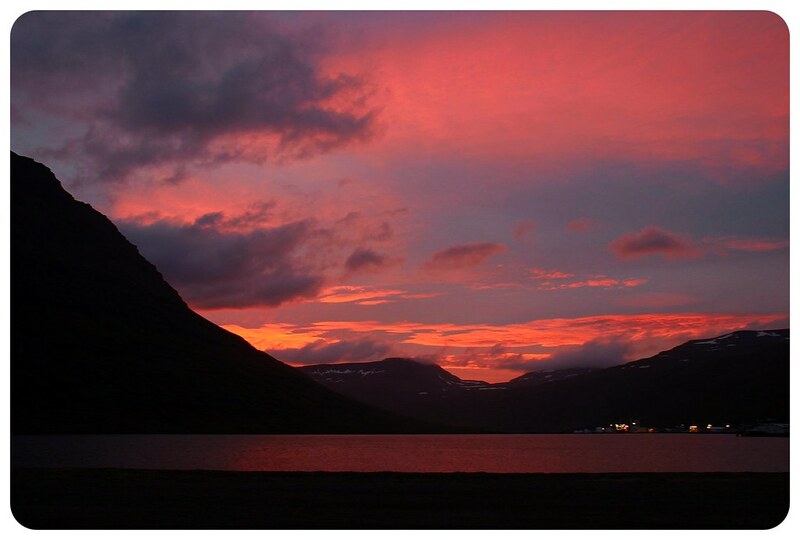 We reached Husavik just as the sun set. If you’re doing this drive during the winter months, when daylight hours are shorter, you might want to keep your roadside stops short or you will find yourself driving in the dark. 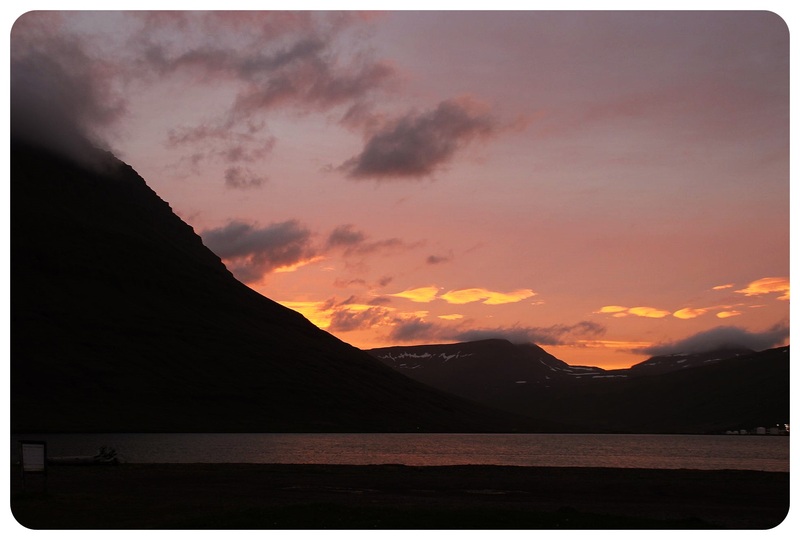 I found myself driving the last few miles from Husavik to Laugar in the dark which I was fine with because by now, we were driving on a paved road again, but I am not sure how I would’ve felt in the dark on the unpaved road we’d driven most of the day on. It was also here in the north of Iceland, in Laugar, where we finally saw the northern lights – it had been too cloudy the previous nights, and of course I was hoping to see the northern lights in Iceland! And when I peeked out of the window at around 12.30am, there they were, dancing right outside our window. I quickly woke up Rease and got dressed to photograph the lights outside. I ran to the car to grab my tripod, which I had lugged around for weeks just for this occasion, and in the process of setting it up, the little plastic holder for my camera broke off. There went my chance to photograph the Aurora Borealis. However, I couldn’t be upset about this for too long, because seeing these bright green lights dancing across the night sky was spectacular. I decided that it was much more enjoyable to simply take in this incredible sight rather than getting frustrated about my camera’s not-so-great night photography capabilities and missing out on the moment over trying to get some decent pictures. So yeah, this picture shows you what it looked like, but I can’t take credit for it (it is the farmhouse we were staying in). The next morning, we hit the road early, because even though we were staying in Laugar again that night, we had a busy day ahead of us. 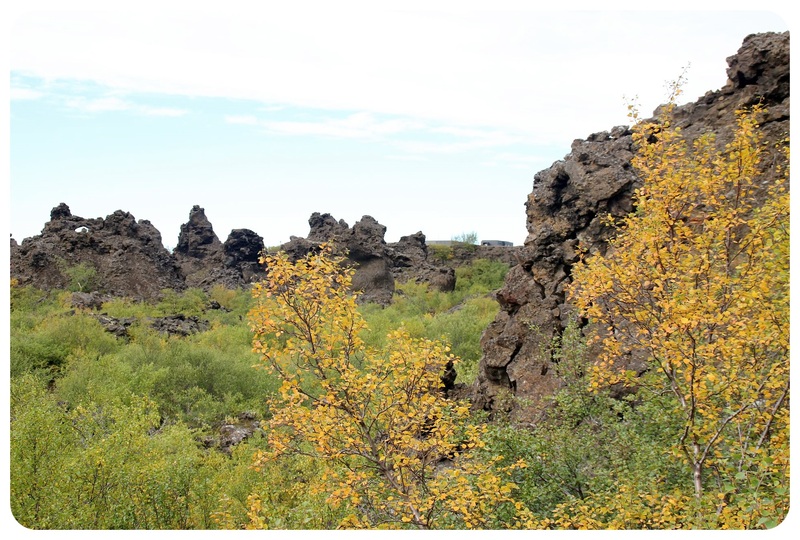 On our way to our first destination of the day, the Dimmuborgir lava field, we already pulled over three or four times for photo stops. We were circling Lake Myvatn, a big lake that was formed during an eruption 2,300 years ago that has remained geothermally active ever since. There were gorgeous photo opportunities around every turn, it seemed, and had it not been for the many flies that were following us around, it would have been a great spot for a hike along the shores, where you find abundant bird life (but we were too busy running from the dozens of flies that were chasing us… this was the only place in Iceland we even saw flies, it was very odd – something in the lake must attract them?). 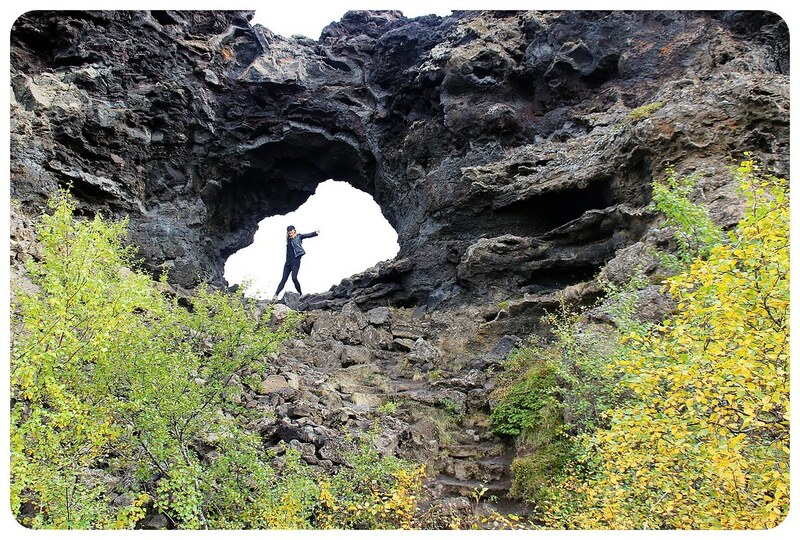 The rock formations of Dimmuborgir are part of a lava field like no other in the world: the huge lava rocks felt (yet again) completely otherworldly, but unlike anything else we’d seen in Iceland so far (or anywhere else in the world, as a matter of fact!). 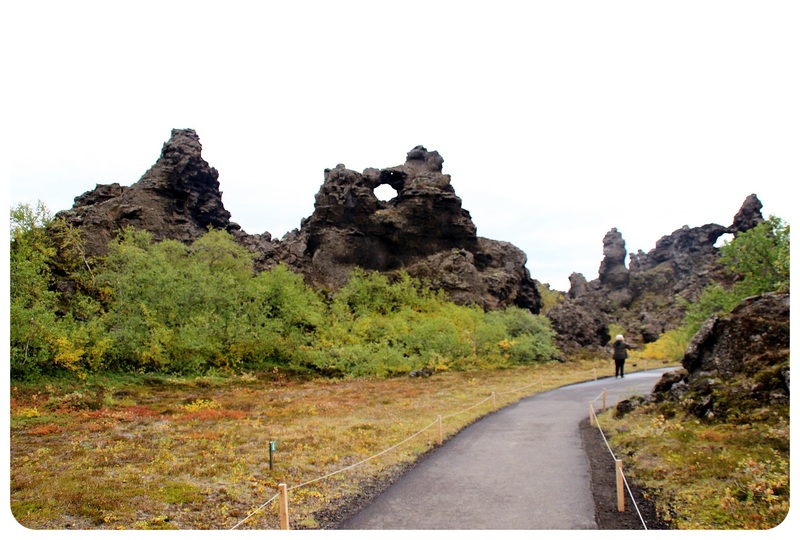 Some of the lava rocks rise out of the ground like skewed and bent pillars, some are shaped into arches and other quite bizarre formations. There are several hiking trails that lead right through the pillars and rocks, some of which you can climb and walk through (most of the rock formations cannot be climbed because the lava is quite fragile). If you watch Game Of Thrones, you might recognize this place from the show, where it was used as a filming location in season three. Our next destination? 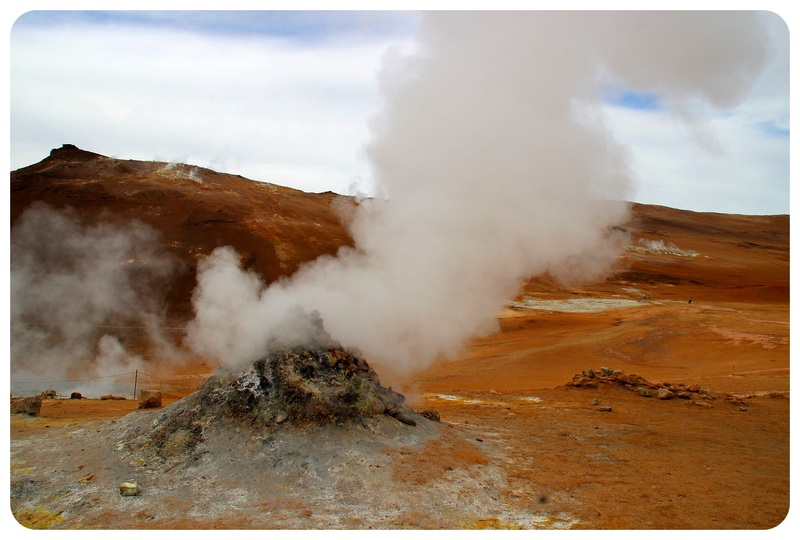 The geothermal fields of Hverir, which we could already spot from far away as we drove down the winding road from Námaskarð Pass towards the bright orange territory, out of which several steam vents were blowing big clouds high into the sky. For me, the mix of steaming mounds and bubbling pools was one of the most fascinating sights in all of Iceland – it is so rare to find yourself surrounded by sulfurous mud springs and fumaroles emitting steam into the sky, walking over dry, cracked puddles of grey mud and trying not to get too close to the steam vents, which are so hot that you can easily get burnt just from standing too close to them. The barren scenery here, along with the bright colors of the soil, made me think once again: are we on a different planet? I could’ve spent hours photographing this place – had it not been for the rotten egg smell of the sulphur, which was almost unbearable in some places. 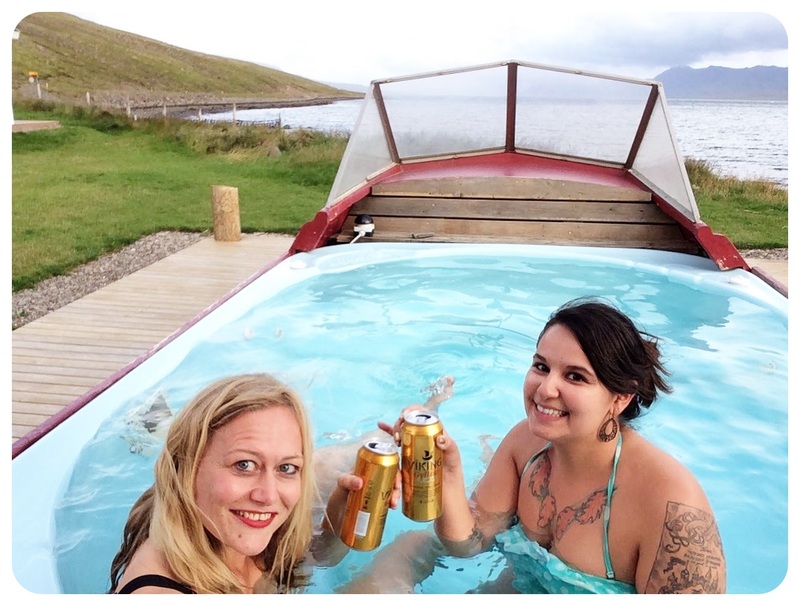 We were pretty happy with the deal we got in Myvatn: for ISK4,100 (around US$32) we got admission to the baths and steam rooms including one large beer (the same deal at the Blue Lagoon is US$62 in the winter/$73 in the summer!). There weren’t a lot of people, we were allowed to enjoy our beers right in the water, and the views were glorious. The sensation of sitting in hot waters (the pools range from 97°F to 104°F/36° to 40°C) while being hit in the face by a chilly breeze is something special, and being massaged by the in-water massage fountains after days of sitting in the car? Heavenly. 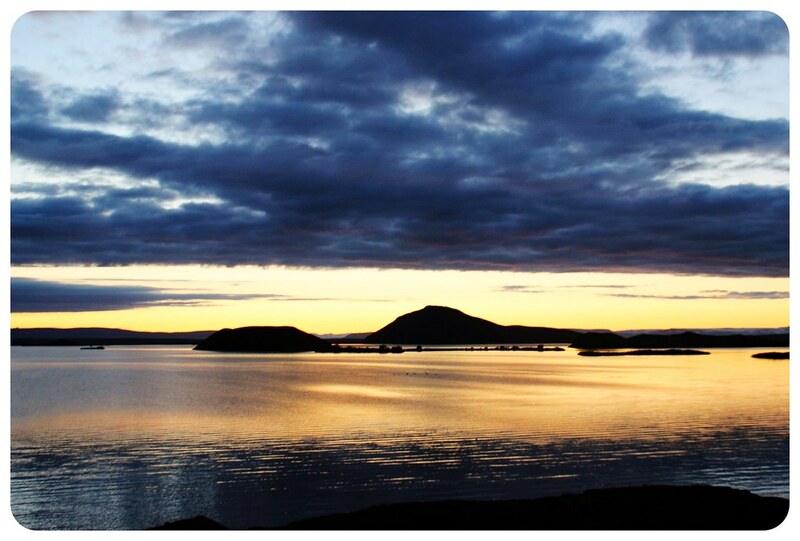 This afternoon was a great way to end our time in Myvatn. Tip: The baths are open until 10pm in the winter (and until midnight in the summer), and the northern lights can often be seen from here. So you might want to plan your visit for the late afternoon/evening hours. I can’t even imagine how cool it must be to watch the northern lights dance in the sky while soaking in the hot pools! 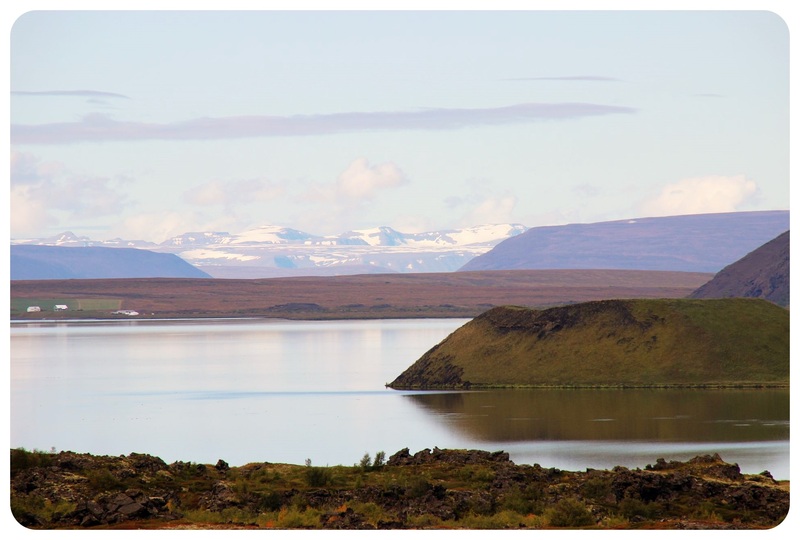 The next morning, it was time for us to continue our trip towards Akureyri, the capital of the north, and further west to finish the circle back to Reykjavik. But we had one last stop: Godafoss, one of Iceland’s largest waterfalls. 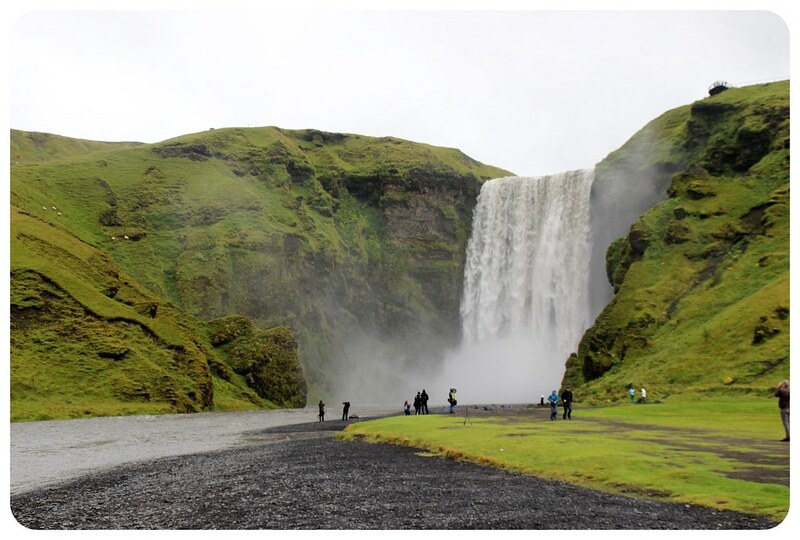 The waterfalls stand at 33 feet (10 meters), not very high, but the impressive width of 100 feet (30 meters) make up for what they are missing in height, and for me they were among the most majestic falls we saw in Iceland. The falls are a short detour from the Ring Road, but definitely worth it. So far on our road trip, every day seemed to top the previous one, but I have to admit that after Myvatn, nothing could top what we’d seen there. That said, we didn’t have much time to explore the northwest of Iceland, and I am sure that had we had more time, we would’ve found some stunning places there as well. A place I was keen on visiting that we had to skip due to time restraints was the Snæfellsnes peninsula in western Iceland, for example, which is often referred to as a miniature version of the entire country, because you can see so many of the things that make Iceland special in this 56 miles (90km) long peninsula: volcanic craters, a stunning glacier (Snæfellsjökull), black sand beaches, mountain scenery and lush valleys, little fishing towns, picturesque lakes and fjords. 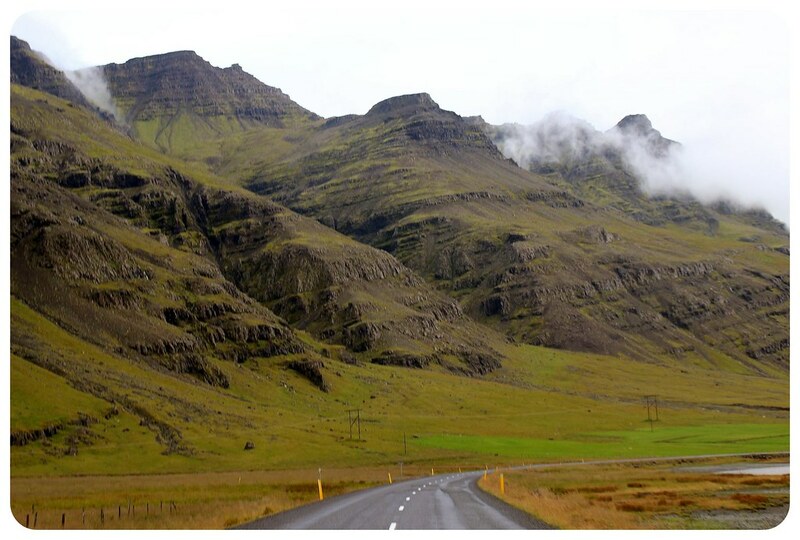 If you don’t have enough time to drive the Ring Road, Snæfellsnes is a good alternative. 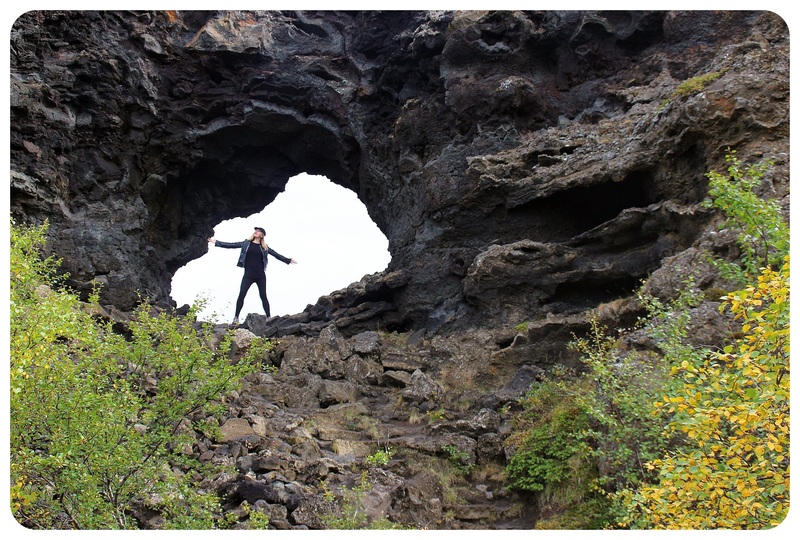 But to be honest – I wasn’t too upset that we didn’t make it there this time around, because it gives me just another excuse to return to Iceland. 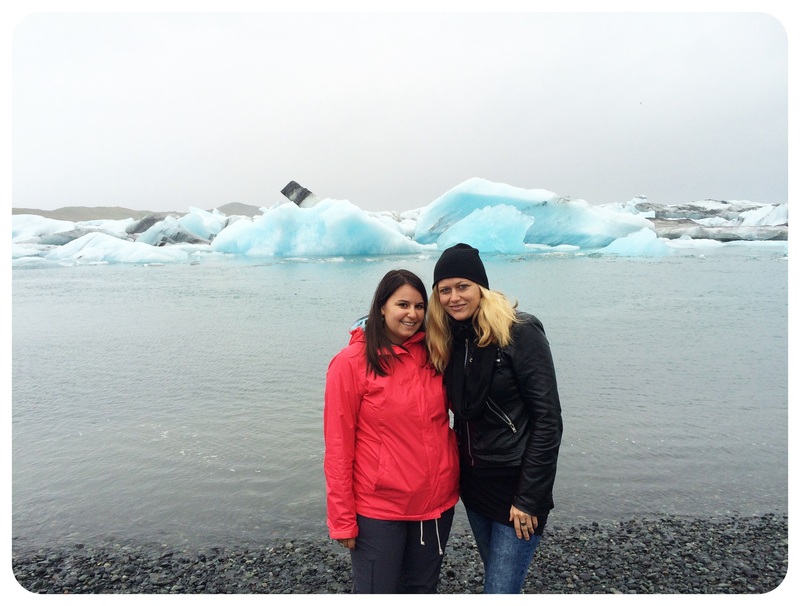 I hope I’ll see you soon again, enchanting Iceland! 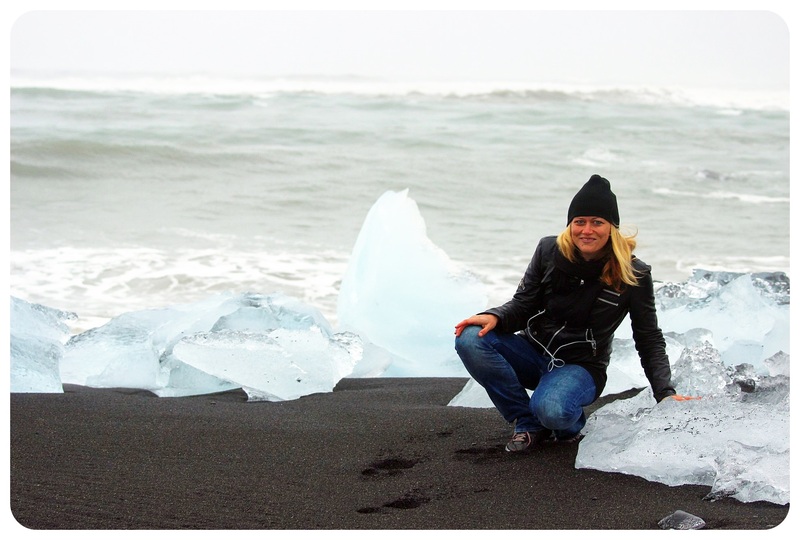 One of the things I say on my About Page is that I make mistakes so you don’t have to – and I actually made a big mistake in Iceland. Well, it wasn’t actually a mistake, because I knew I had to hit up one of the big grocery stores before leaving Reykjavik because big supermarkets are sparse on the island, and we wanted to pick up food to make picnic lunches during our road trip – restaurants in Iceland are pricey. And that’s what we did, we went to the first Bonus supermarket we came across, ready to load up the car with groceries. Only that the supermarket didn’t open until 11am (! ), and we were there at 9am. So we decided to head off on the first leg of our road trip, assuming we’d be coming back through Reykjavik after driving the Golden Circle. But we didn’t. We headed straight south. And were stuck with a small town grocery store in Vik, with a very limited selection. I put together some other things I’ve learned on my road trip through Iceland to help save you money during your trip, to give you an idea what to expect in regards to how much things cost, and last but not least – some thoughts on renting a car for your trip vs. using public transportation or hitchhiking. 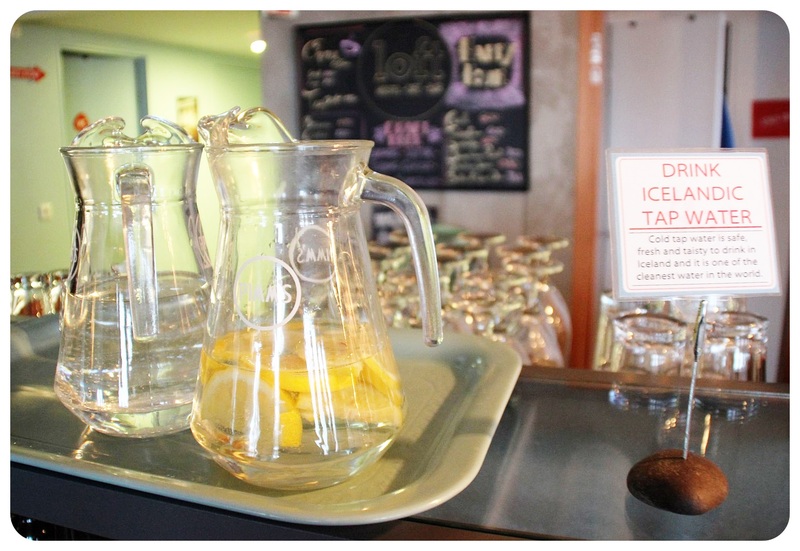 I was surprised when I read on other blogs that travelers had paid for water in Iceland. 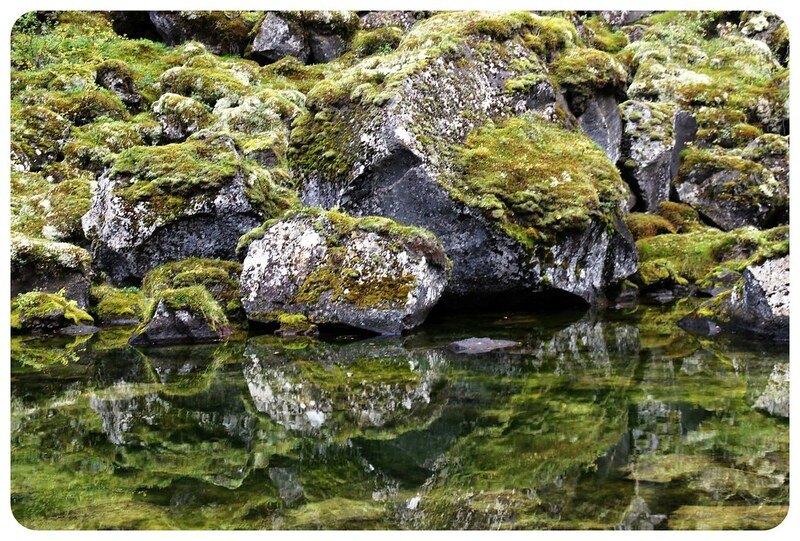 Icelanders pride themselves for having some of the best water in the world! It comes straight from a spring and is delicious – why would you pay for bottled water?! Plus, you won’t contribute to plastic bottle garbage. If you’re on a budget, you won’t be able to afford much more than the famous Icelandic hot dogs, which are available on hot dog stands in most places for ISK350 – 380 (US$2.70-$3). Whenever we decided to eat out, we were shocked by the prices on the menus. Restaurants in Iceland sure aren’t cheap! A pizza would usually start at around ISK2,000 (US$15.50) a burger around ISK1,900 (US$15), a vegetarian pasta dish around ISK2,200 (US$17)*. *The exchange rate used is from February 2016. 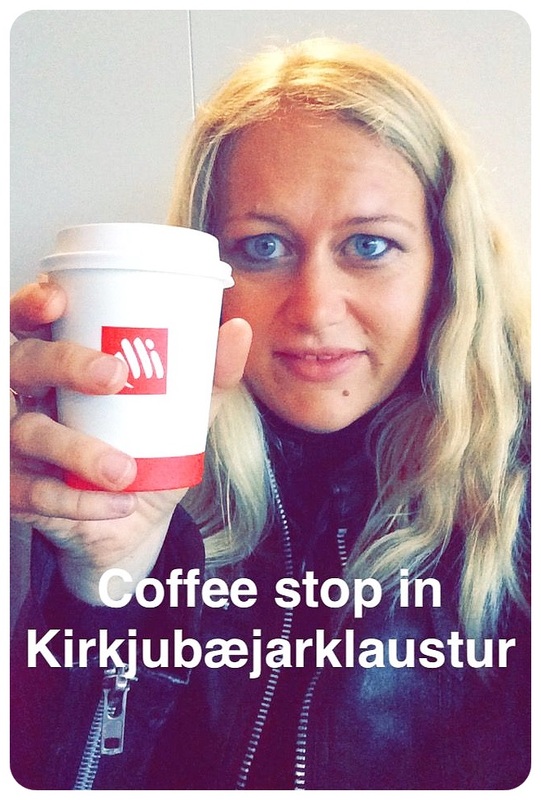 Coffee is between ISK350 and 500 /US$2.70 – 3.80 (a little more for cappuccinos, lattes, etc). Beer starts at ISK800 (up to 1200) /US$6.20-9.20, but if you buy a can in the supermarket, it will cost around ISK350 /US$2.70 (for 500ml). Tip: If you’re renting a car at the airport, you might want to consider picking up beer in the Duty Free Shop. 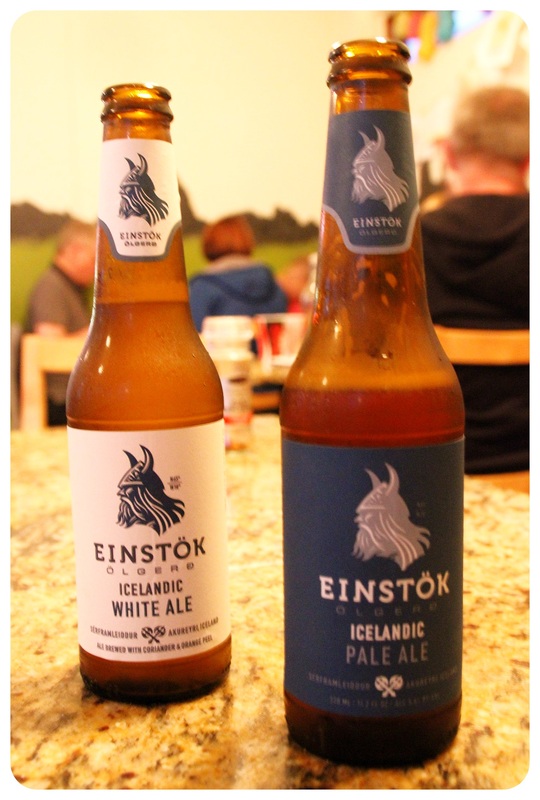 A six-pack of 500ml Viking beers is around ISK1,500 /US$11.55. Gas was ISK204/US$1.57 per litre when I visited in September 2015. That’s nearly US$6 per gallon! The bus from the airport into Reykjavik is 1,950/US$15, cabs from the airport are around ISK12,000/US$92. Activities are quite pricey: the Blue Lagoon starts at 7,000 (US$54), whale watching at 9,000 (US$70), a Golden Circle Tour ISK10,000 (US$77). 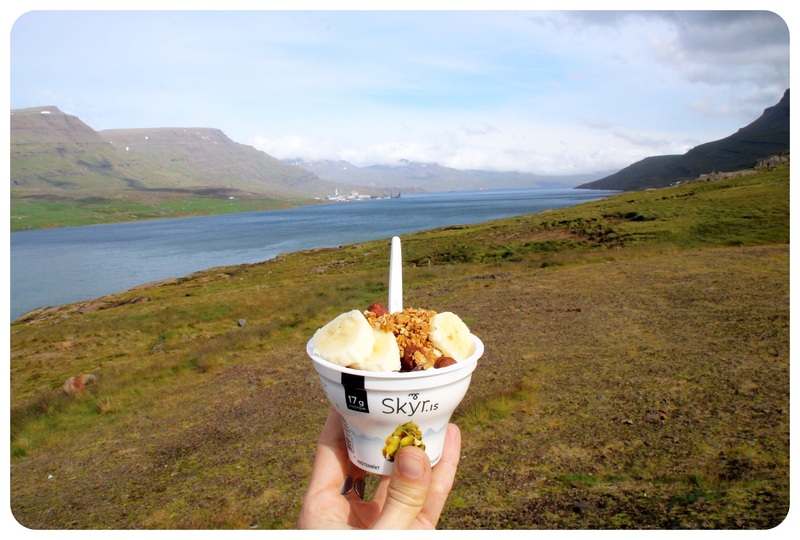 To get an idea what other groceries and entertainment in Iceland cost, check out this article on the cost of living in Iceland. Note that there is a big difference between high season and low season prices for rental cars and accommodation! Kronan, Bonus and Netto are the cheapest supermarket chains in Iceland. Tipping is not customary in Iceland, so save your change! 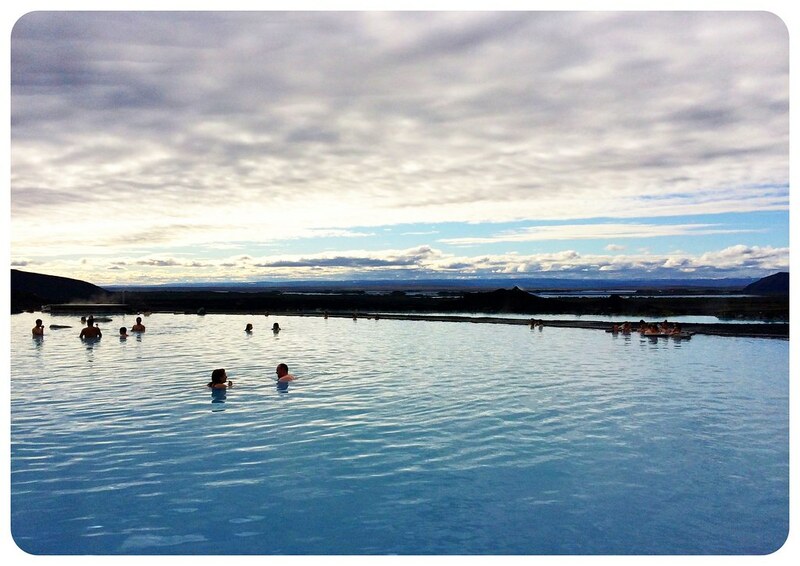 I have to admit that I didn’t take out cash at all while I was in Iceland – I paid with my card everywhere! And not once was I unable to buy something because I didn’t have cash, cards were accepted in all the stores and restaurants I went to, even a small coffee shop in a tiny village along the way. A SIM card with some data is useful if you want to look up directions or call a hotel/hostel or use a road map app, a weather app or the northern lights forecast website. The Duty Free Shop at the airport sells Siminn SIM cards, which have the best coverage in Iceland, with 1GB data, 100 minutes and 100 text messages for ISK2,990 (around US$23). A Vodafone SIM card can be bought at the same shop for half the price, ISK1,500 (US$11.85), containing 300MB data and ISK1,000 credit. If you don’t need any of these things, you’ll be totally fine with wi-fi, available in 95% of all guesthouses, I’d say, and also in most cafes, restaurants and gas stations. I would recommend visiting in the shoulder season – May or September. That way you can avoid the crowds that have flooded Iceland during the summer months in recent years since it has become such a popular destination, but you can still enjoy the activities that shut down in the winter months, like glacier boat tours, paragliding, snorkeling/diving in Silfra, or whale watching tours. Also remember that if you visit in the winter, you have considerably less hours of daylight than in the summer, which makes a big difference when mapping out a driving route. I thought I knew crazy weather from living in Britain but Icelandic weather easily tops that. We often woke up to rain and cloudy skies, and a couple of hours later the sun was shining. Or I would start driving in the morning with blue skies and then drove straight into rain. If you wake up to rain, don’t be fooled and think you should stay in – I guarantee you that the weather changes several times during the day. 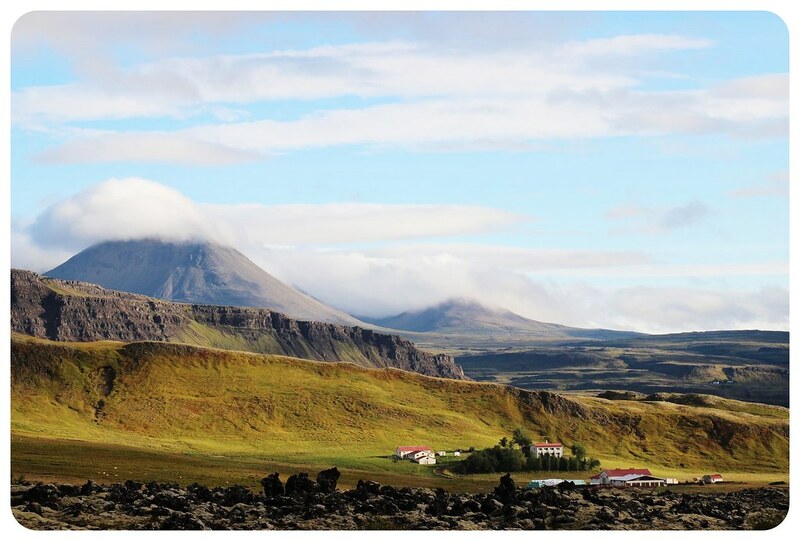 Vedur.is is the best weather resource for Iceland. 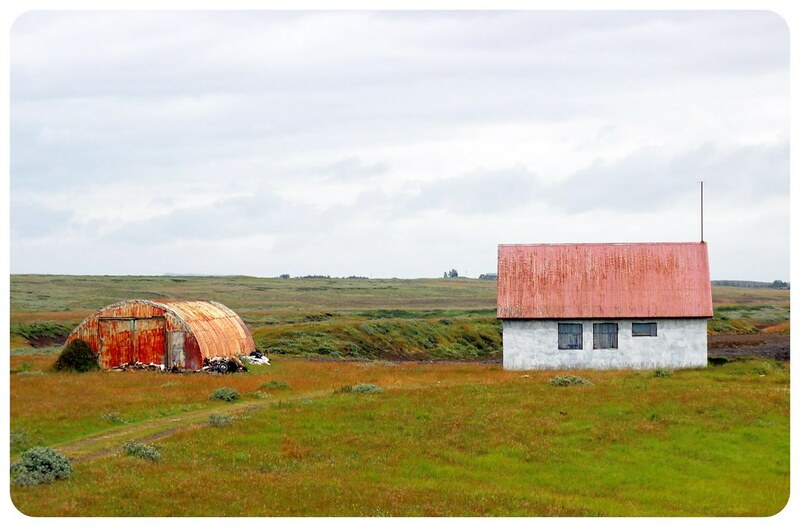 As soon as we hit the road and saw tour buses by the dozen, I knew we had made the right decision going with an Iceland self-guided tour – it gave us the exact amount of flexibility and independence that we needed, and yet it was comforting to know that we didn’t need to take care of our accommodation. The places we slept at were all vouched for and in a strategic location for each day’s route, but I could decide how to plan the route, how much time to spend in each place, if we wanted to stop in other places along the way, or if we wanted to skip some of the suggestions in the itinerary. After all, I didn’t need to follow each day’s schedule to a tee. 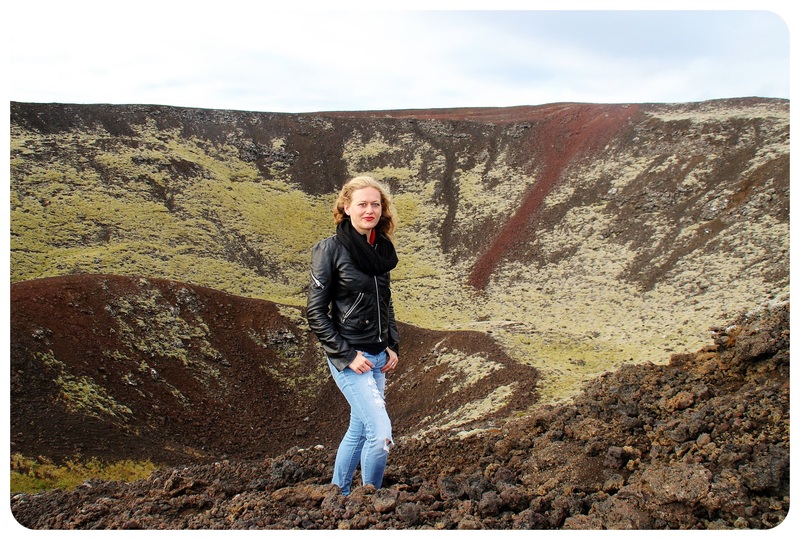 A spontaneous stop at the volcano craters of Grabrokargigar – only possible because we were on a self-guided drive! And I was more than happy to have the flexibility to spend as much time as I wanted in places like the magnificent Jokulsarlon Glacier Lagoon, instead of being herded back on the bus like most other tourists there. Or to decide to turn off and follow an unpaved road, only to find another glacier lagoon, Fjallsarlon, also stunning and well worth the little detour, which we couldn’t have taken had we been on an organized group tour. If you don’t mind mapping out your road trip route yourself and booking your accommodation, there are plenty of car rentals available at the international airport. 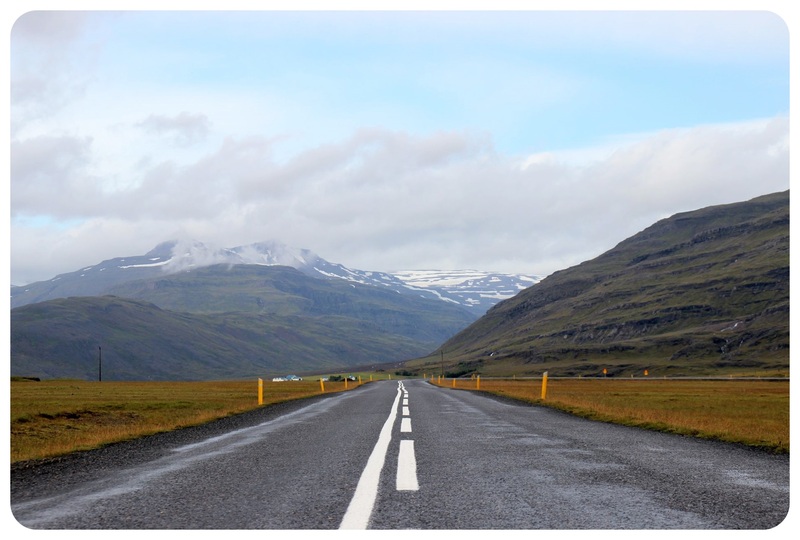 I never felt uncomfortable driving in Iceland, but you might find the narrow mountain and coastal roads a little intimidating if you’re only used to driving multi-lane highways in the U.S. However, I wouldn’t trade in driving myself for anything else – it just gives you so much freedom. 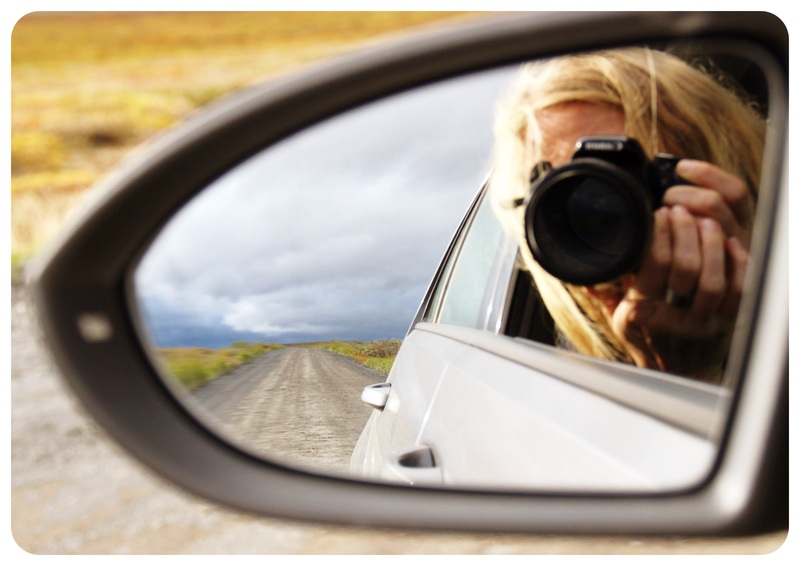 I shared some driving tips for Iceland here. If you don’t need the comfort of a hotel bed, you can also rent a camper van, by the way. 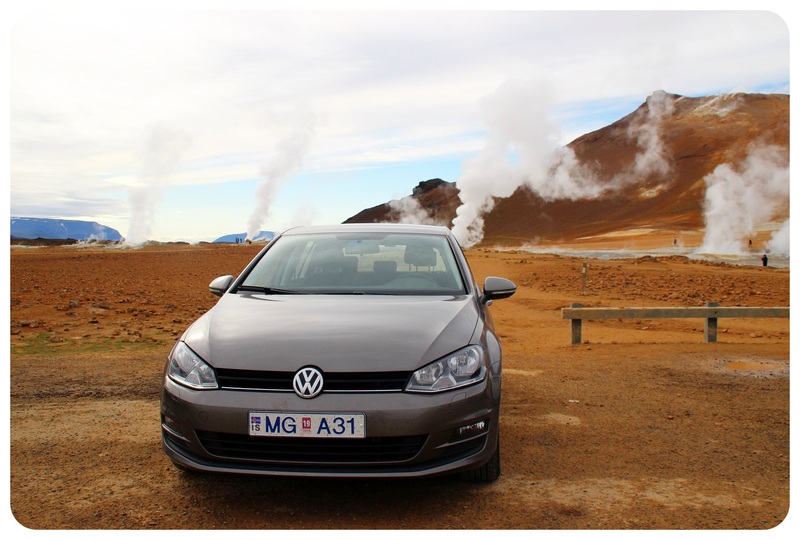 My friend Matt explored Iceland in a Happy Camper and seemed to have enjoyed it. 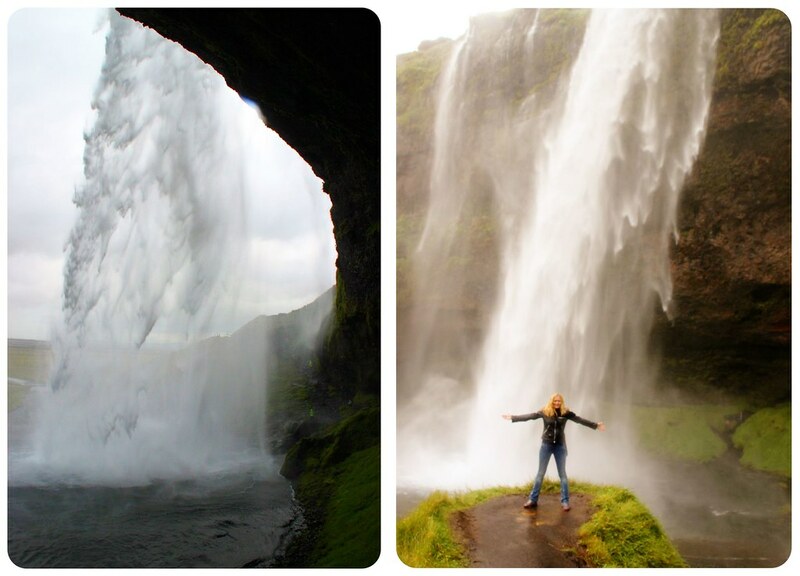 You’ll want to be able to stop at Iceland’s gazillion waterfalls! 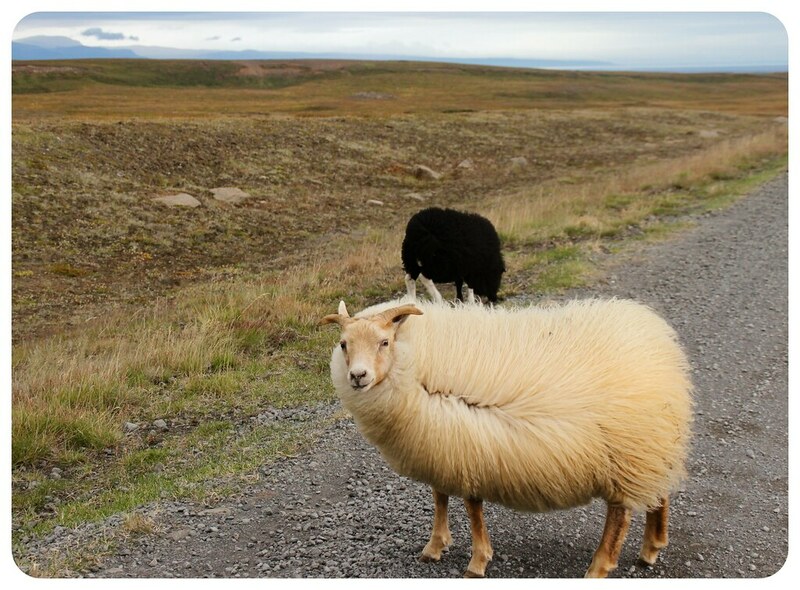 Hitchhiking in Iceland is adventurous, but it’s much more common than in the U.S., for example, and we came across quite a few hitchhikers – and even picked some up along the way. For us it was a fun way to meet other travelers and hear their crazy stories (a couple we picked up was nearly blown over a cliff in their little tent on a stormy night). 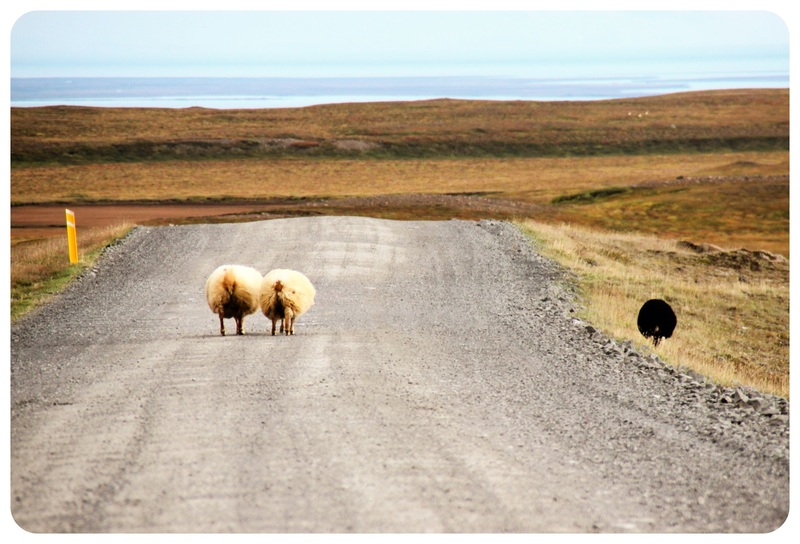 It’s definitely doable to circle Iceland on the Ring Road by hitching, but be aware that in some remote parts, it can take a while until somebody picks you up (hours!) and as I said before, the weather changes rapidly, so you might be standing in the rain for a while in a country that is chilly year-round. 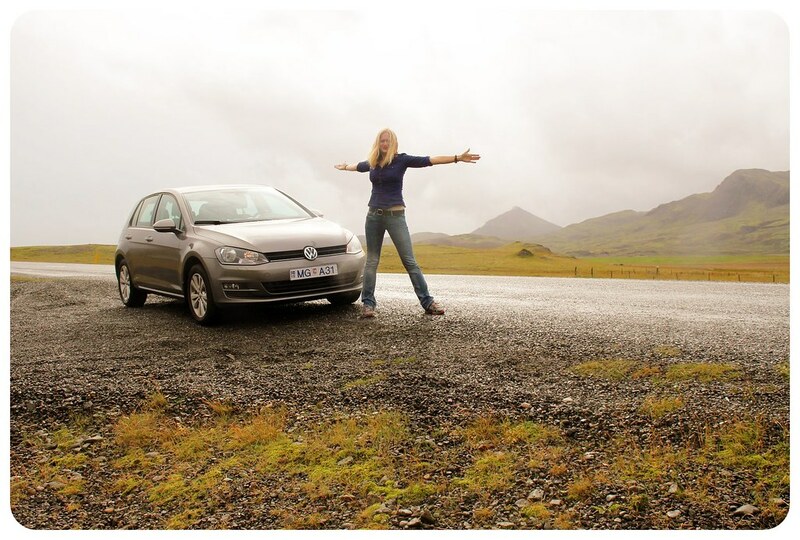 If you’re thinking about hitchhiking in Iceland, check out the Hitchwiki for Iceland. Dawn shares her hitchhiking experience in detail here, check it out to get an idea of what to expect. Ride sharing is a popular way of traveling in Europe. If you are the one with the car, you can post the ride you’re planning to take on a ride sharing website, including how many seats are available and how much you charge per person. It’s a great way to get some money for gas. People in need of a ride can post the details of the ride they want to take on this website, and car owners who are heading that way can respond to your post. 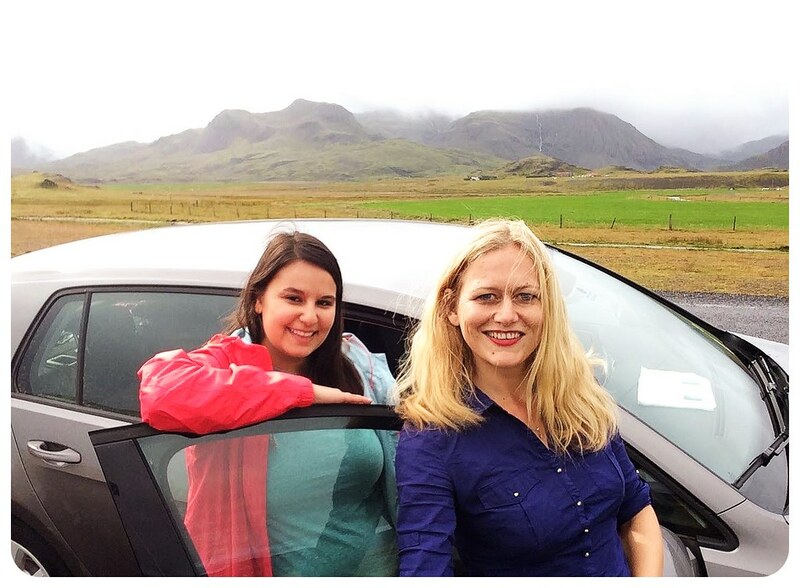 Another website that lets you post the rides you require or you offer is Carpoolworld Iceland. After a day filled with waterfalls, geysers and Icelandic horses along Iceland’s Golden Circle, we started day two on the actual Ring Road. While we had breakfast, the owner of our lovely Icelandic farmstay came over with a map and showed us a small road just before Vik, a nearby town. It would be worth going in there to see some spectacular rock formations along the coast, she said, and because we were free to do whatever we wanted, we decided to take her up on her advice. And I am glad I did: The rock formations and cliffs at Dyrholaey were stunning, and seeing the waves furiously hit the shore on this grey and stormy morning turned out to be a memorable start to the day. 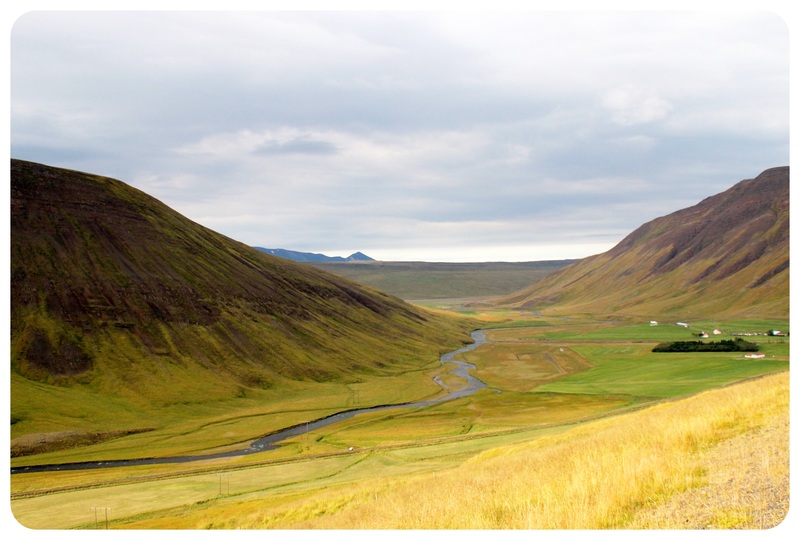 (Tip: if you’re planning to drive this part of the ring road yourself and want to stop at Dyrholaey, turn left onto road 218, just before you reach Vik. 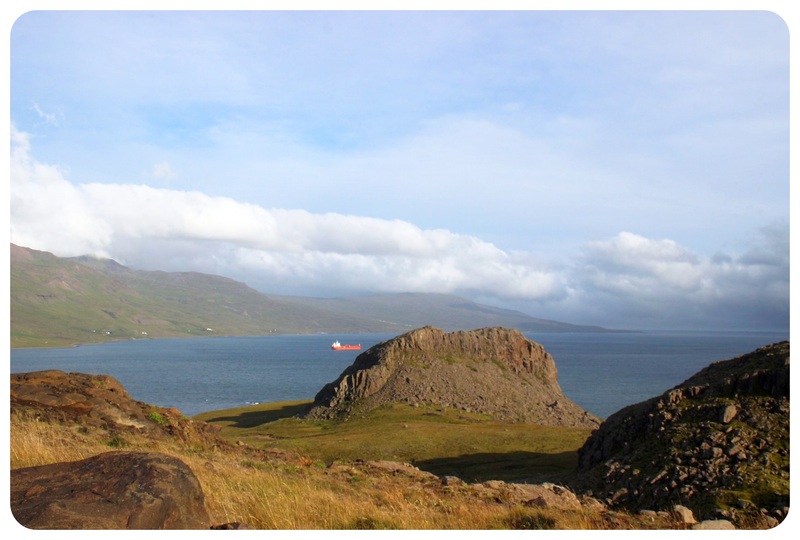 This is also a popular place to spot puffins, but we weren’t lucky enough to spot any.) Vik itself was a small fishing town which I didn’t find all that memorable (it’s tiny), but it has a unique black sand beach which was definitely worth a stop. The sand is actually volcanic ashes, a reminder that Iceland is filled with volcanoes (there are around 130) and yes, they tend to erupt every now and again. 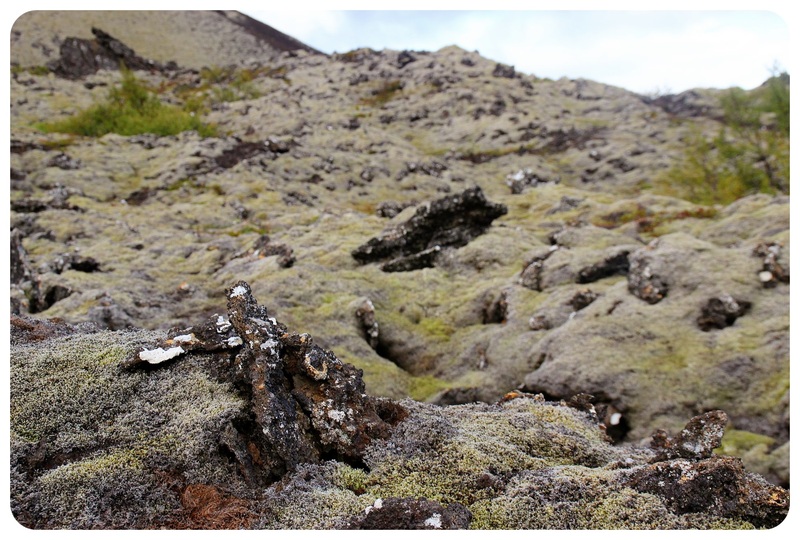 After that, it was a complete change of scenery: we found ourselves driving through green volcanic moss. 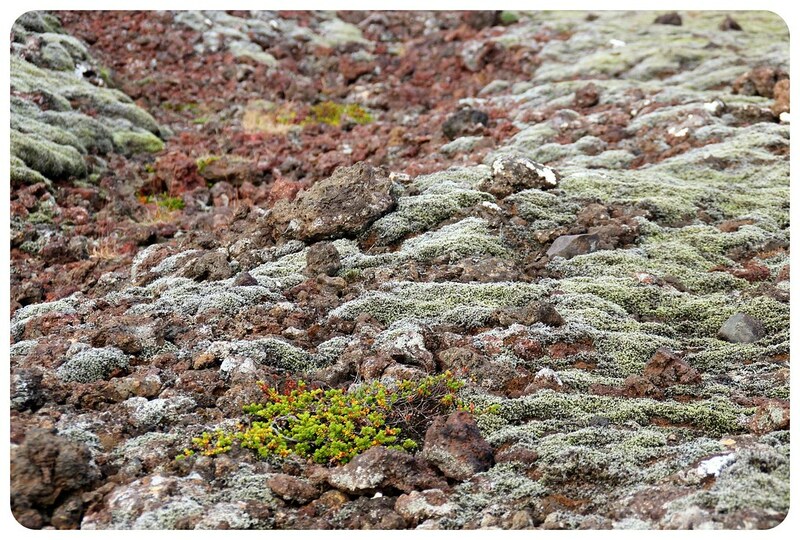 In several areas of the island, you find lava fields, which over the years have been covered with a thick layer of green moss. 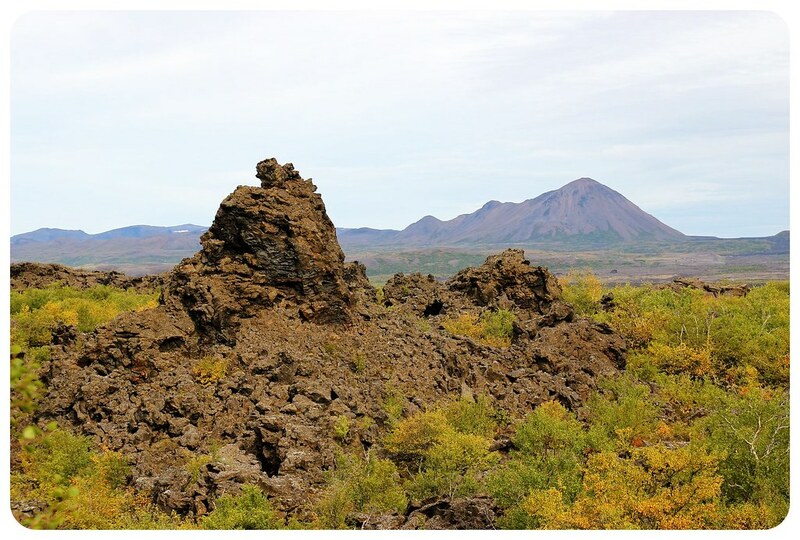 This one, the Eldhraun lava field, is the largest one in Iceland, and was formed during a volcanic eruption in 1983-84. It feels quite surreal to drive through this scenery, almost like a different planet, made up by moss-covered rocks, but it was also fascinating to see how lava can change a vast landscape like this in such a dramatic way. 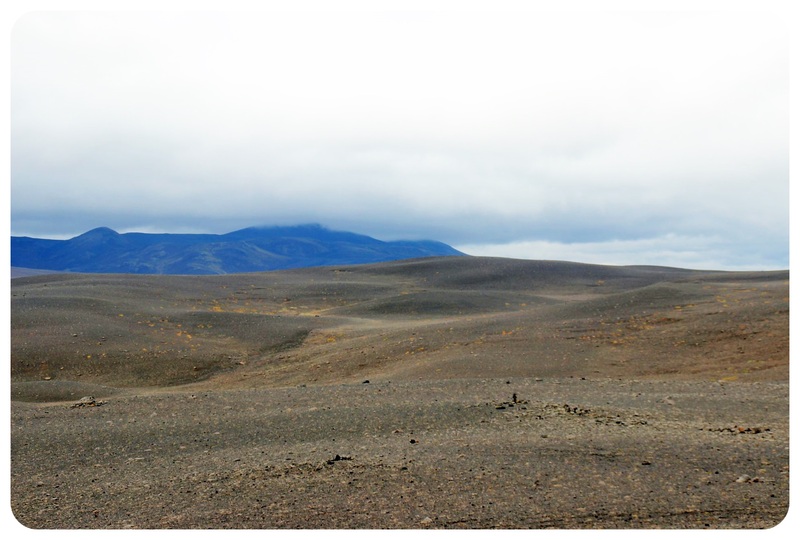 Soon after, the scenery was yet again completely different: we were passing through Skeidararsandur, the world’s largest sand plain, covering 1,300 km², and made of volcanic sand. This area feels eerily empty. 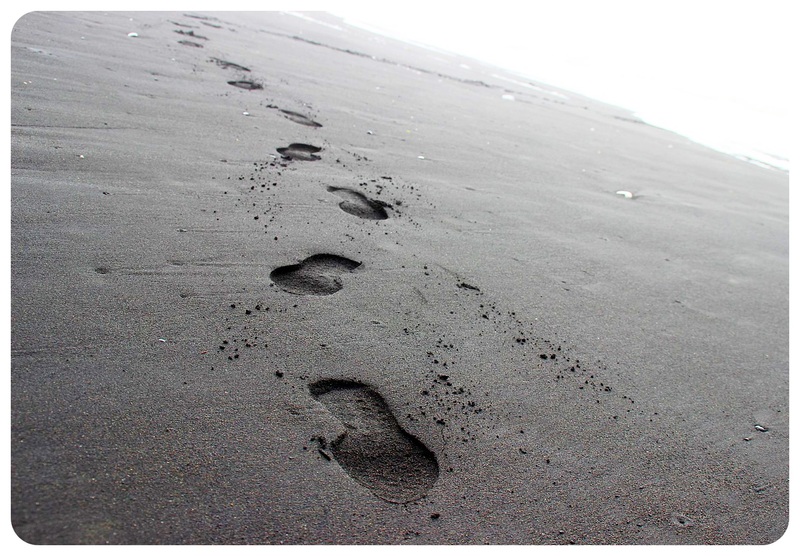 There are no settlements, no houses – just a giant dark mass of volcanic sand which seemed even gloomier on the grey and cloudy day that we were driving through it. 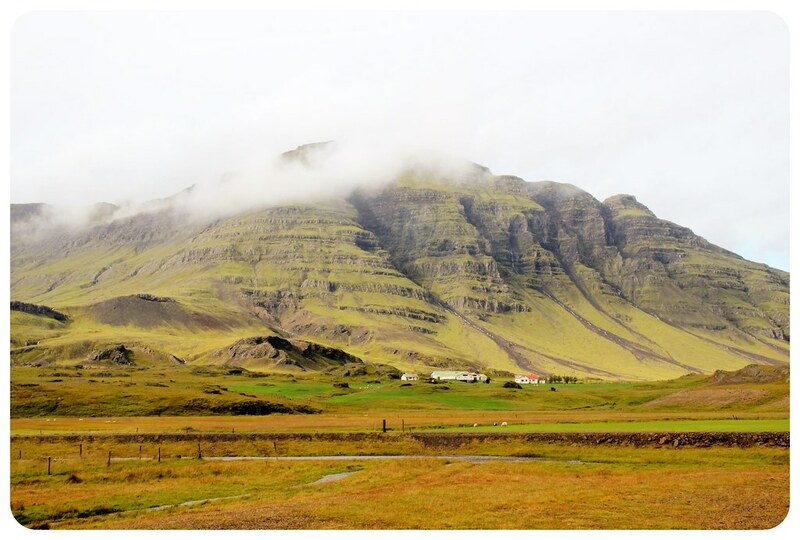 It finally brought us to Skaftafell National Park, where we found ourselves suddenly surrounded by alpine mountains, even though, more often than not, we could only assume that there are mountains hiding behind the thick layer of clouds. Skaftafell is where the massive glacier Skaftafellsjökull was located, and it sat to our left most of the journey to Jökulsárlón glacier lagoon, which is undoubtedly one of Iceland’s most popular tourist destinations. I too fell under its spell, and it ended up being my favorite stop on our road trip – but I won’t go into too much detail now, because it deserves its own article. 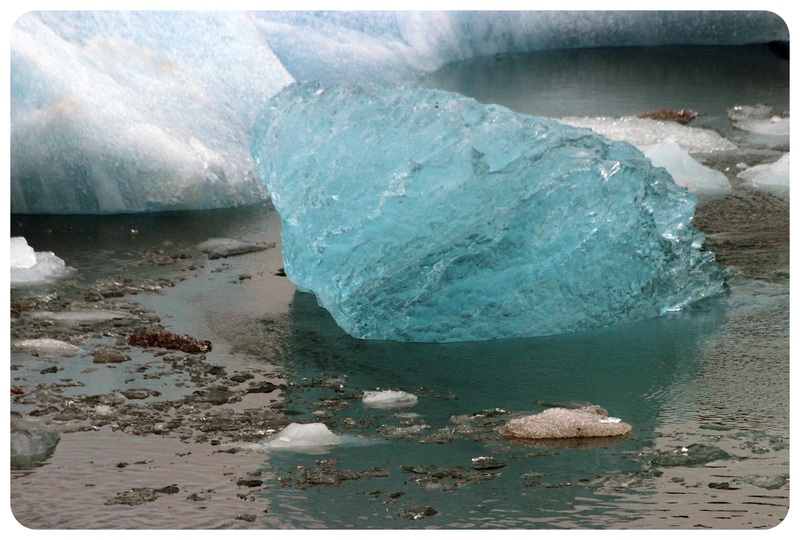 I will say – seeing dozens of blue icebergs floating in a lagoon is a sight that you won’t forget anytime soon. 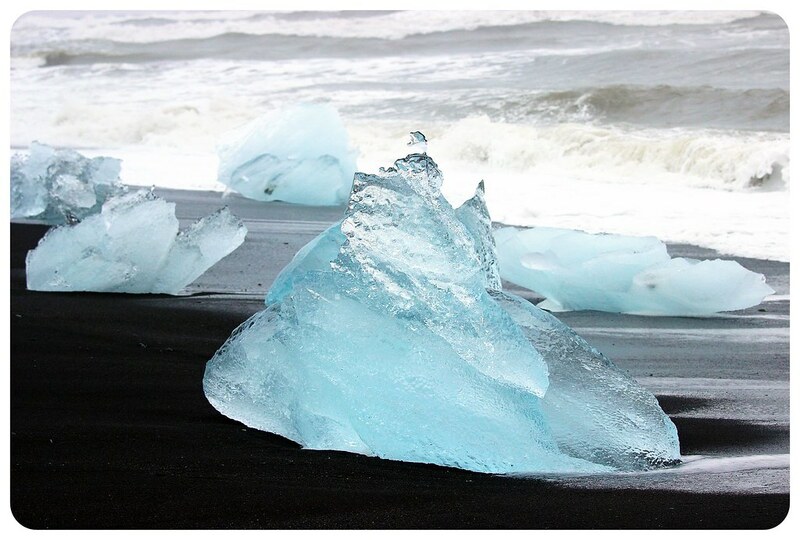 Across the street from Jökulsárlón there is an equally stunning place: another black sand beach, but this one is filled with icebergs that have been washed ashore again after slowly floating out into the ocean from the glacier lagoon. I couldn’t believe that this was only the second day of our road trip – we pulled the car over again and again to take pictures and enjoy the scenery. And this was just one of six days driving the Ring Road. Even though we spent a lot of time in the car during our trip, there was never a dull moment. 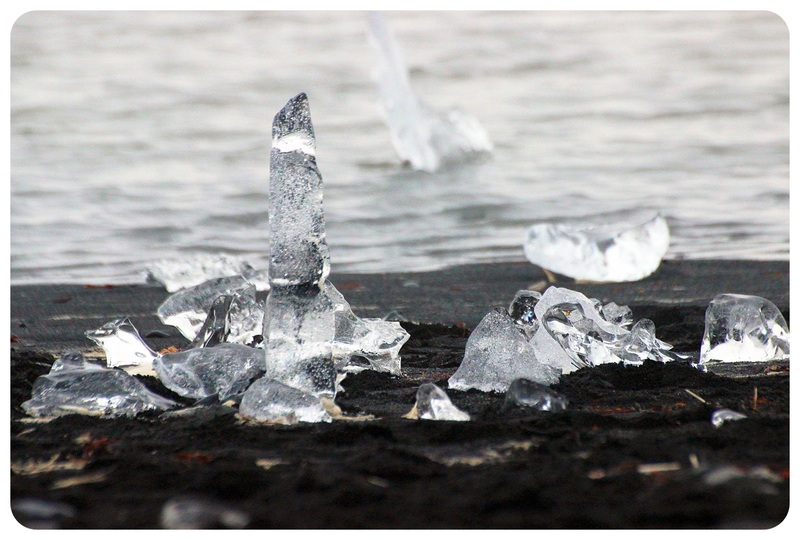 Driving along fjords, crossing sand plains, passing waterfalls and glaciers – Iceland always keeps you entertained. 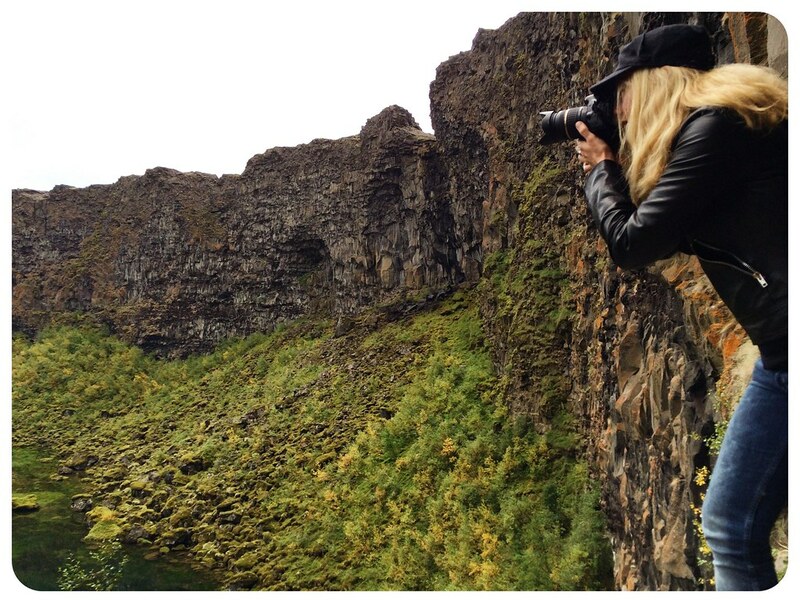 One thing worth mentioning before sharing my favorite captures from Northern Iceland in Part III of our road trip? Our accommodation in Eskifjorður, a small fishing town on the shores of the Reyðarfjörður fjord, which is Eastern Iceland’s longest and widest fjord. The only four-lane highway I encountered was the road from the airport into Reykjavik. All the other streets were two-lane country roads, often narrowing into one lane, especially on bridges. That’s why it is important to always stick to the speed limit and be attentive – nothing worse than meeting a car in the middle of a bridge because you weren’t paying attention about oncoming traffic. 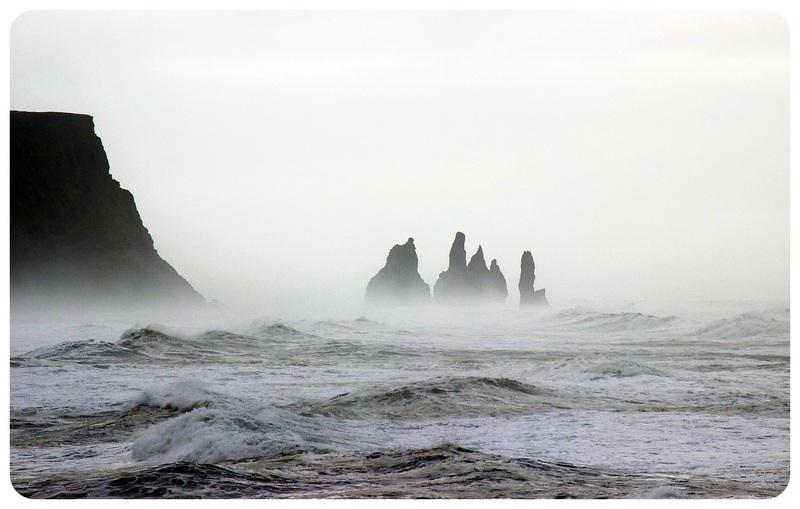 Pick up the free ‘Around Iceland‘ brochure by heimur. You can get it at any tourist information centre and in most hotels, and it has maps where gas stations and toilets are marked, plus a whole bunch of other useful information. The Iceland Road Guide app has comprehensive information about all of Iceland’s roads, food & drink along the way, sights, and general information. You can download it here for Android and for iOS. Make sure to ask for an automatic if you’re not comfortable driving stick. Don’t expect the weather to stay the same throughout the day – it’ll change all the time! We often found ourselves leaving in rain and enjoying bright sunshine a couple of hours later. Instead of waiting for the rain to stop, just drive. 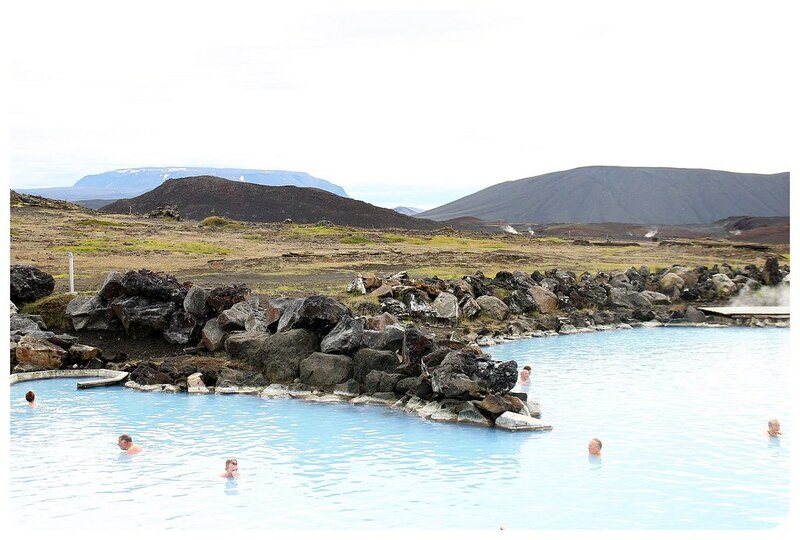 The best way to see Iceland? Without a doubt, on a road trip! 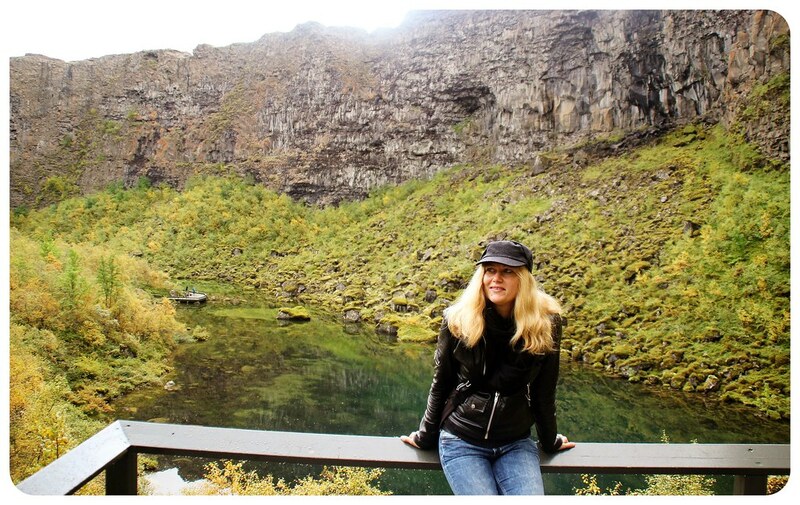 And since I love road trips, I didn’t have to think about it for too long when it came to deciding how we’d spend our week in Iceland: we were going to drive the Ring Road. The Ring Road, or Highway 1, is an 828 miles (1332 kilometers) long road around the country, basically circling the island. 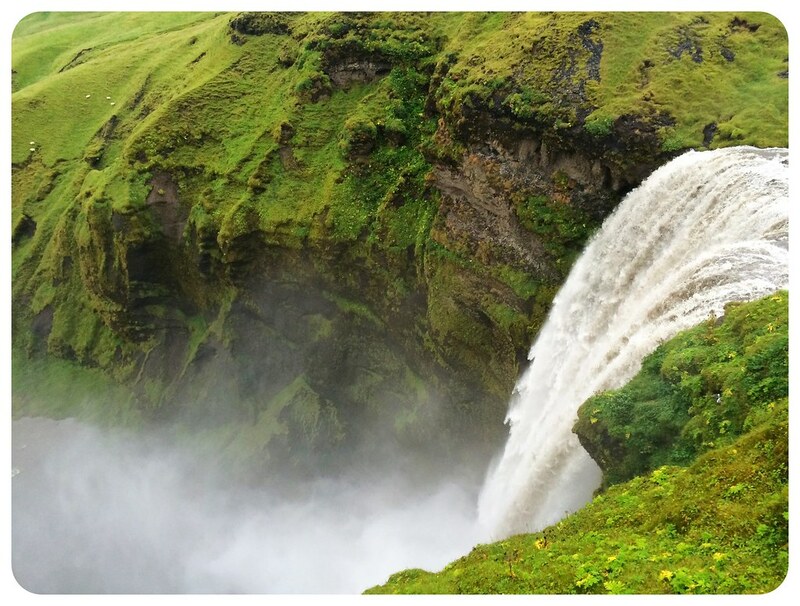 It passes everything that Iceland is famous for: stunning waterfalls, volcanoes, glaciers and glacier lagoons, geysers, lava fields and geothermal fields, and the country’s incredibly diverse scenery. Since we only had six days (plus one day in Reykjavik, which I didn’t want to skip entirely) we opted for a self-guided driving tour, which was an excellent decision. 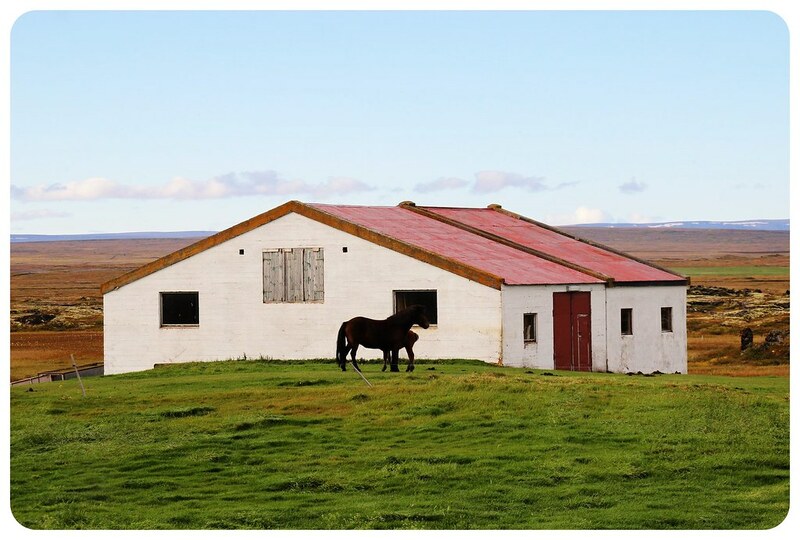 While I was researching Iceland road trip routes I came across Icelandic Farm Holidays, a local tour operator who offers both self-drive and guided tours of the country. 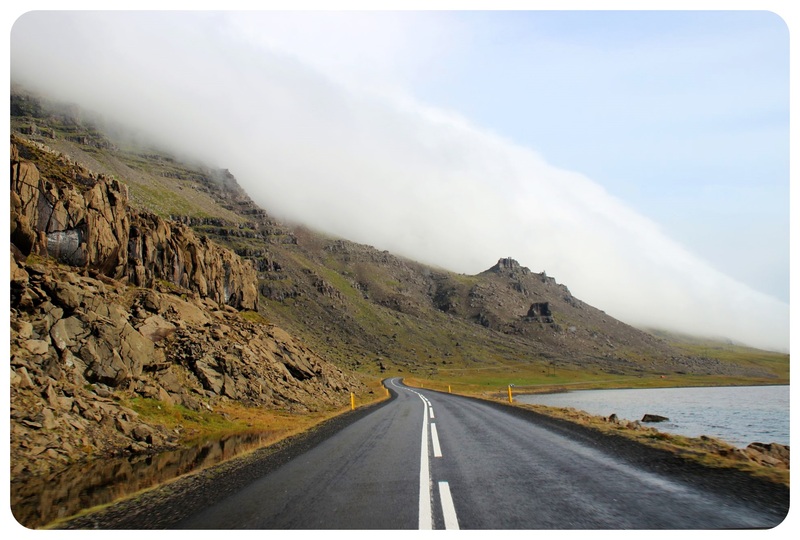 There are several self-driving tours available, depending on how much time you have and what you’re most interested in, and the tour that caught my eye was the ‘Highlights of Iceland’ tour. 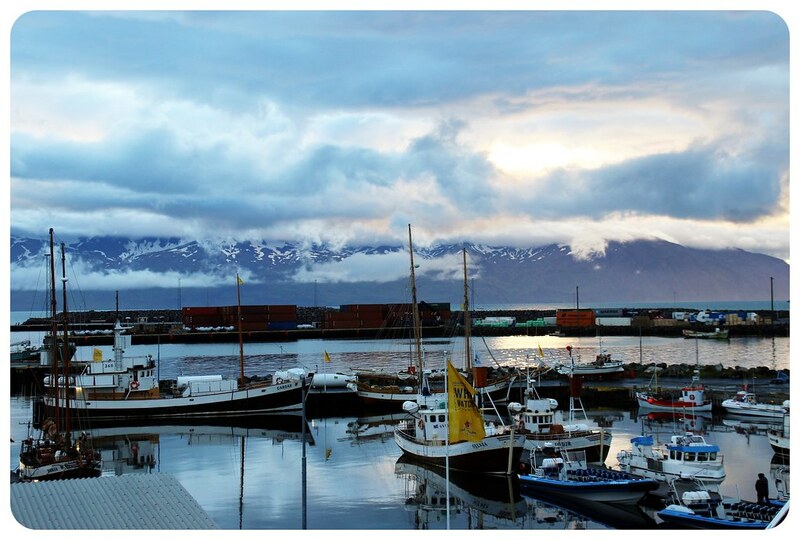 It would bring us around the island in six days, leaving the seventh day to explore Reykjavik. Perfect! Six days for the Ring Road is pretty ambitious and meant we would be spending a lot of time in the car – but if you don’t mind driving and are equipped with some good podcasts and/or entertaining travel companions, it’s not too crazy. In hindsight I have to say that I’ve driven longer distances on previous road trips, but if you want some time to hike or do some activities along the way, I’d recommend allowing ten days to drive the Ring Road. The advantage of a self-guided driving tour? I didn’t need to deal with any of the planning. Usually I am the one who maps out daily routes, determines where to break up the trip and where to spend the night, but my schedule had been so hectic in the weeks prior to the trip that I was glad for not having to spend too much time researching and organizing the trip. 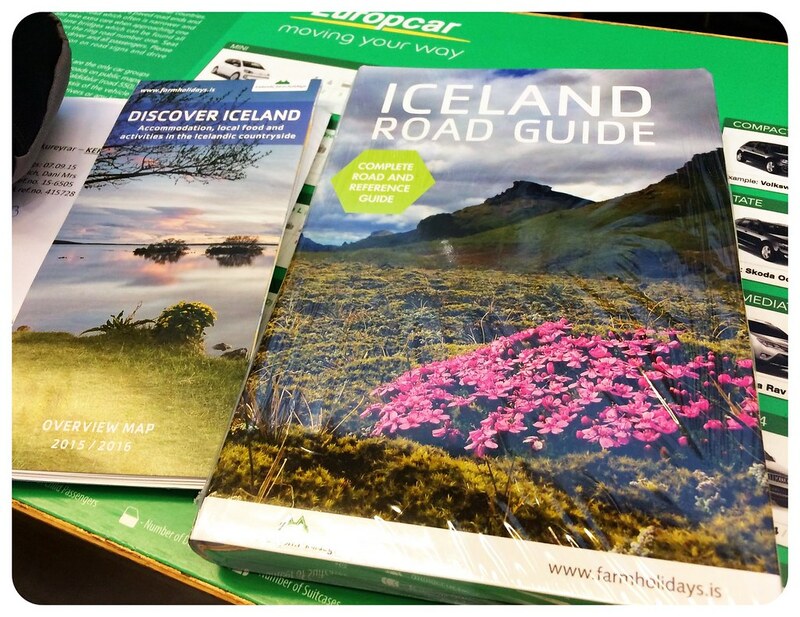 Instead, I headed from my gate straight to the Europcar rental car counter at the airport, where I was handed a detailed Iceland Road Guide (over 600 pages!) and a Welcome Pack which included a comprehensive day-by-day breakdown of the trip and vouchers for each of the hotels we would stay at along the way. Plus the most important item: a GPS system. 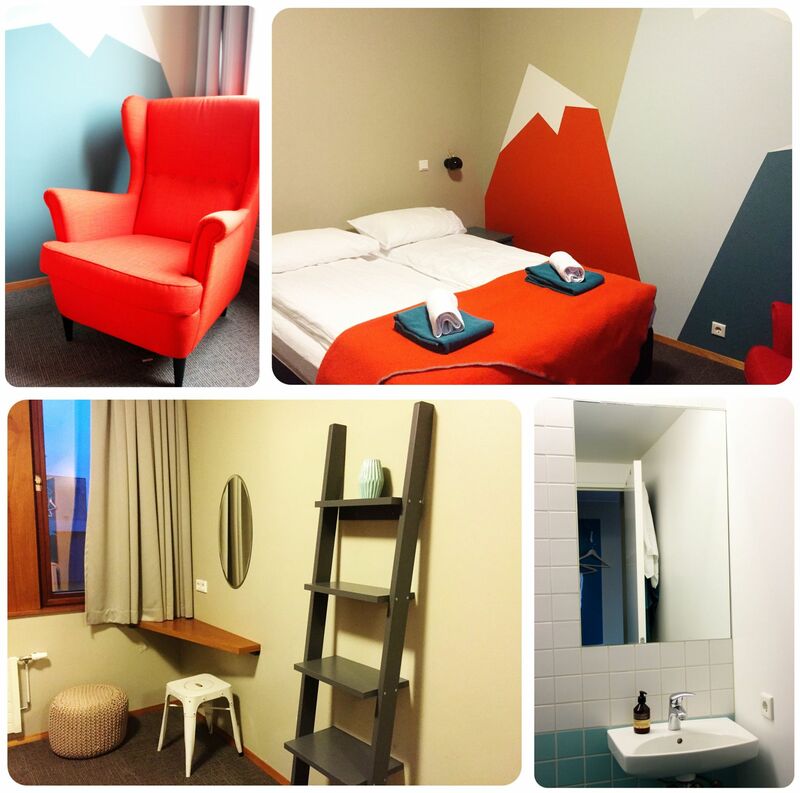 We left the Loft Hostel in Reykjavik on a rainy September morning to start our drive – but not the Ring Road quite yet. 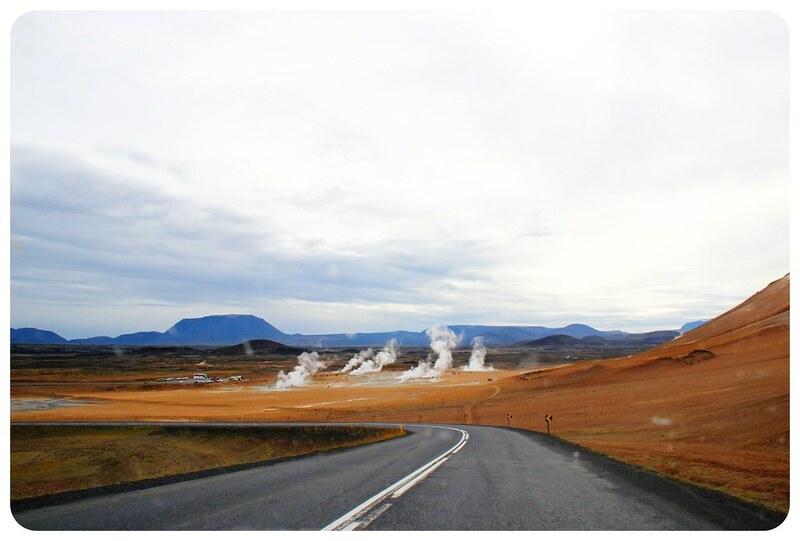 Instead, we started with a detour: the Golden Circle. 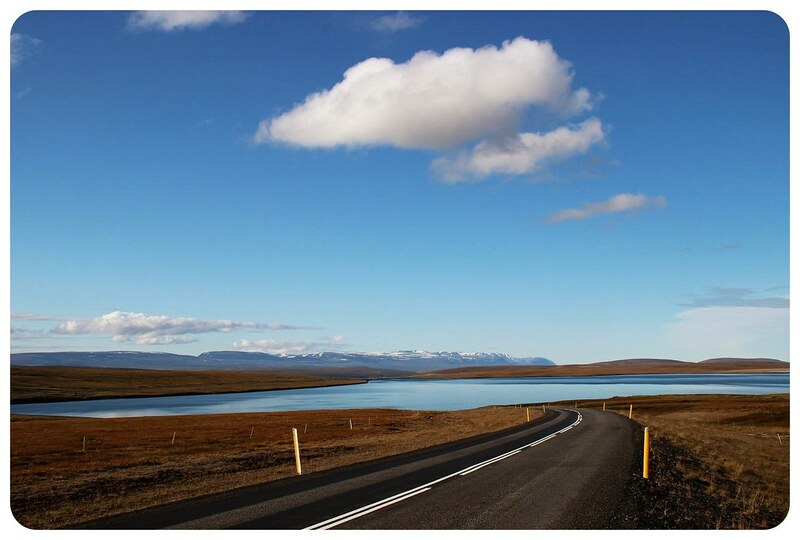 This one-day drive, easily reachable from Reykjavik, is the most popular day trip for Iceland visitors, especially those who don’t have time to drive the entire Ring Road. The trip covers just under 190 miles (around 300km), normally looping back to Reykjavik, but since we would follow the Ring Road counter-clockwise, we took a shortcut and headed straight south towards Vik, where we’d spend the night instead of returning to the capital. Þingvellir National Park is where the American and Eurasian tectonic plates meet, and one thing that I really wanted to do was snorkel over the rift between the two plates, which is something that I’ve been obsessing about ever since reading that you could do it. Sadly our itinerary didn’t leave enough time for it – but it means I’ll have to return to Iceland one day, which is totally fine with me! And even though I missed out on this unique (and icy!) 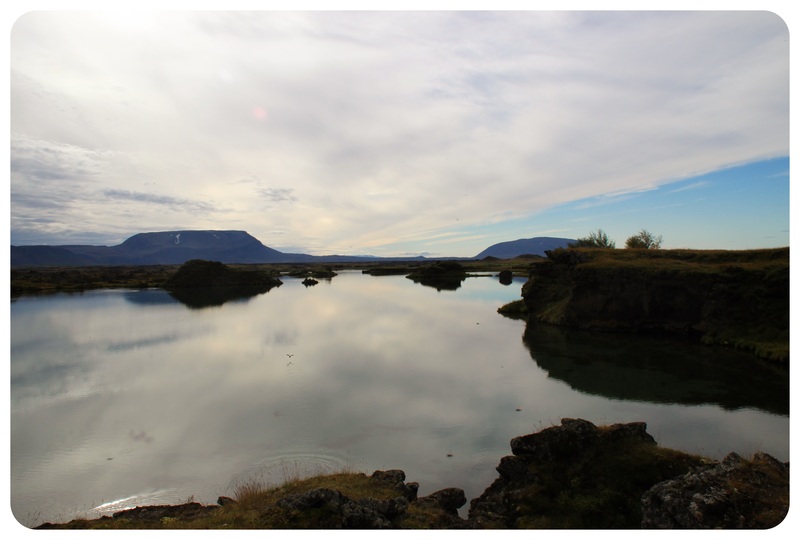 Silfra snorkeling experience, our first day was already packed with stunning landscapes – and it was an indication of what our week would be like: a succession of waterfalls, geothermal fields, more waterfalls, fascinating scenery and lots of sudden ‘Pull over NOW!‘ photo ops. 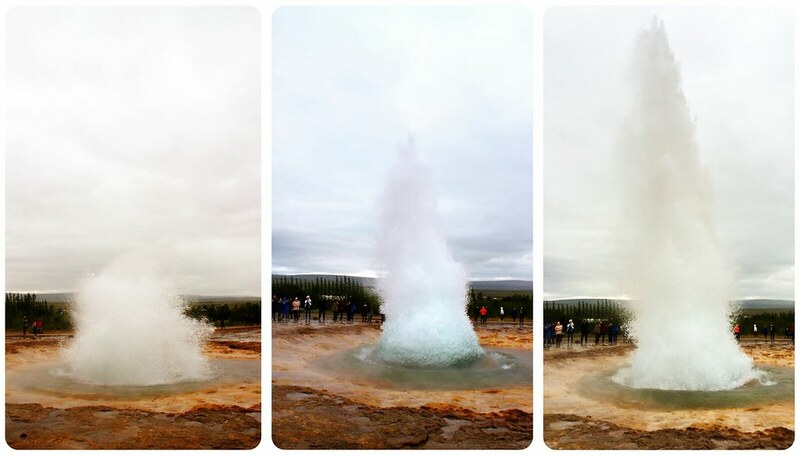 During the Golden Circle drive, we already saw two geysers: Geysir and Strokkur. 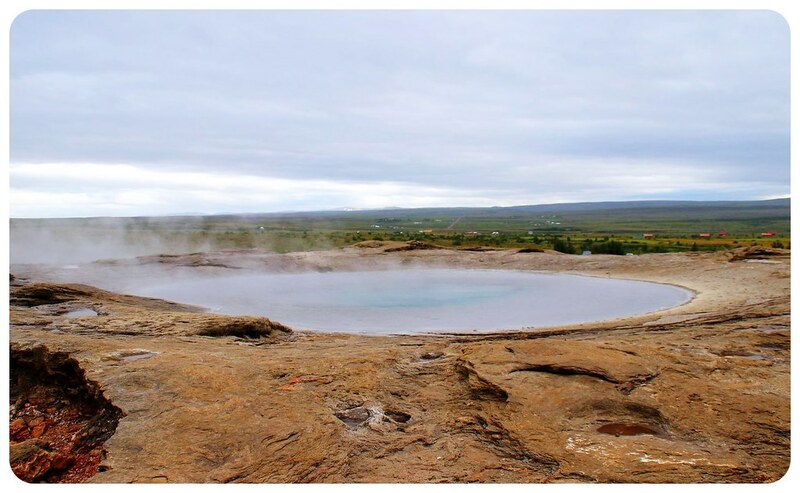 Geysir used to be the biggest geyser in the country until it suddenly stopped shooting columns of water into the air. Luckily, Strokkur didn’t decide to stop and amazes the onlooking crowds with columns of water up to 98 feet (30 meters). The spectacle happens every six minutes, and it’s a breathtaking sight. 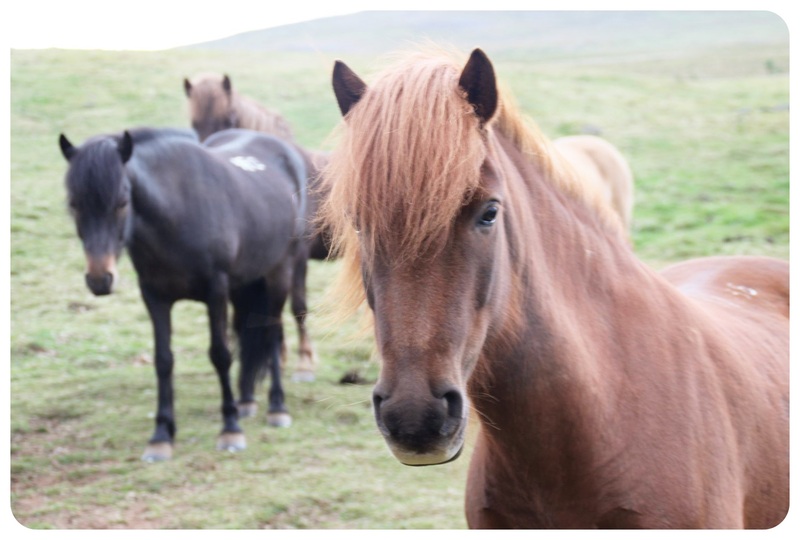 We passed several horse farms with dozens of Icelandic horses, and sometimes they were standing right near the fence, as if they were waiting for us to come pet them. And how could we not pull over to say hi to these cuties? 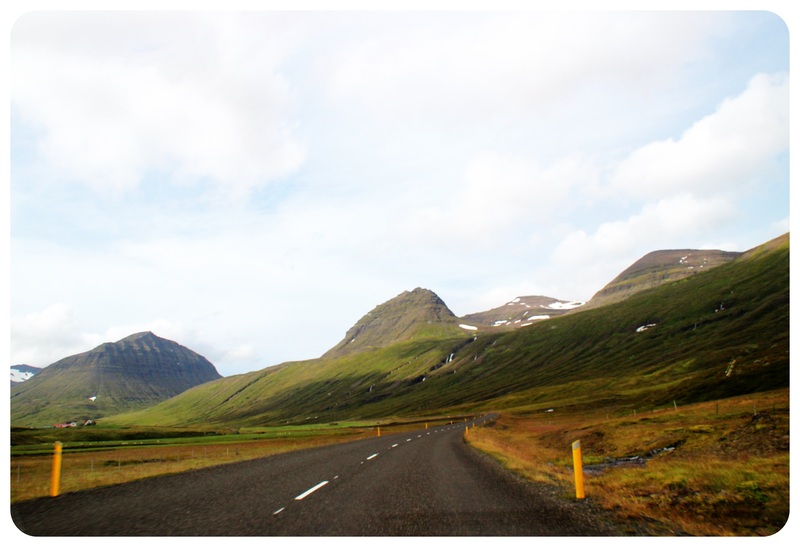 This was something that made me truly appreciate driving the Golden Circle myself instead of being ‘trapped’ on a tour bus: that we were able to stop whenever and wherever we wanted, and spend as much time as we wanted at each stop. 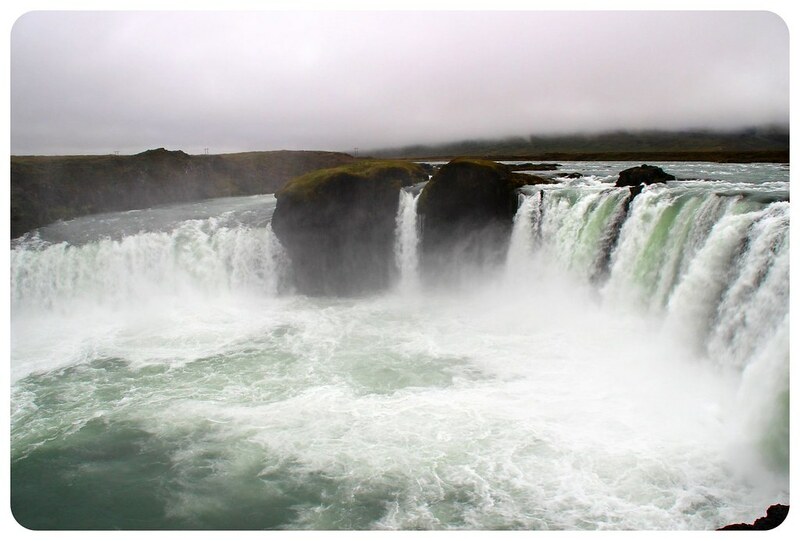 Another highlight of Þingvellir was Gullfoss, which is one of Iceland’s most popular waterfalls. Here, the Hvítá River plunges into a 105 feet (32 meters) deep crevice and creates the uniquely triangular shaped two-tiered falls. The roaring sound of the water gets louder and louder the closer you get, and you can really feel the enormous power of the falls when you are standing right next to them (plus, you were getting soaked, see picture below!). The next waterfall had a lot to live up to. 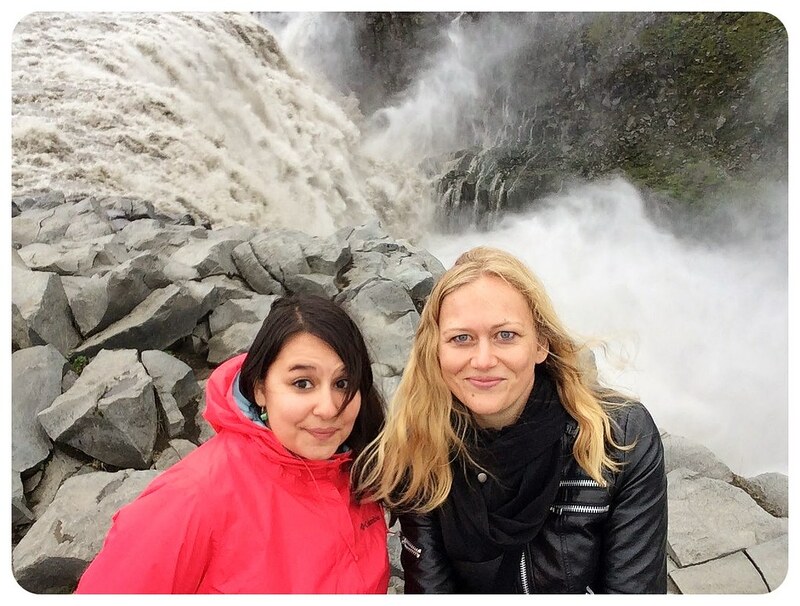 But, this being Iceland, it did meet our expectations! Our next stop was Seljalandsfoss, which rises 200 feet in the air and you can even walk behind the falls. 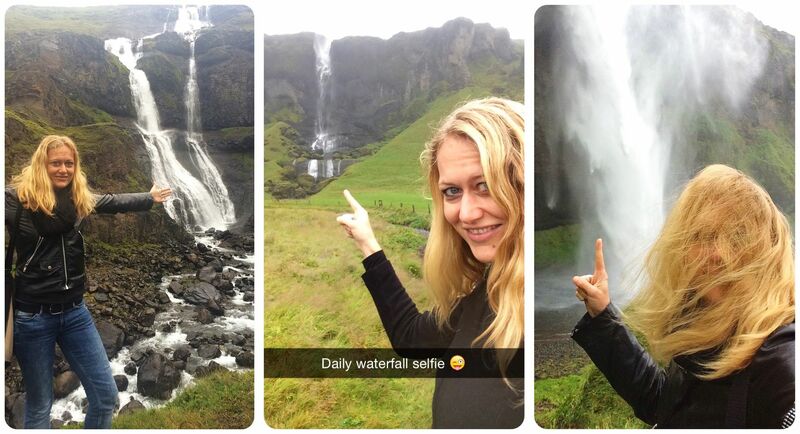 I don’t think you’re able to walk behind any other waterfalls in Iceland. I was in complete awe when I was standing behind the falls and the thick curtain of water was thundering down from a cliff right in front of me. 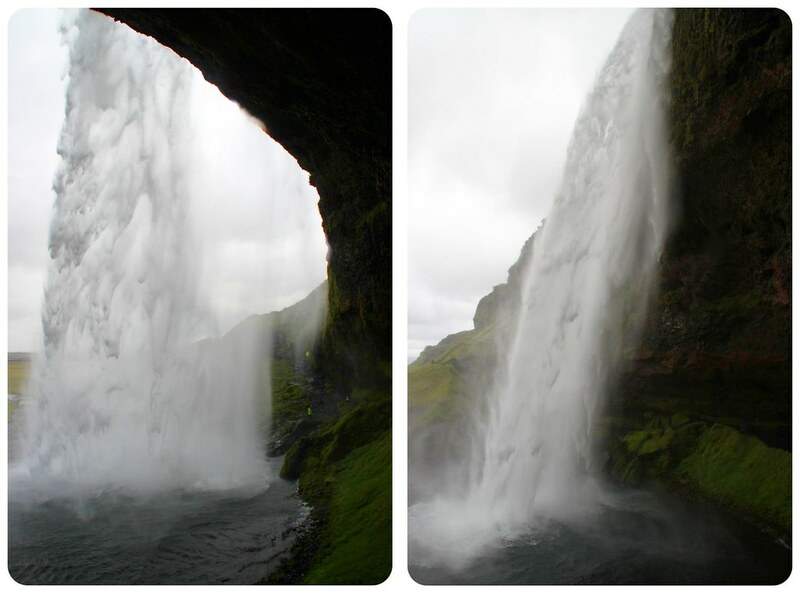 From Seljalandsfoss, we had one more waterfall on our itinerary for the day: Skogafoss. While this one is about the same height as Seljalandsfoss, it is about twice as wide and it seems more powerful. Even though we started to get tired as our first action-packed day came to an end, I am glad that we headed up the wooden stairs to see the waterfall from the top, because the views over the lush green landscape and the ocean in the distance were terrific. The last two waterfalls, Seljalandsfoss and Skogafoss, are not part of the Golden Circle, by the way. We passed them because we headed south towards Vik after visiting Gulfoss instead of circling back to Iceland. 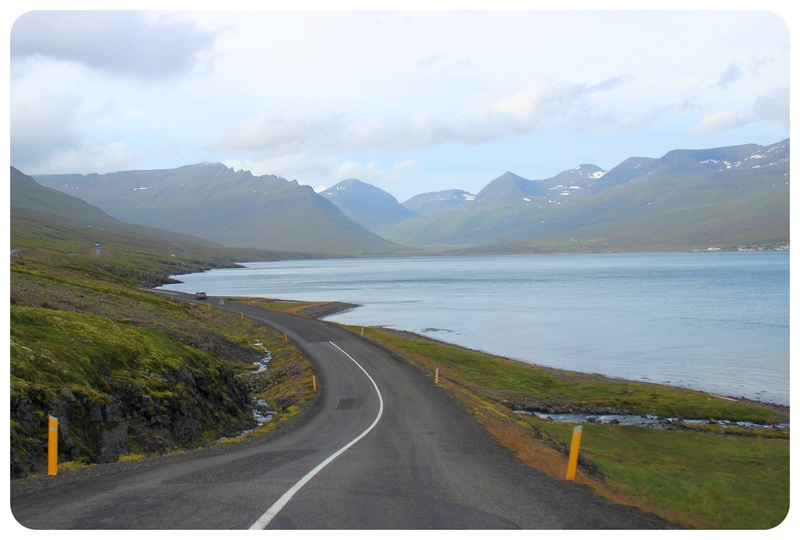 Even if you only have a short stopover in Iceland and can’t drive the entire Ring Road, I recommend this drive, no matter if you do it on an organized tour or drive it yourself. That way you can also add on Seljalandsfoss and Skogafoss like we did. 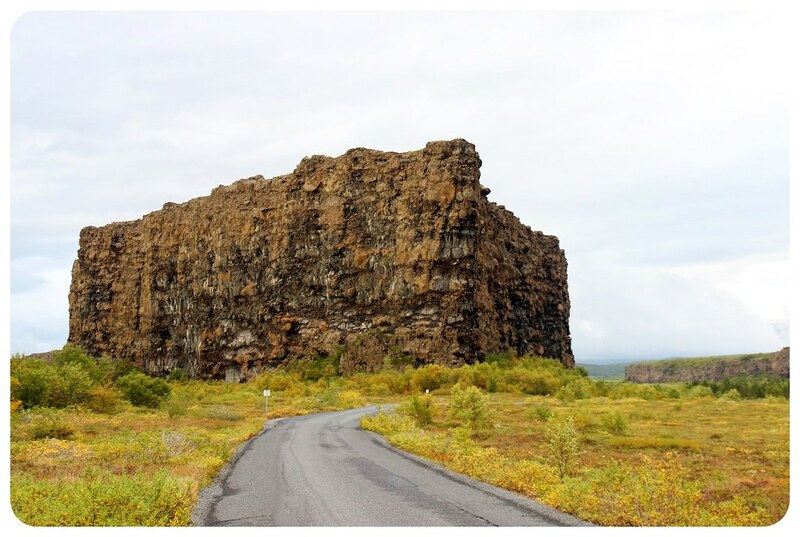 I suggest you allow at least six hours for the Golden Circle – you can drive it in less than four hours but you’ll want to stop and take photos every ten minutes or so (really, there’s a gorgeous view around every other corner!). It’s doable to also visit Seljalandsfoss and Skogafoss and then circle back to Reykjavik, but allow a full day for this trip. We ended the day with our first farmhouse stay, which was a lovely farm just off the Ring road, about 15 miles outside of Vik, surrounded by green fields and mountains. It was the perfect place to end our first day of road-tripping and to recharge our batteries before heading further east. My trip to Iceland feels almost like a dream now. 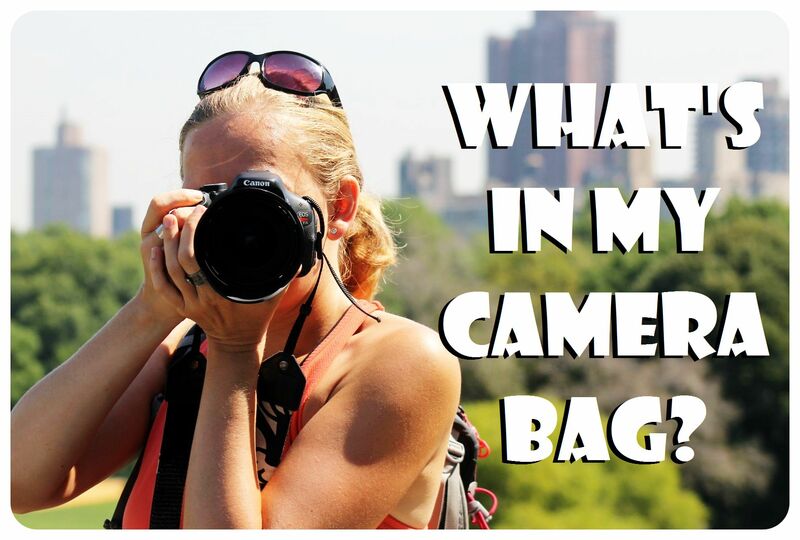 But the photos (and video!) show that it really happened – for a week, I road-tripped through one of the most fascinating places I’ve ever visited. With its surreal landscapes that often made me feel like I was on a different planet, Iceland blew my mind. Otherworldly, that’s how most people describe Iceland, and to be honest, I don’t think there is a word that fits better than this: otherworldly. 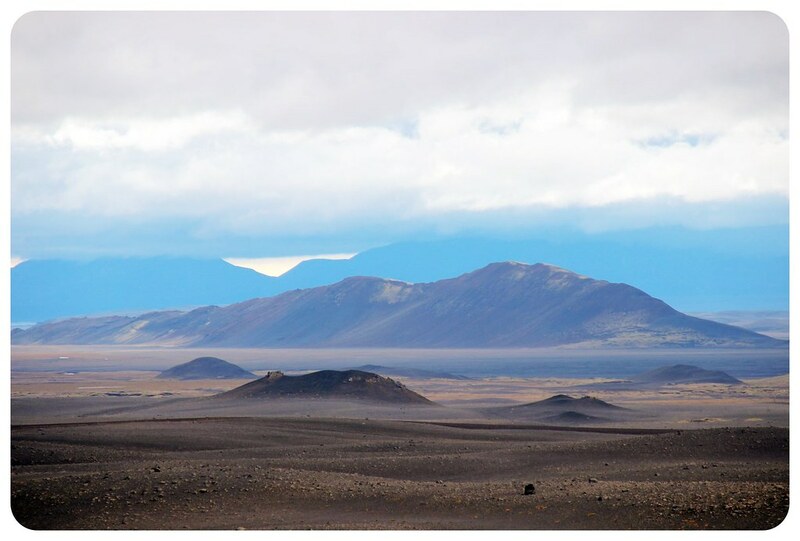 The only other place I’ve been to that I described as such were the otherworldly landscapes of Chile’s Atacama Desert, where I also came across volcanoes, a bizarre moonscape, rugged mountains amidst wide open barren lands, geysers and geothermal fields. Iceland is different though. First of all, it is called Iceland for a reason, so there was nothing of that desert heat that I experienced in Chile. And of course there is ice in the Land Of Ice – lots of it. 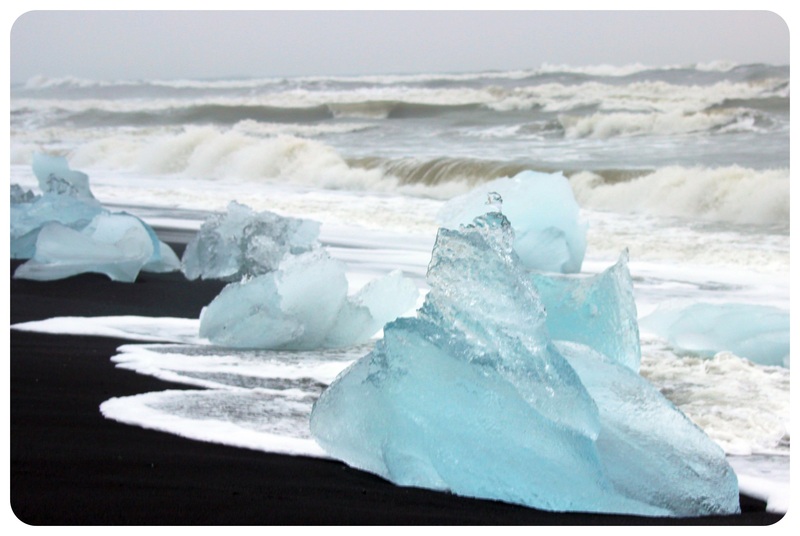 The glaciers, glacier lagoons and snow-capped peaks that we often marvelled at were a reminder that the stunning black sand beaches were deserted for a reason: it is too cold to swim in these Arctic waters. 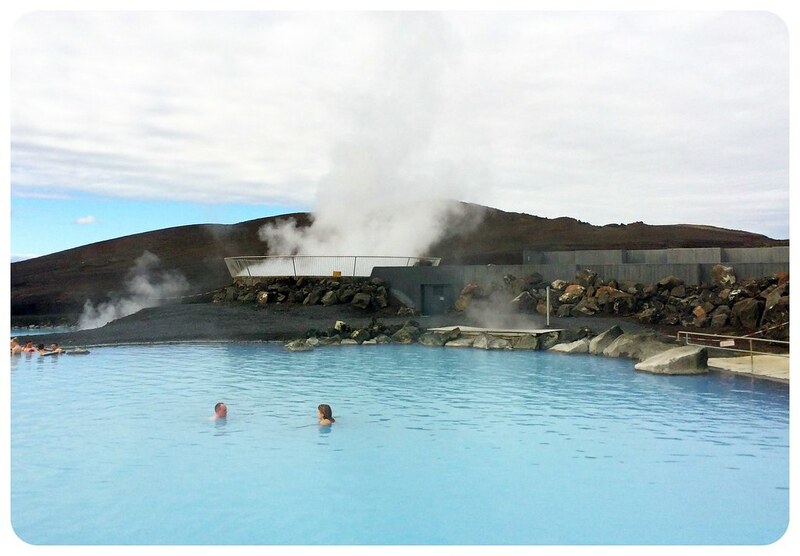 But thanks to its geothermal activity, the country is dotted with hot springs, and the best thing is that many of them are free to use for anyone. 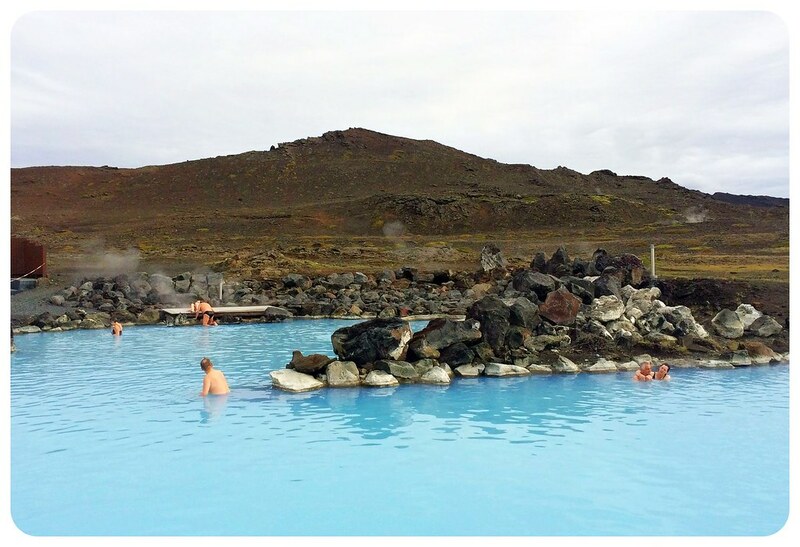 You also have hot springs with facilities and restaurants onsite, like the famous Blue Lagoon and the Myvatn Nature Baths (pictured below) in the north of the country. For seven days, Rease and I drove through Mars-like landscapes, through volcanic plains, often covered in bright green moss, over snow-capped mountains, alongside fjords – passing too many waterfalls to count! We drove on narrow, winding mountain roads, sometimes unpaved, so that we could feel the volcanic rocks crunching under the tires of our car. It wasn’t only the scenery that changed constantly, the weather changed equally as much. We would wake up to a rain storm and two hours later find ourselves taking our jackets off because the sun was shining so bright. 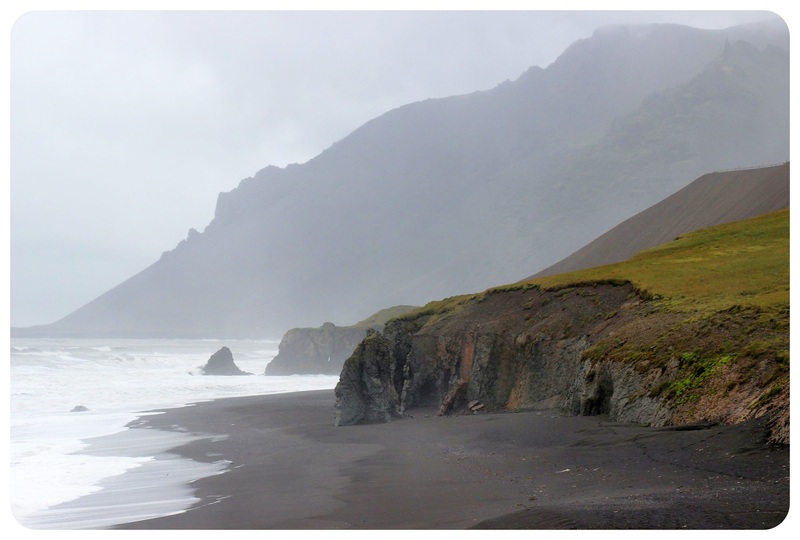 Magical is another word that is often used to describe Iceland, and as we were driving along the winding roads hugging the eastern fjords, passing black sand volcanic beaches to our right and volcanoes to our left, it did feel like a magical fairy-tale land. It wasn’t all too surprising to learn about the Huldufólk, the hidden folk (or simply elves), who play a big role in Icelandic folklore and are believed to live spread out all over the country. Sometimes you will spot little elf houses, basically miniature versions of Iceland’s colorful houses, in fields or on the side of the road – and it seems absolutely possible that little elves and fairies actually live in them. I will share more details about our road trip route and the practicalities of road tripping in Iceland in upcoming posts, but I wanted to start with some of my favorite images and the highlights of our road trip. 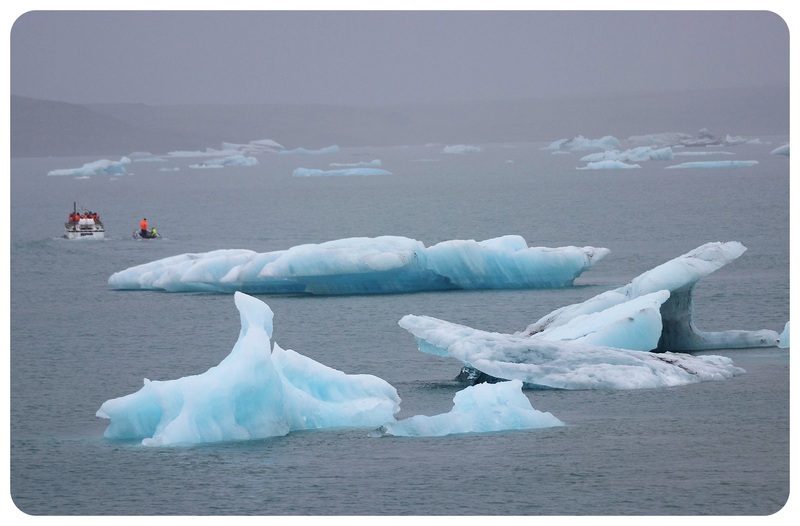 One of the most spectacular places I visited in Iceland was the Jökulsárlón glacial lake in the south of the island, which is filled with massive chunks of ice that have broken off the glacier, and slowly float out of the lagoon into the open sea. 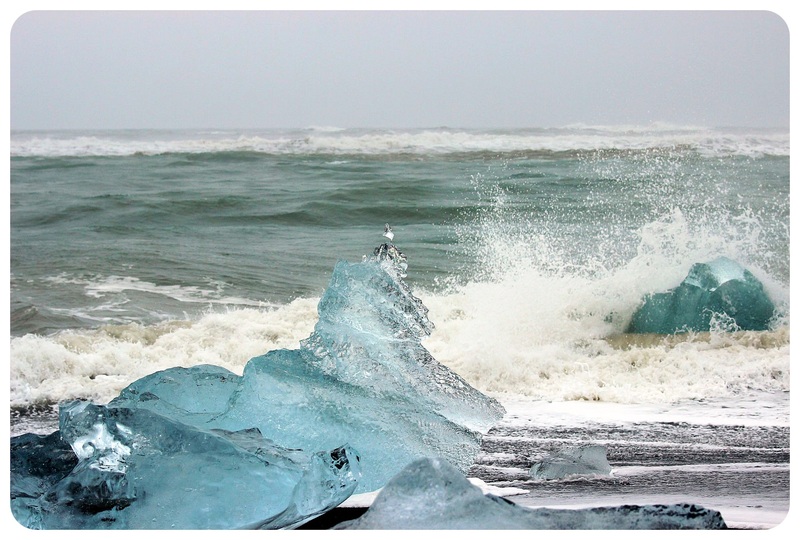 I don’t think there’s anything quite like this anywhere in the world – a beach littered with icebergs of all shapes and sizes, waves crashing against them. 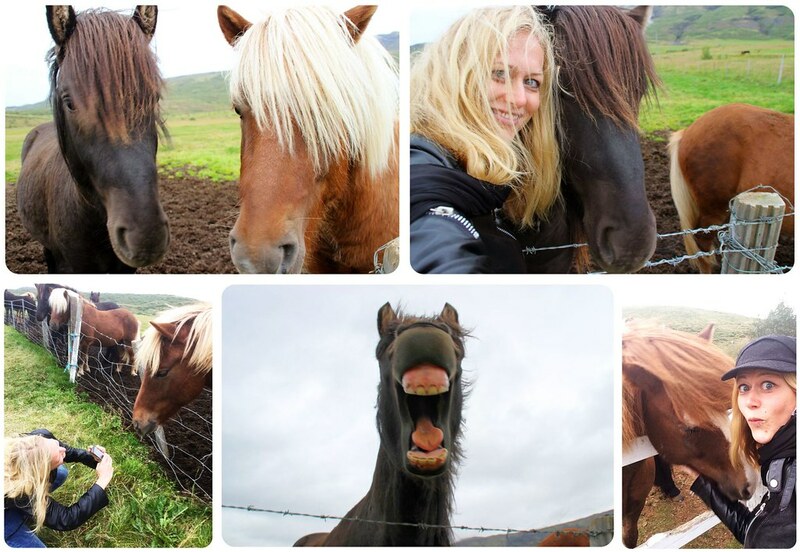 The best thing about road tripping in Iceland? The journey itself! It’s not just about the stops along the way – the drastically changing scenery never gets boring. 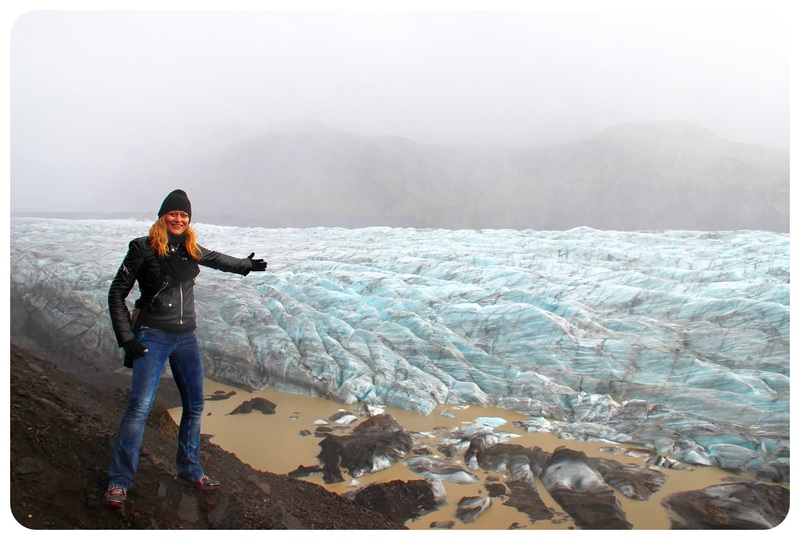 Since Iceland is such a compact country, you can find yourself hiking on a glacier, through a lava field, and behind waterfalls – all within a few short hours. 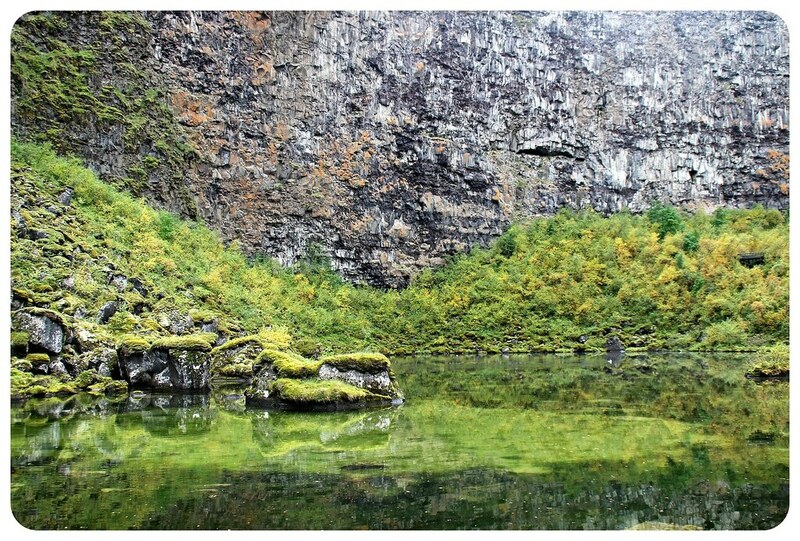 We hiked in the majestic Ásbyrgi canyon in northern Iceland, where I wished we had more time to see the canyon from the top – a stunning sight. 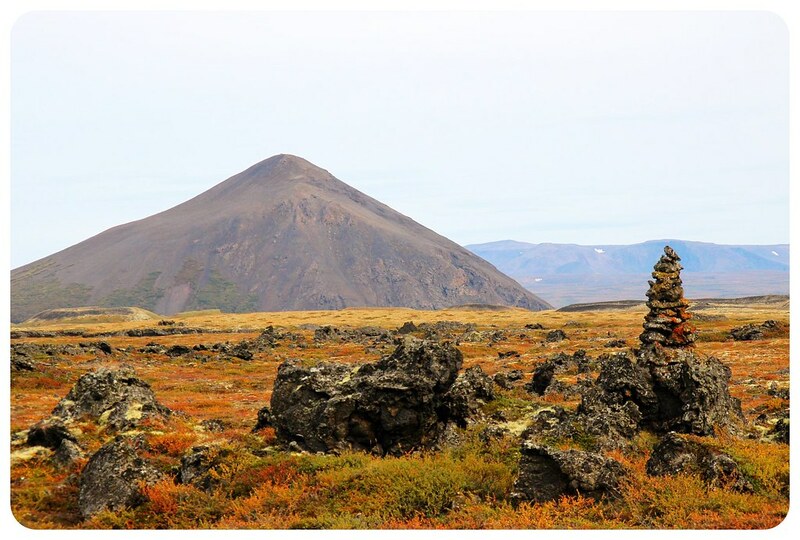 The northern part of Iceland was just as scenic as the south with mountains, lakes and volcanoes. 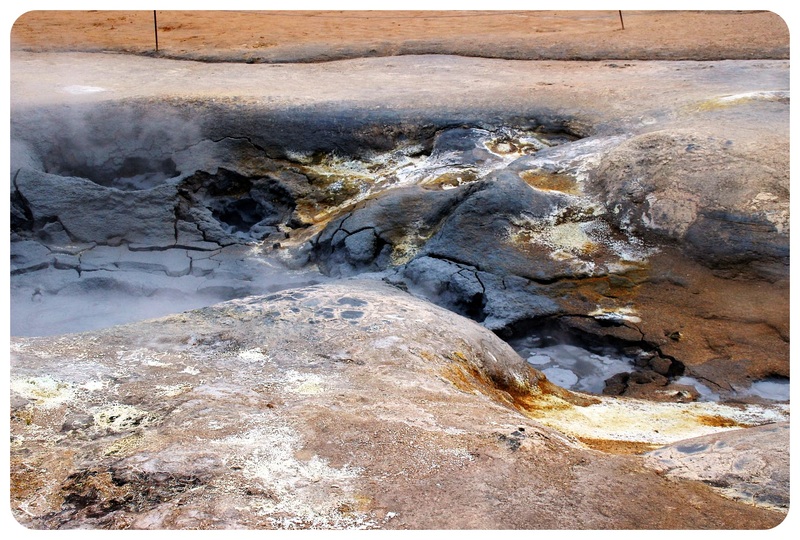 And the lunar landscapes are eerily beautiful: Seeing geysers erupt? Definitely something you don’t get to experience a lot! The geyser pictured below erupts every six minutes, and I could’ve stayed for hours watching it erupt again and again. 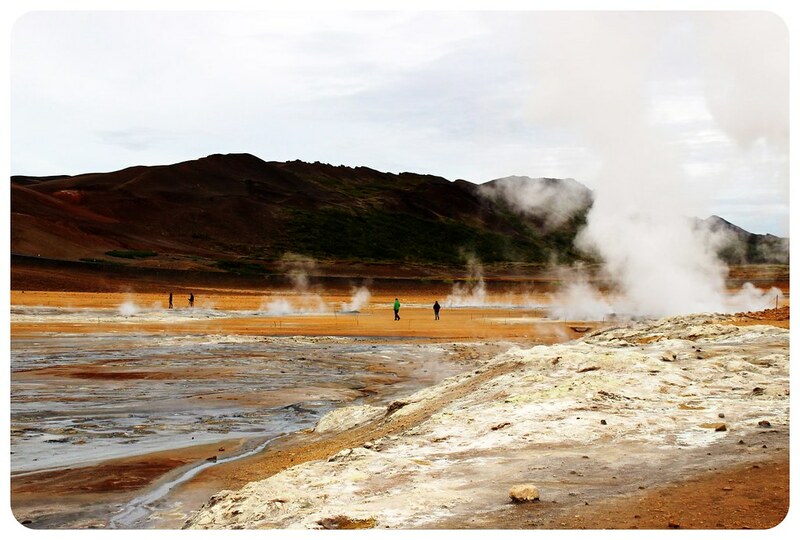 The Hverir geothermal fields were completely different than the geyser above, with boiling mud pools and some of the most intense orange colors I’ve ever seen in nature. You can see more of these enthralling geothermal fields, mounds that are topped with sulfur-coated boulders, high-pressure steam vents that are streaming thick clouds and smelly gas into the sky, bubbling mud pools – right in the beginning of my Iceland highlights video: From there, we headed to Dimmuborgir, which are vast, oddly shaped lava fields. Look at these amazing lava formations! Another highlight? 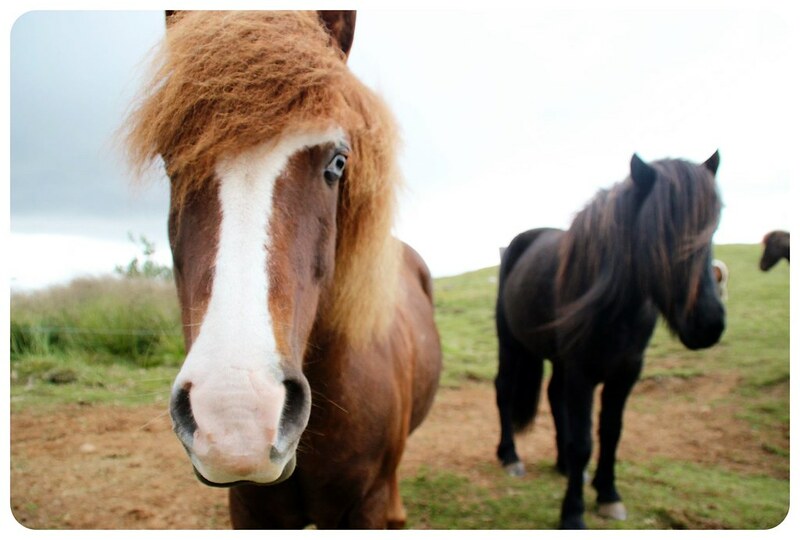 Icelandic horses of course! While I’m not into horseback riding, I had to stop several times to pet horses on the side of the road. One of the farm houses we stayed at was actually a horse farm – something this animal lover was more than happy about. 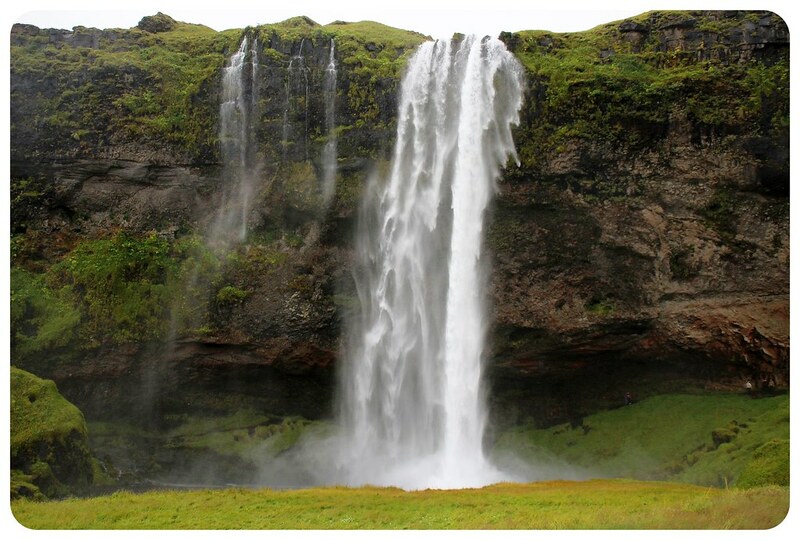 Iceland has an unusually high number of waterfalls, considering how small the country is. This is due to its location – being in the North Atlantic brings a lot of rain, and being so close to the Arctic created many glaciers. These glaciers melting, plus all the rain water, means not only lots of waterfalls, but also very powerful waterfalls – Dettifoss is in fact the most powerful waterfall in all of Europe. I wish I could include a photo of the northern lights, because the night we saw them was definitely a highlight of the trip, but in my excitement about seeing these unique green lights dancing in the sky I managed to break my tripod while setting it up. I guess that’s another excuse to go back to Iceland! 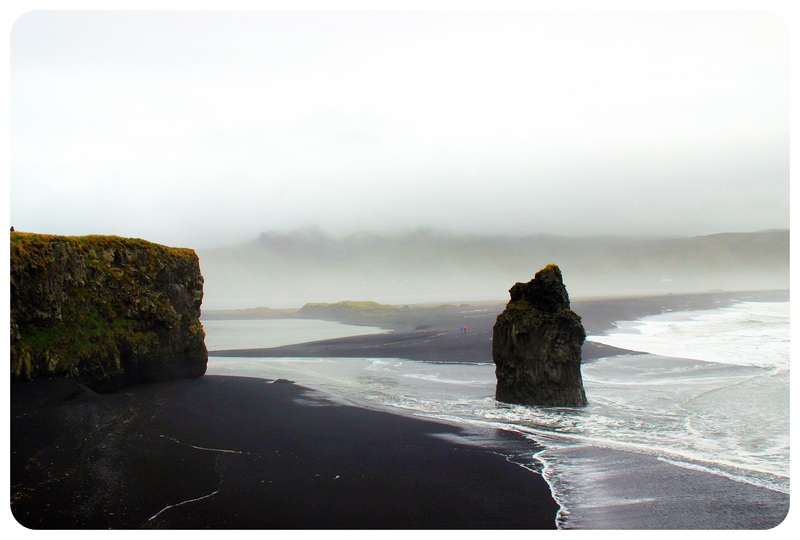 Iceland being an island means that it is blessed with thousands of miles of dramatic coastline – 3,088 miles (4,970km) to be precise. 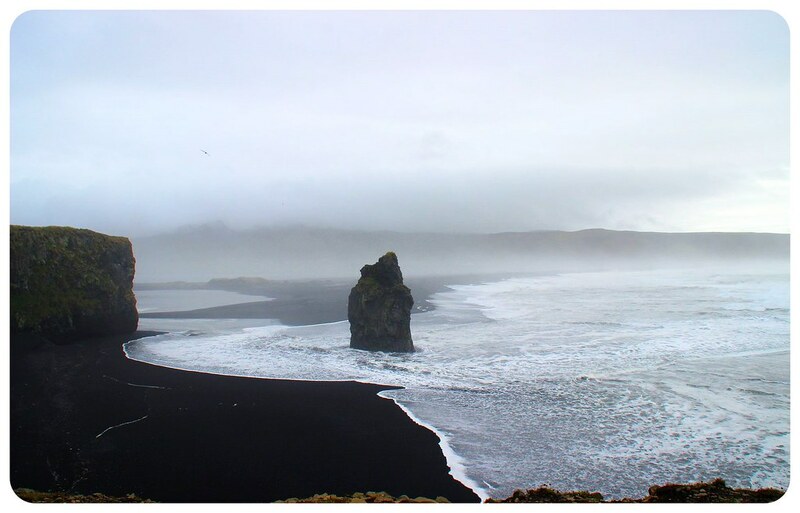 The black sand beaches (which are volcanic ash, not sand) never failed to impress. Fjallsárlón is a smaller glacier lagoon, not far from Jökulsárlón, but with less tourists! Despite braving a rain storm during our visit, it was one of the most remarkable places we stopped at. 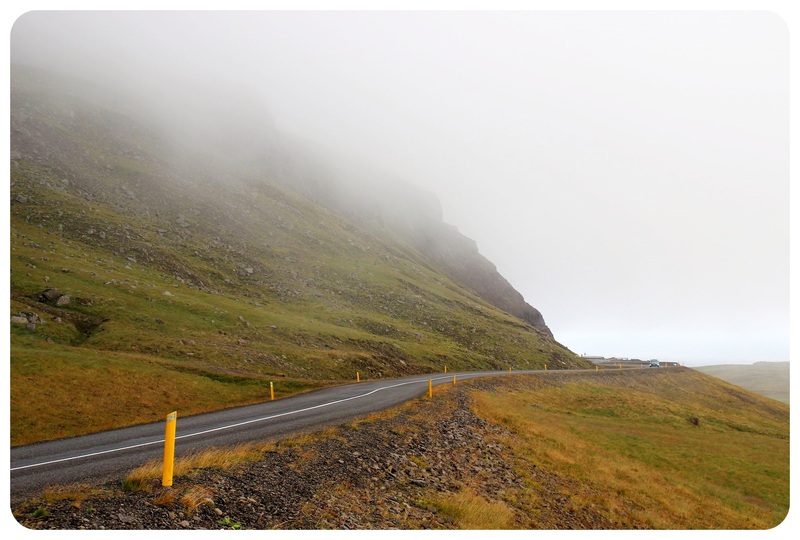 All images were taken on the Highlights Of Iceland self-driving tour. 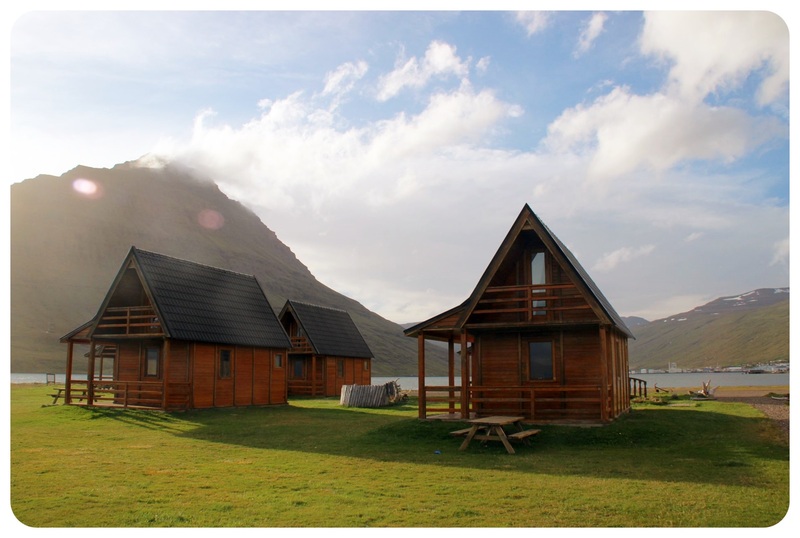 Icelandic Farm Holidays provides you with a rental car and an itinerary for every day, but you can decide individually how much time to spend in each suggested stop, or add additional ones. 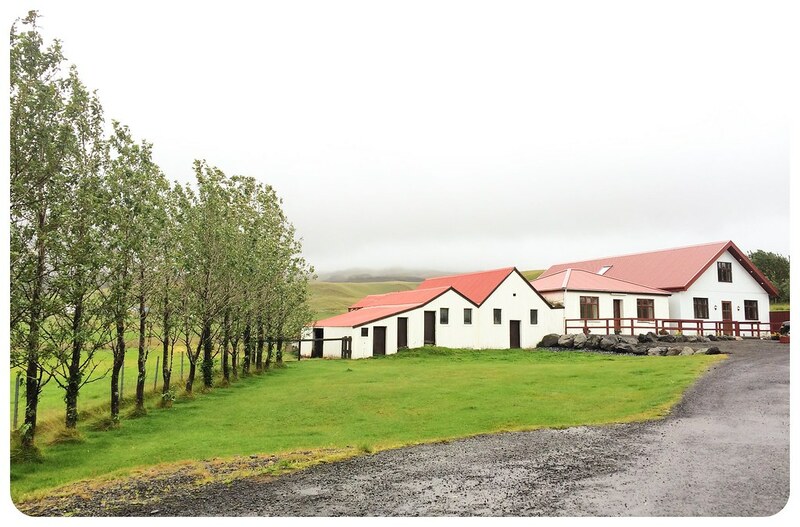 Accommodation is provided in a mix of Icelandic farm houses, B&Bs and hotels. 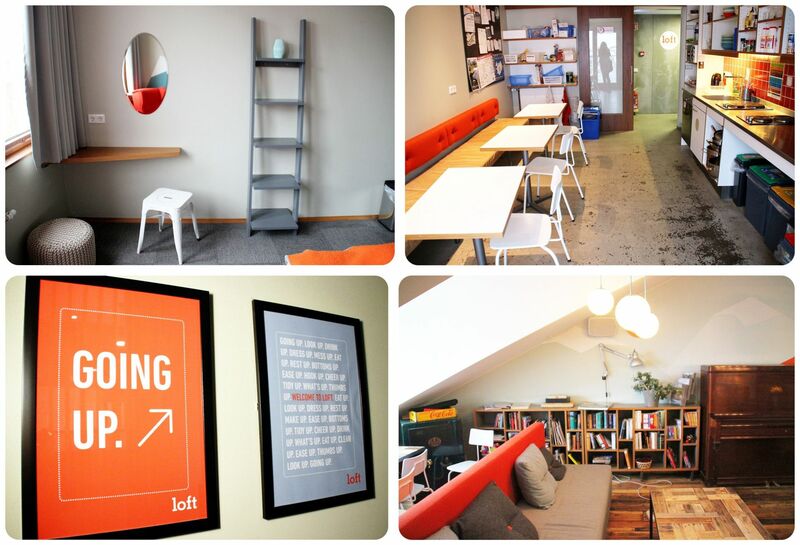 When I researched places to stay in Reykjavik, one of the first places I came across was the Loft Hostel. It was one of those hostels where I knew right away: that’s where I wanted to stay. The pictures of the rooms looked amazing, the location was excellent, customer reviews were great. But only because a place looks good on paper doesn’t mean that it really is great – there’s still the chance that something is missing, the vibe’s not good, or service has just gone downhill. 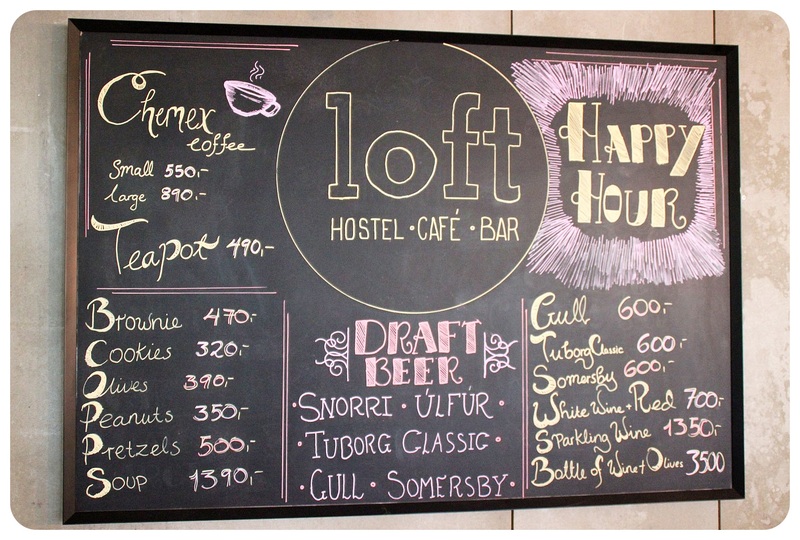 As soon as I arrived at Loft Hostel and stepped into the busy top-floor bar, I was relieved to find out that my doubts had been completely unfounded and that I didn’t have to worry about anything. The reception, located on the fourth floor of the building, is right next to the common area, which was filled with people when I arrived at night, travelers who were sharing stories over happy hour beers. The lively atmosphere pulled me in immediately, making me want to join in instead of crashing in my room after a long day of travel. The deluxe private room I was sharing with Rease was fabulous – I loved the modern artwork on the walls, which is such a simple way to pimp up a room, and yet many hostel rooms still have bare white walls. An extra armchair and a small desk made the room more livable and added to the cozy atmosphere. The desk actually got some use, since the wi-if worked perfectly in our room (as well as in the communal loft on the top floor). But my favorite part? The bed! Our double bed was so comfy that I was tempted to stay in bed the next morning when I woke up to rain. I did eventually get up though, because my tummy was tumbling and I had read that the hostel breakfast was excellent value for money – of course I needed to find out if that was true. 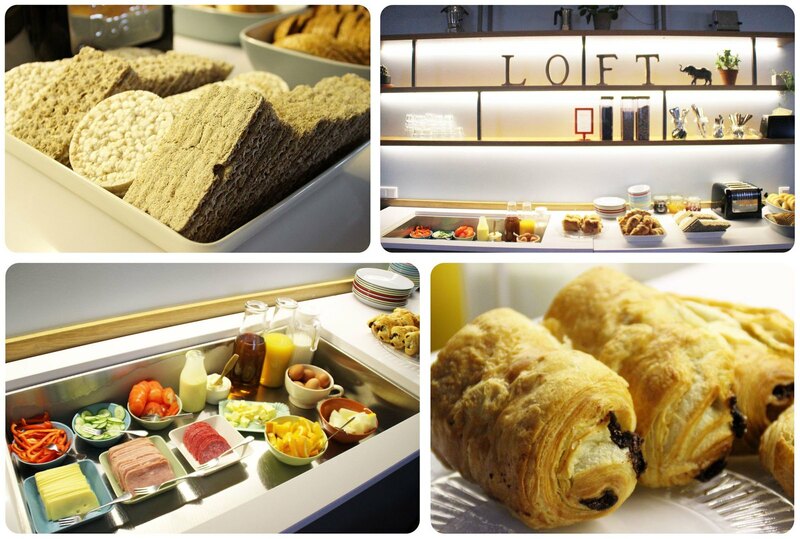 And yes – the breakfast was definitely worth every cent, or every single one of the 1,550 krona (US$11.86) I paid for it. If this number seems pricey to you, wait until you get to know prices in Iceland – it’s not necessarily a bargain country. We were able to load up our plates as often as we wanted, and the breakfast buffet included several breads, bagels, cheeses and cold cuts, yogurt and cereal, fresh fruit and unlimited coffee and tea. Plus – and this alone was so worth having breakfast – fresh chocolate croissants which were heavenly. For more budget-conscious travelers the hostel has a fully equipped kitchen, with spices and condiments and leftover foods from other travelers – definitely one of the cleanest and best equipped hostel kitchens I’ve ever seen. 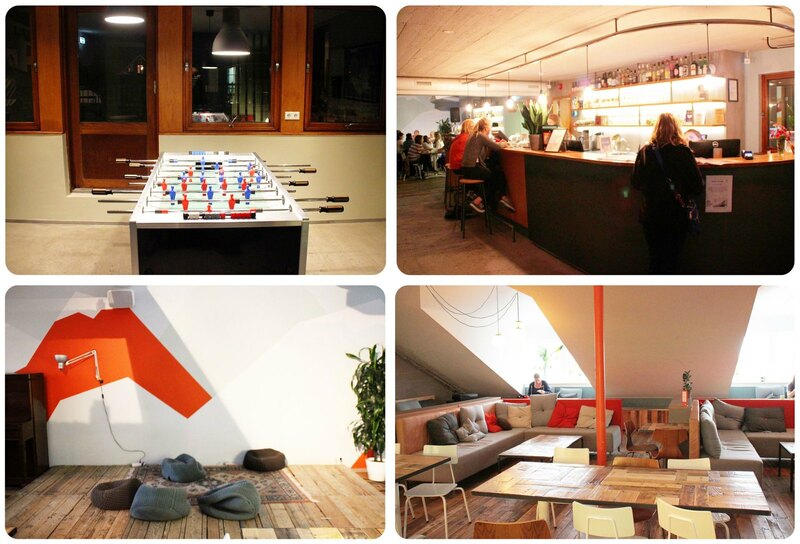 While the lounge was rather quiet during breakfast, it really comes to life at night when everyone gathers up here to mingle and meet new people, and the hostel makes you want to hang out up in the loft, providing comfy couches, lots of tables, and even a projector to show movies. I wish it would have been a bit warmer so that I could have taken advantage of the rooftop terrace – but that’ll have to wait until my next visit. This time around, I got to take advantage of one more great feature of the hostel though: its prime location. 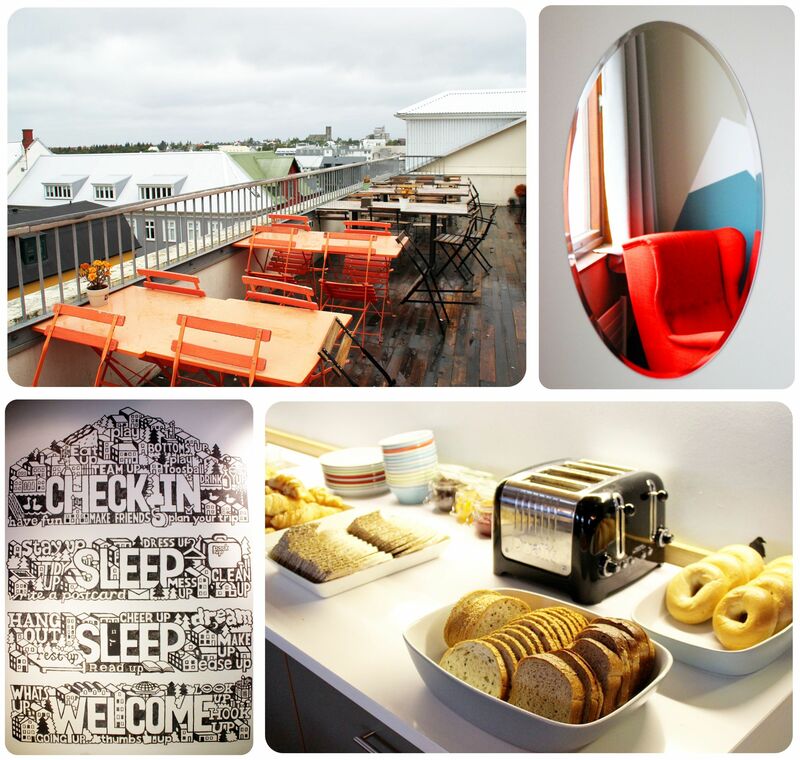 Located right on Laugavegur, the main street in downtown Reykjavik, lined with shops, bars and restaurants, I couldn’t have asked for a better location. Within a few short minutes you reach Reykjavik’s famous Hallgrimskirkja church, the Sun Voyager sculpture & viewpoint, the concert hall and souvenir shops as well as grocery stores. I thought that parking in such a prime location might be a problem, but given that Reykjavik is tiny (at least for a capital) with only 120,000 people, I was able to find parking right around the corner. And if you need anything in particular, don’t hesitate to ask at reception – I found everyone I encountered at the check-in desk to be incredibly helpful and friendly. 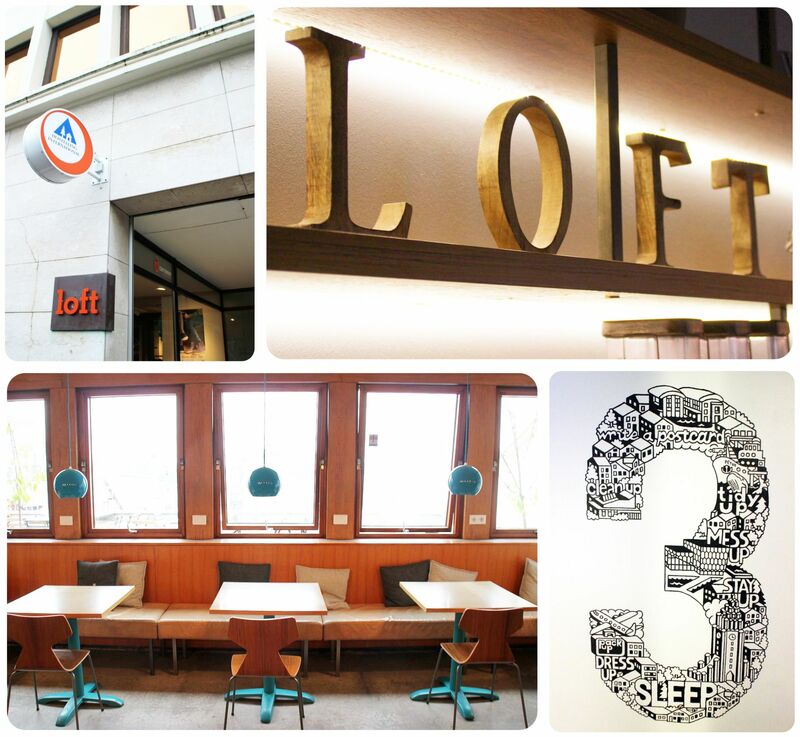 Overall, the Loft Hostel was exactly the hostel experience I love: comfortable, social and friendly, with all the amenities I could possibly ask for. 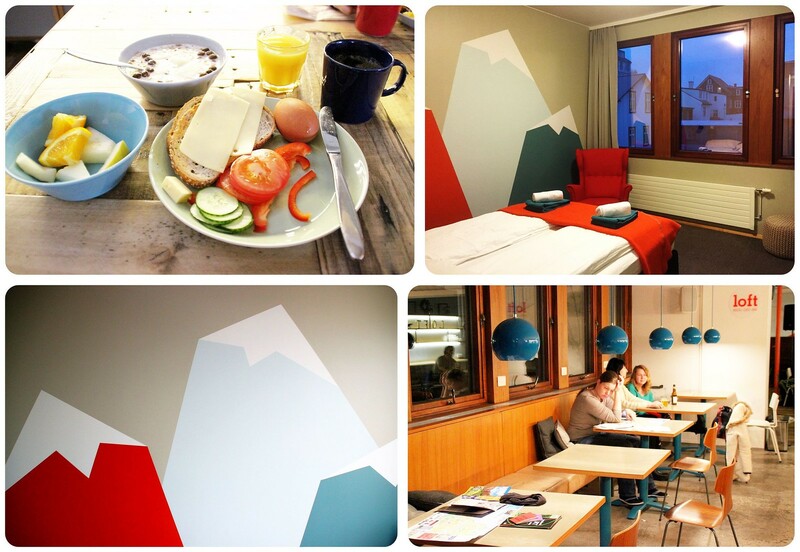 Thumbs up for the Loft Hostel in Reykjavik ! Oh, Iceland! Picking just ONE image for this week’s Polaroid out of the 1,500 photos I took during my week-long road trip around Iceland was such a difficult task – it was nearly impossible to narrow it down to one single photo because Iceland is so photogenic; there is a photo-worthy landscape / waterfall / geyser / coastline / glacier around every corner. 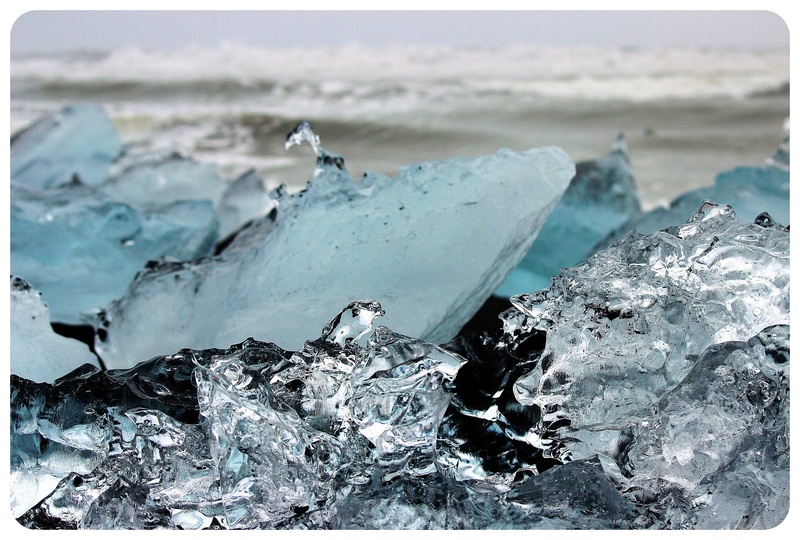 I finally selected an ice-y photo – it is the Land Of Ice, after all, but I can’t wait to share all the other breathtaking Icelandic landscapes with you. Circling the entire island on the Ring Road for a week was an ambitious undertaking but I am glad that my travel buddy Rease and I got to see so much of Iceland and were able to take in the entirety of the country’s diverse scenery, even though it meant spending a lot of time in the car. It’s impossible for me to pick a favorite place – every day we passed picture-perfect spots, were ooh-ing and aah-ing about the views ahead of us, the gushing geysers and the roaring waterfalls. That said, seeing the Northern Lights was without a doubt a major highlight for me, since this was something I’ve had on my travel wish list for a long time, and so when the skies finally cleared up after a few rainy and cloudy days and the Aurora Borealis appeared, I was in absolute awe. Another highlight was the Jökulsárlón Glacier lagoon in Southern Iceland, a lake filled with massive ice blocks that break off the Breiðamerkurjökull glacier and slowly float down towards the southern end of the lake, which opens to the ocean. 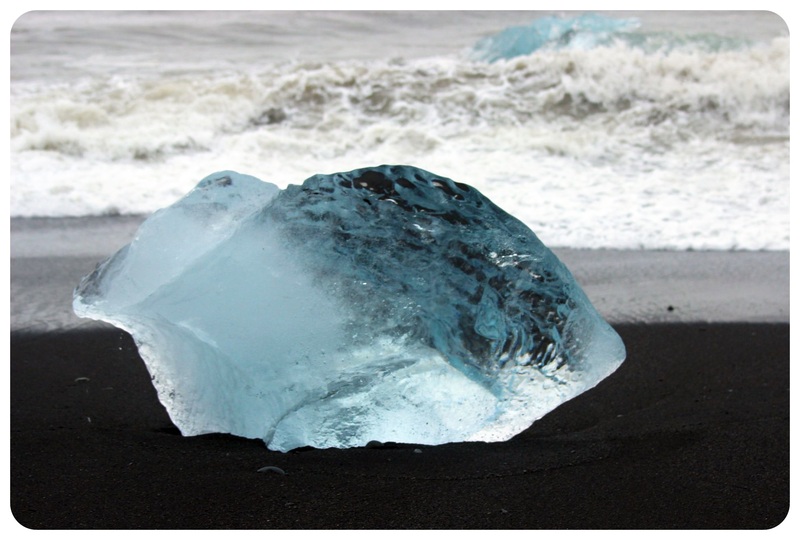 The ice chunks that float into the ocean are often washed onto the shore, resulting in a bizarrely beautiful ice beach (I posted more photos of it on Facebook), something I had never seen before and I am not sure if there’s another place in the world where ice washes ashore like this (if you know of one, let me know!). If you’re thinking about heading to Iceland, you can see my exact Iceland road trip itinerary here. For more of my Iceland photos, check out my Instagram gallery.